The PT-76 is an amphibious light tank, first entering service in the Red Army and Soviet Naval Infantry in 1952 and serially produced until 1967, when it was largely replaced by the much more flexible BMP-1 infantry fighting vehicle. 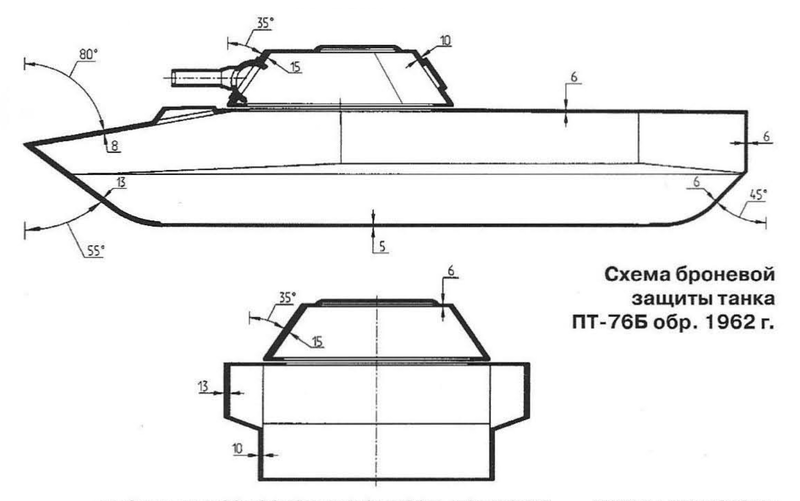 The PT-76 is notable for being the first light tank in the world to be designed as an amphibian, featuring a very large and mostly empty hull for buoyancy and an innovative water jet propulsion system. 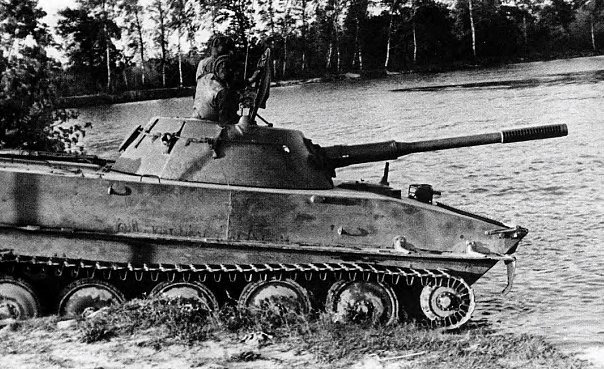 Originally intended for advance patrols in Red Army tank battalions, the Soviet Navy took an interest in the PT-76 during its development, and went on adopt it for their Naval Infantry as a beach assault vehicle. Although the amphibious tank was withdrawn from Army service long ago, modernized forms of the PT-76 continued to serve in Naval Infantry tank battalions up until the late 2000's, albeit in a very limited capacity. They are currently being replaced by the BMP-3F, but the replacement is moving along at a very slow rate. When used for reconnaissance, the PT-76 would move ahead of the main force - either a tank or motorized infantry division - and carry out forward reconnaissance, and if it encounters resistance, it would fulfill the duties of medium tanks when none are presently available. 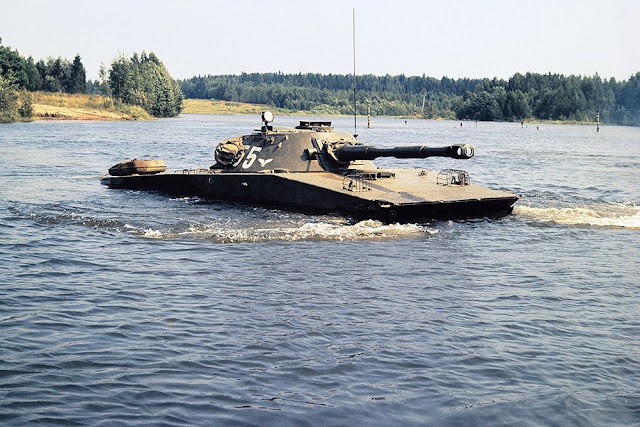 Because of the abundance of lakes, rivers and waterlogged swampland in Eastern and Central Europe, the PT-76 should, in theory, have plenty of opportunities to exploit its amphibious qualities while the main force was still preparing to cross these types of obstacles. If nothing else, the PT-76 could swim very well indeed. The PT-76B was formally adopted in January 10, 1958, but mass production only commenced in 1959 and continued until 1967. Production of the original model began in 1952 and ended in the first half of 1959, just seven years later. During its production run, 1,896 PT-76 tanks were manufactured. 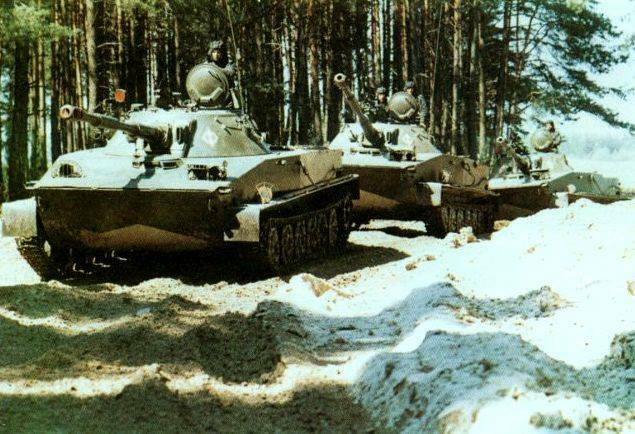 Production of the PT-76B model commenced in 1959 and ended 1967, 1,143 tanks were produced. Special thanks to Sean Murphy for providing excellent photos from his personal collection. The commander of the PT-76 resides in the turret alongside the loader. He normally enters the truncated cone-shaped turret through the large rectangular hatch which dominates the turret roof, but he has his own personal rotatable cupola and hatch. 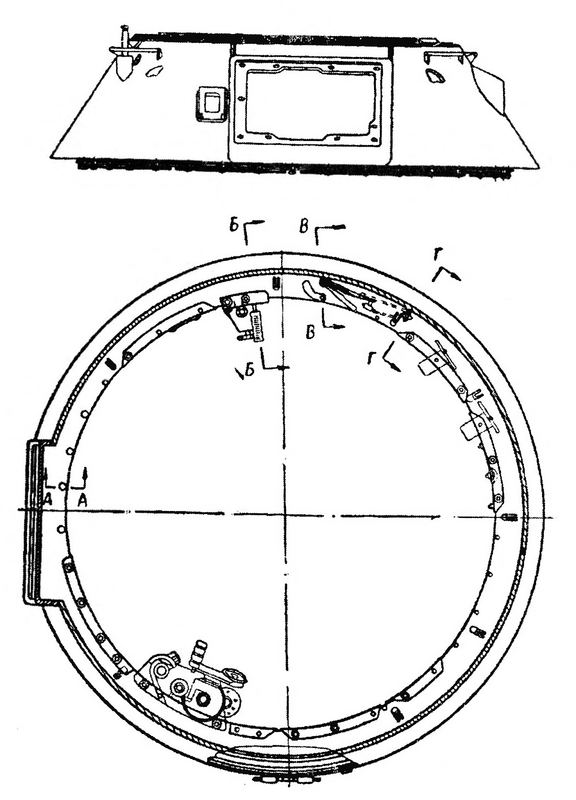 The hatch gives him the option to survey the battlefield from outside the turret without needing to open the large main hatch, as doing so would not only drastically increase the size of the tank's silhouette, but the movement would be more visible to an enemy observer at long distance. 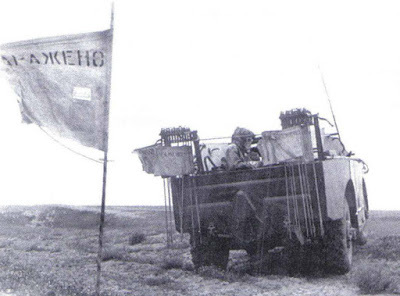 The photo below shows the commanders of a column of marching PT-76s sitting atop the turrets of their tanks, protected from the front by the hatch. The hatch is only 6mm thick, but it is enough to shield the commander from sniper fire coming from distances of several hundred meters. Ideally, the commander would expose as little of his head as possible while looking through his binoculars over the tip of the hatch. Since the hatch is part of the rotating cupola, it can also be rotated to give the commander protection from whichever direction he chooses. The size of the main hatch is exceptionally useful for a quick escape if the tank were to be knocked out, on fire or otherwise inoperable, but the heavy weight of the large hatch makes it difficult to open if both of the crew members in the turret are injured. Nevertheless, available information indicates that the turret was given a large hatch so that the crew could quickly evacuate a sinking tank while wearing the standard emergency bulky breathing apparatus, so it was probably quite justified. The turret ring of the PT-76 turret is 1,800mm in diameter. Considering that the armour of the turret is very thin and that the tank is equipped with only a medium pressure 76mm gun, the two men in the turret are quite well accommodated. For comparison, the T-34-85 had a 1,600mm turret ring and seated three men with an 85mm gun while the T-54 had a 1,825mm turret ring and seated three men with a 100mm gun. The PT-76 surpasses both of these medium tanks in this respect and is also more spacious than the M4 Sherman which had a 1,750mm turret ring and seated three men with a medium pressure 75mm gun. Aside from shooting and commanding the tank, the commander is also in charge of the single 10RT-26E short wave radio set placed on the left side of the turret. The radio is designed to operate in the 3.75-6.00 MHz frequency range. The 10RT-26 and 10RT-26E were the standard radio systems for Soviet armoured vehicles built during the late 40's, but by the early 50's, the series was rendered obsolete by a new government decree allocating the 20.0-22.4 MHz frequency range for the exclusive use of tank radios. The whip antenna for the radio is installed on the turret wall, to the right of the intercom relay box and to the left of the turret traverse flywheel, as you can see on the upper left corner of the photo below. When the tank is moving, the whip antenna is retracted to the minimum 1 meter length and the radio has a range of between 7 to 15 km, but when the tank is stationary and has the whip antenna extended to its full length of 4 meters, the radio has a range of between 9 to 20 km. The production of the 10RT series of radios ceased entirely in 1956, and in 1957, a modernization programme was carried out to replace the 10RT-26E with the newer the R-113 "Granat" radio set and its accompanying power supply. The programme ran in parallel with similar programmes for tanks like the T-54 and T-10 that have been ongoing since 1954 to standardize the R-113 among all armoured combat vehicles in the Red Army. 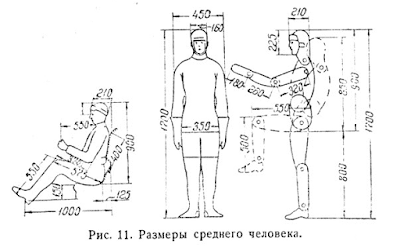 The R-113 belonged to the first generation of Soviet tank radios designed in the post-war era. It operates in the 20-22.375 MHz frequency range and has a maximum range of 20 km with the whip antenna extended, reduced to 8-12 km in the presence of noise and 10 km in the presence of jamming. In 1967, the latest batch of PT-76B tanks were produced with new R-123 "Magnoliya" radios, and a modernization programme was initiated to equip older PT-76 with the new radio system during scheduled overhauls. 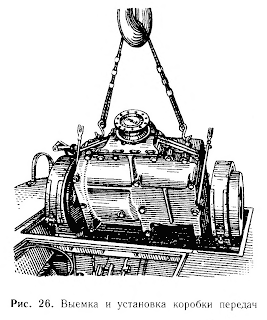 To save room, the radio and accompanying power supply unit are not installed directly on the wall of the turret, but suspended in brackets beneath the turret ring as depicted in the drawing above. 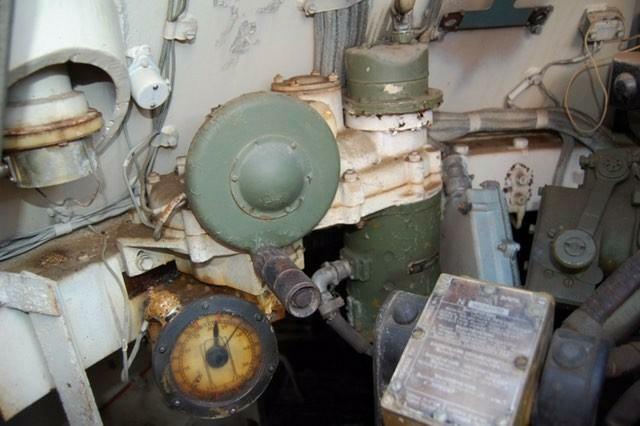 With these two bulky pieces of equipment absent from the turret wall, the only pieces of equipment that can be found at chest level of the commander are the intercom relay box, antenna tuning box, turret azimuth indicator and turret traverse mechanism. The mounting bracket for the R-113 and the accompanying BP-2A power supply unit is shown in the first photo below. 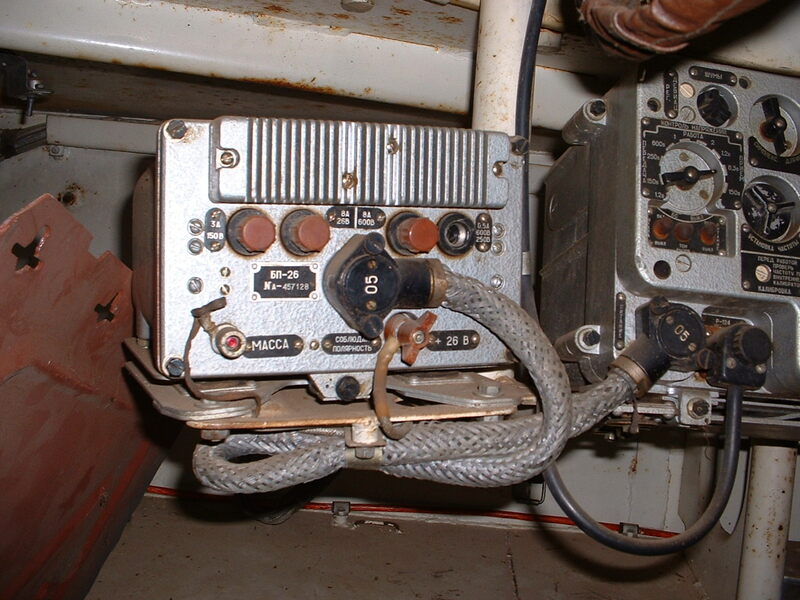 The second photo shows an R-123M radio and its accompanying BP-26 power supply unit. Due to various modernization programs over the years since the introduction of the PT-76, it is extremely difficult to find an example equipped with the 10RT-26E radio and its proprietary power supply unit, but it would have been mounted in the same way as the later R-113 and R-123. The other silver-coloured box is the frequency tuning box for the antenna. The R-113 and R-123 have proprietary tuning boxes. The commander has two TNP-B general vision periscopes and one TPKU-2B binocular periscope installed in his cupola to cover a forward 120-degree arc. 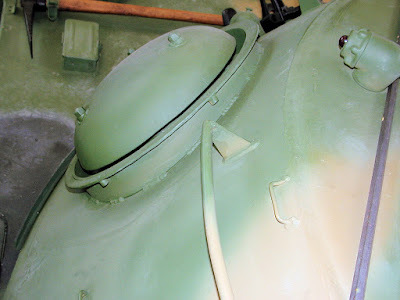 Unlike a T-34-85 or T-54 style cupola with a half moon hatch and periscopes in a fixed roof, the cupola on the PT-76 has all of its periscopes installed in the one-piece hatch. The cupola is rotatable, thus giving him a full 360-degree view of his surroundings. 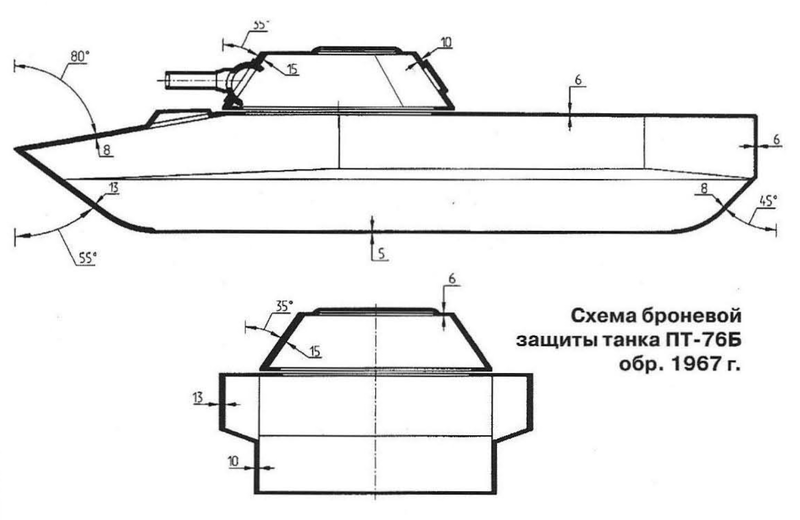 It needs to be emphasized that the PT-76 was designed to be an amphibious tank first and foremost. Its role as a reconnaissance vehicle for the ground forces was more of an afterthought than a part of the initial requirements for the design. 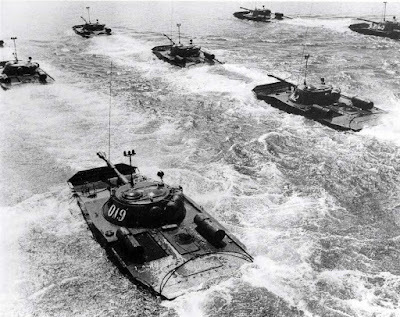 According to Baryatinsky, the thinking behind its use as a reconnaissance tank despite the poor optimization of its design was because light amphibious tanks were typically used for reconnaissance as a rule of thumb according to traditional Red Army doctrine from the 1930's. It's easy to see why this doctrine did not fit well with the design of the PT-76; the light amphibious tanks deployed by the Red Army back then were the T-37 and its derivatives - very small, very light, armed only for self defence and crewed by only two men. The PT-76 is not only larger than the T-54, but also slower because of its underpowered engine and unsophisticated clutch-and-brake transmission. In terms of overall visibility and amenities for observation while under armour, the PT-76 loses out to the majority of armoured vehicles in the Red Army arsenal. In fact, some tanks like the T-10 and T-10A had almost twice as many observation devices as the PT-76, and the common T-54 medium tank had three or four more observation devices, depending on the variant. 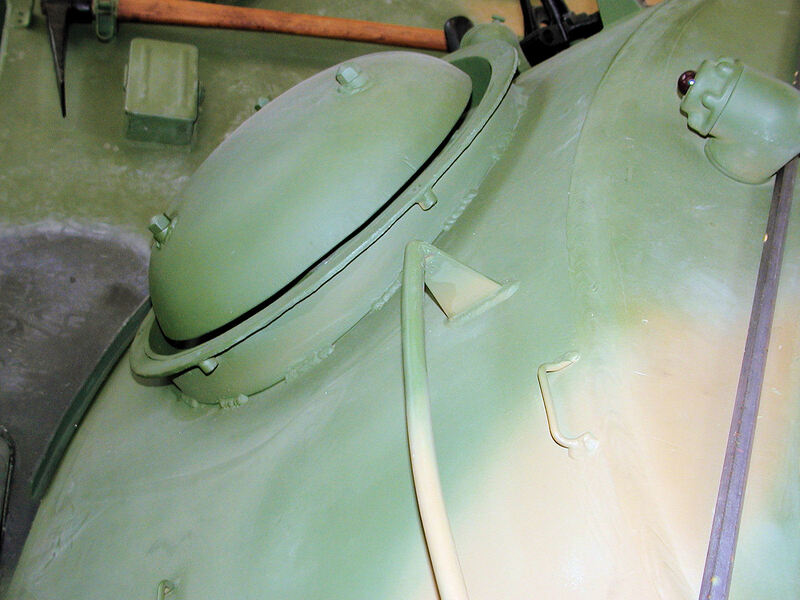 The combination of two general vision periscopes and one binocular periscope is one thing in common between the PT-76 and the T-54, but the T-54 has two additional periscopes embedded in its hatch covering its rear quadrants. To be fair, the commander of a PT-76 is also responsible for manning the gunsight, and that grants him an additional observation device, but he still lacks the MK.4 rotatable periscope that was present in earlier T-54 models for the gunner (before it was replaced with a night vision sight). All together, the surveillance capabilities of the PT-76 are not only quite lackluster but also inferior to its land-bound counterparts. It goes without saying that the commander's cupola of the M41 Walker Bulldog beats the cupola of the PT-76 easily in this respect, not to mention the fact that the M41 has a three-man turret and carries a large amount of radio equipment. This is because the M41 was designed to be a reconnaissance vehicle from the very beginning. Unlike the BMP-1 that replaced it, a specialized reconnaissance model of the PT-76 was never developed. The tanks that were used in the reconnaissance role were not supplied with special surveillance devices, so the crews had to rely exclusively on the basic equipment that came with the tank. Needless to say, the PT-76 was simply not ideal for this particular role. The BRDM-1 was far more suitable for reconnaissance. 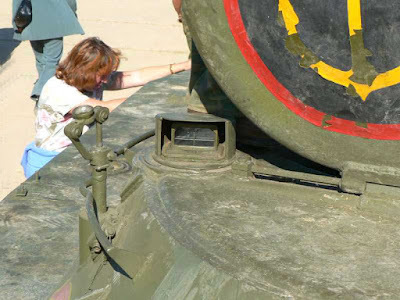 The TPKU-2B binocular periscope is fitted on the PT-76B as well as later variants of the PT-76. The TPKU-2B was used in the T-54B as well as other Soviet armoured vehicles since it was the latest device of its type during the late 50's, but the variant used in the PT-76 is different from the one in the T-54B. The variant used in the T-54B has two handlebars on each side for the commander to hold on to, while the variant installed in the PT-76 has an extendable handlebar. The handlebar can be pulled out from behind or retracted. 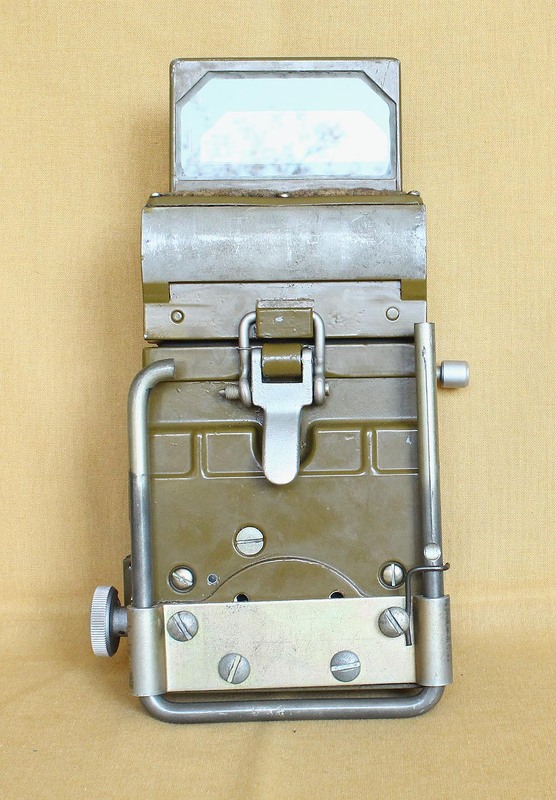 This variant of the TPKU-2B periscope was widely used in other light vehicles like the BRDM-1, BTR-60, BTR-70, and many others, not to mention the BTR-50 derived from the PT-76. This simplified periscope lacks the target designation function present in the tank-mounted version, but is otherwise functionally identical. The TPKU-2B has adjustable magnification with the option to choose between either 1x or 5x magnifications. Under 1x magnification, the field of view from the sight is 17.5 degrees. This is reduced to 7.5 degrees under 5x magnification. 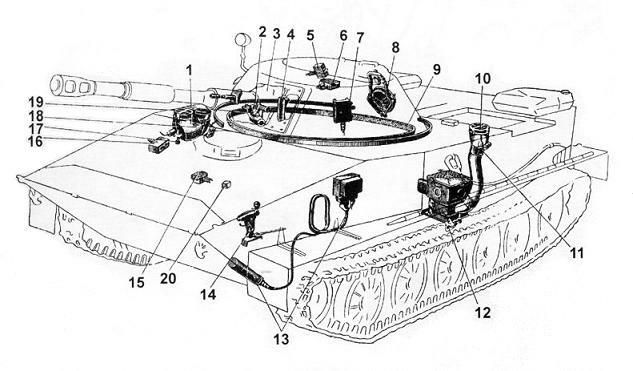 The general layout of the viewfinder and the reticle is the same as in all other Soviet binocular tank periscopes of the era, including the presence of a stadiametric rangefinder markings. This is enough for the commander to search for targets at short to medium distances, follow up by estimating the range using the stadia rangefinder, and end by switching over to the gun sight and open fire on the target. The photo on the right shows a TPKU-2B with two handlebars as used in the tank version, but it is very probable that this is a modification done by the U.S Army after the tank was captured and sent to America. 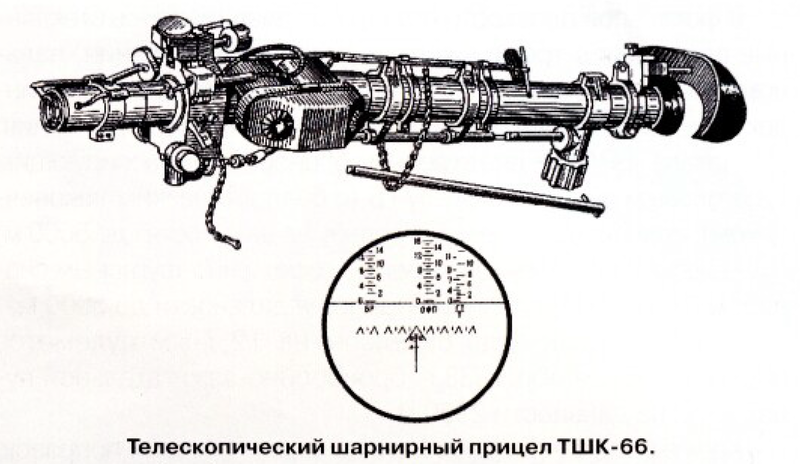 TShK-66 is an articulated telescopic sight used in the PT-76, and the TShK-66P is a slightly modified variant used in the PT-76 obr. 1957. 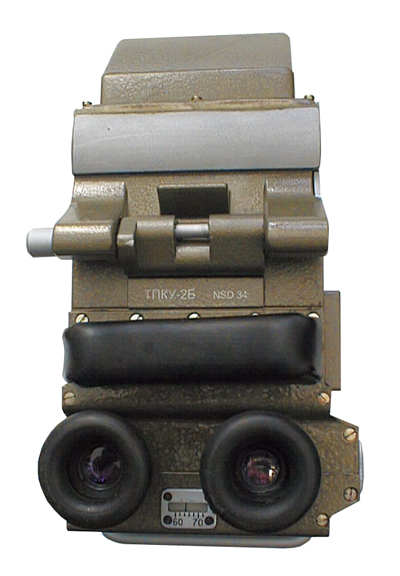 The TShK-2-66 sight is another modification of the TShK-66, first used in the PT-76B obr. 1959. It differs from previous variants in that it is designed to be stabilized via mechanical linkages to the cannon. By coupling the sight to the stabilized cannon, the gunsight is stabilized vertically in the same way as the elevation mechanism of the cannon. Being an articulated telescope, the aperture of the sight is installed co-axially with the trunnion of the cannon mounting cradle so that the raising and lowering of the cannon will raise and lower the aperture by the same amount while the eyepiece of the sight remains fixed. This means that the gunner does not have to move around to keep his eye pressed to the eyepiece when elevating or depressing the cannon for whatever reason. The eyepiece is fixed at a slight downward tilt for better comfort. When using the sight, the gunner's head will be slightly lowered and partly supported by the brow pad, so that the strain on his neck is reduced. The TShK-66 sight belongs to the same classification as the TSh series (e.g TSh-15, TSh-16, TSh-17) of articulated telescopic sights designed and fielded during WWII. Although the TShK-66 sight was developed at around the same time as the telescopic sights for the T-54 and the post-war IS heavy tank series, the TShK-66 does not feature variable magnification. In this regard, it is identical to the TSh series of articulated tube telescopic sights of the 1943 pattern with a fixed 4x magnification and a 16 degree field of view, but with the additional 'K' at the end to denote the shortened telescopic tube of the sight compared to the normal tank sights. The TShK-66 also lacks stadiametric rangefinder markings, thus firmly placing it in the same classification as the TSh-20 sight for the T-54 obr.1947, and one step below the TSh2-22 for the T-54 obr.1951. Once again, this reinforces the fact that the PT-76 was not only objectively deficient in observational facilities, but also deficient in comparison with its peers from the same year of introduction. To conduct rangefinding, the commander is forced to use his TPKU-2B periscope. 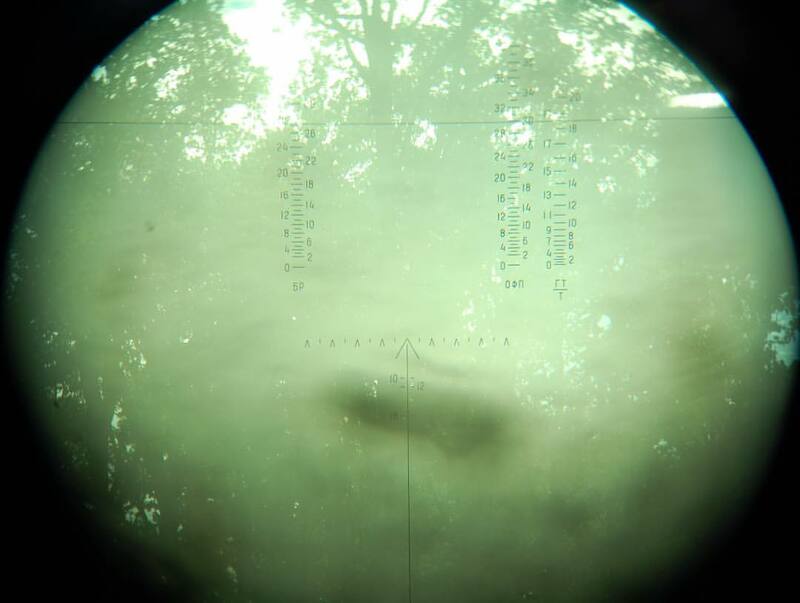 This would be fine for the first shot, as it is more convenient to search for targets through the variable magnification binocular optics of the TPKU-2B, but it becomes a liability when a second target has to be engaged, as the commander has to switch from the sight to the TPKU-2B and reacquire the target to estimate the range before switching back to the sight to open fire on it. Since the periscope cannot be expected to be aligned with the sight (as that would defeat the purpose of placing the TPKU-2B in an independent rotating cupola), this forces the commander to move between the periscope and the sight multiple times and thus lose visual contact with the target multiple times in order to ascertain the distance to it. This is completely impractical for a moving target, and highly time consuming even for a static target. Therefore, the only reasonable option would be to estimate the range using the mil markings and fire a ranging shot to the target and rely on the quick hands of the loader to fire a second one. Thanks to Sean Murphy for providing the photo below, which may be the first photo of the TShK-66 ever to be uploaded on the Internet. As you can see in the photo above, the sight only has markings for AP and HE-Frag shells, and for the co-axial machine gun. There are no markings for APCR or HEAT ammunition. 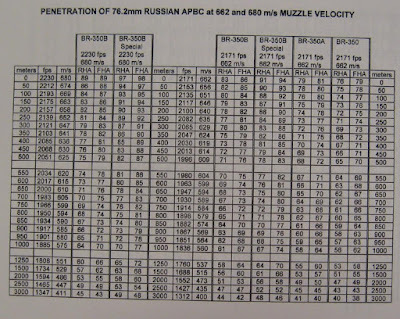 In order to use these ammunition types, he must refer to a pre-calculated range table. It is interesting to note that the range scale for HE-Frag ammunition is tighter than the range scale for AP, showing that HE-Frag rounds have a slightly flatter trajectory. The loader is situated on the right side of the turret. He is responsible for loading the cannon and the co-axial machine gun, but he is also responsible for surveying the battlefield when he is not occupied with these duties. To do this, he is provided with a single MK-4S periscope installed in a rotatable race ring mount directly in front of him. Being limited to only one periscope - albeit a rotatable one - severely restricts the loader's perception of the outside world, but it is at least somewhat understandable as he is predominantly focused on servicing the weapons. The rotatable mount allows the loader to direct the periscope to look forward and to the right, and the reversible viewfinder of the MK-4S lets him look to the left and rearward, which would otherwise be impossible with the turret wall in the way of the loader's head. Having the periscope is useful for directing the driver when backing up the tank or crossing water obstacles. This is normally done by the commander of a tank, but the redistribution of labour in the PT-76 may be necessary on some occasions because the commander is already quite overworked. In terms of working space and general comfort, the loader is reasonably well accommodated as the turret ring diameter of the PT-76 turret is 1,800mm, which is quite large for a thin-skinned tank with a medium pressure 76mm gun. 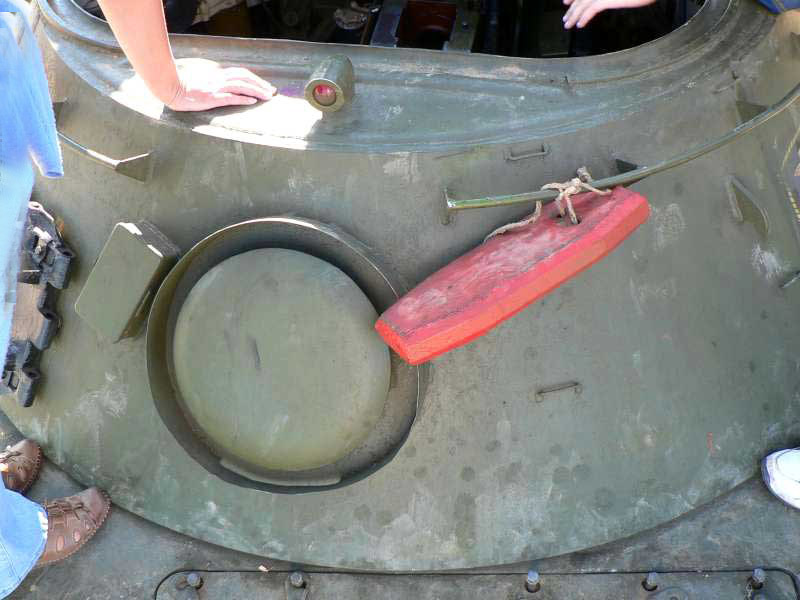 Besides the general roominess of the tank (at least in comparison with some other Soviet tanks), the loader is provided with a great number of metal loops on the right hull sponson onto which he can strap his personal effects. The loops are visible in the background of the photo below, underneath the dark magenta backrest of the loader's seat. 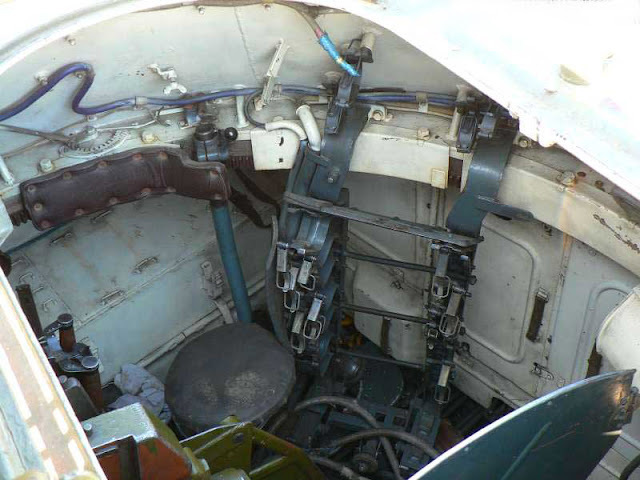 As you can also see from the photo above, the loader's seat is suspended from the turret ring. It can be folded up and out of the way so that the loader is unobstructed if he chooses to carry out his duties while standing. 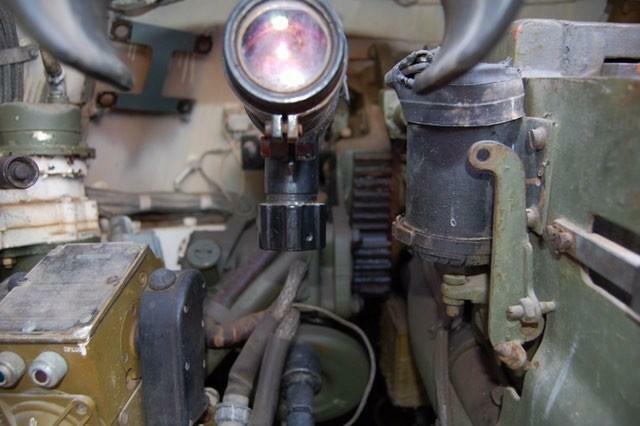 There is one dome light on the loader's side of the turret, installed next to the MK-4S periscope. The location of the dome light is convenient for the loader to reload or service the co-axial machine gun in the dark. The roominess of the turret combined with the small size and handiness of the unitary 76.2mm cartridges make the task of loading the D-56T gun extremely straightforward. It should not take more than four seconds to load, unless the loader is unusually sloppy. All of the 76.2mm ammunition is stowed inside the turret basket. There are fourteen rounds in a ready rack directly behind the loader, arranged in such a way that seven rounds are stowed horizontally in a double stack. Another two rounds are clipped to the turret wall directly above this ready rack. 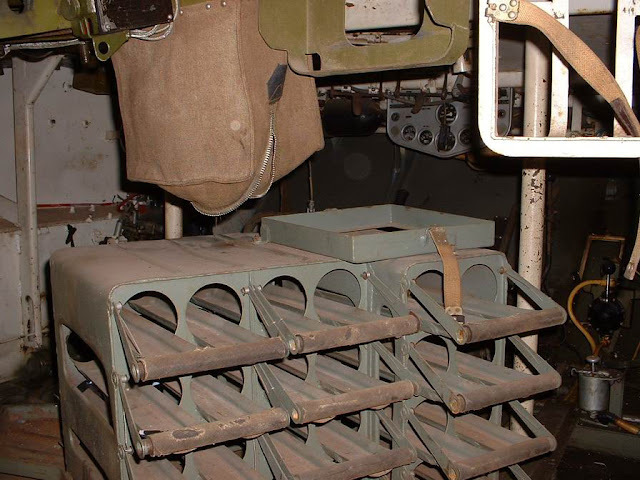 The reserve ammunition is stowed in two containers on the rotating turret floor directly underneath the cannon assembly, each holding sixteen rounds, for a grand total of forty rounds. This is not a lot, especially considering the large internal volume of the tank and the small size of the 76.2x385mm cartridge, but it was significantly more than the ammunition capacity of the P-39 (Object 101) prototype, which carried only thirty rounds of ammuntion - an absolutely unacceptable amount, considering the fact that the latest T-54 model at time carried 34 rounds of the much more powerful 100mm caliber. Loading the cannon should be quite straightforward. 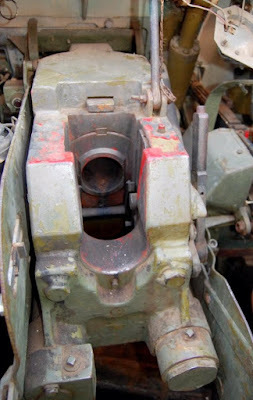 The location of the ready rack and the rounds clipped to the turret wall makes it convenient for the loader to extract a round, turn a little to the right and ram it into the cannon in one fluid motion. This can be done standing or seated, and indeed, the height and orientation of the loader's seat compared to the ready racks would make it quite easy for the loader to do so while seated, as you can see in the photo below (photo credit to Claude Balmefrezol from maquetland.com). Note that the padded backrest for the loader's seat is only good if the loader sits facing to the right; towards the commander. If he tries to sit facing forward, there would be hardly any backrest at all and the bulge would dig into his spine. Besides being an ergonomic deficiency, it may have been to encourage the loader to carry out his duties while seated. 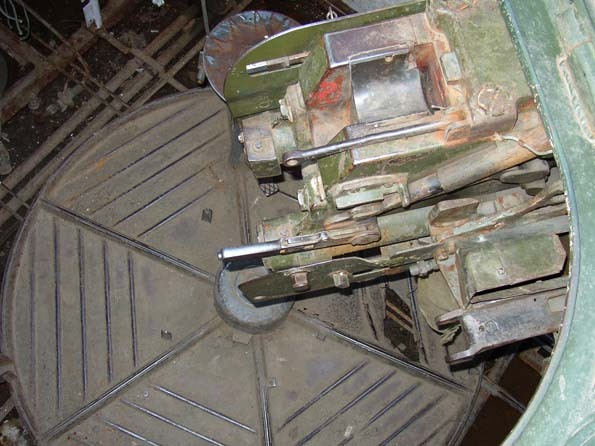 The reserve racks are placed on the rotating turret floor, but it is shifted so that one of the containers extend out of the perimeter of the floor to increase the available floor space of the loader. 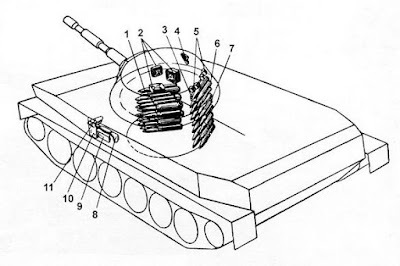 These racks are not as convenient to use as they could be, as the angling of the racks to the left (refer to diagram below) prevents the loader from extracting a round and charging it into the cannon in one swift motion. This is because the loader is naturally inclined to extract rounds from these racks using his right hand, when it is his left hand that is used to ram rounds into the cannon chamber. So to load, he must shift his grip on the base of the shell from his right hand to his left hand. The end result is a slight increase in the time needed to load. Nevertheless, it appears that the reserve racks are still decent from an ergonomics point of view. 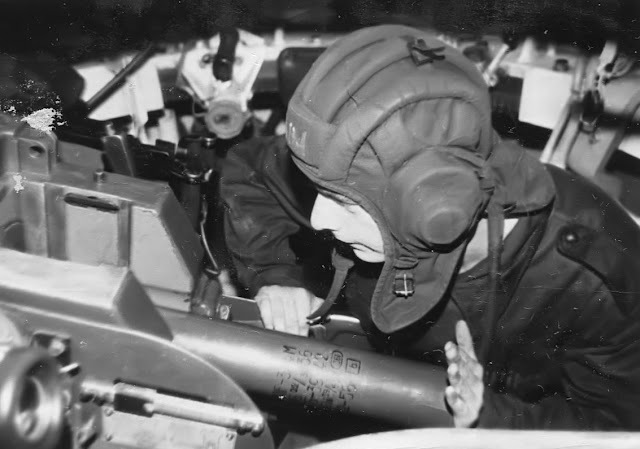 Placing the racks underneath the cannon ensures that both the gunner and loader have the maximum possible amount of forward legroom in their respective stations, and this necessitates the angling of the racks so that the loader can access it without needing to crouch below the cannon, which may be impossible or dangerous if the cannon is elevated. Additionally, it can be argued that a high loading rate from these racks is not necessary, as these are the reserve racks and would be most often used to replenish the ready racks. Polish loader in a PT-76. Photo credit to the 7th Lusatian Landing Division (7th ŁDD) website. 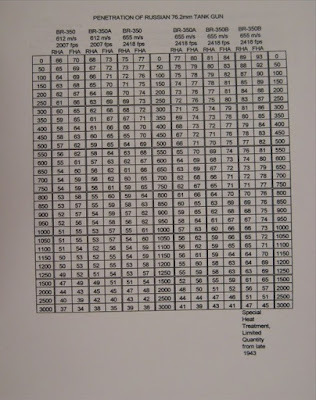 According to the manual, the maximum aimed rate of fire is seven rounds per minute, translating to an average period of 8.57 seconds between each shot, but there can be no doubt that most of that time is spent aiming, as this table lists the maximum rate of fire as fifteen rounds per minute. 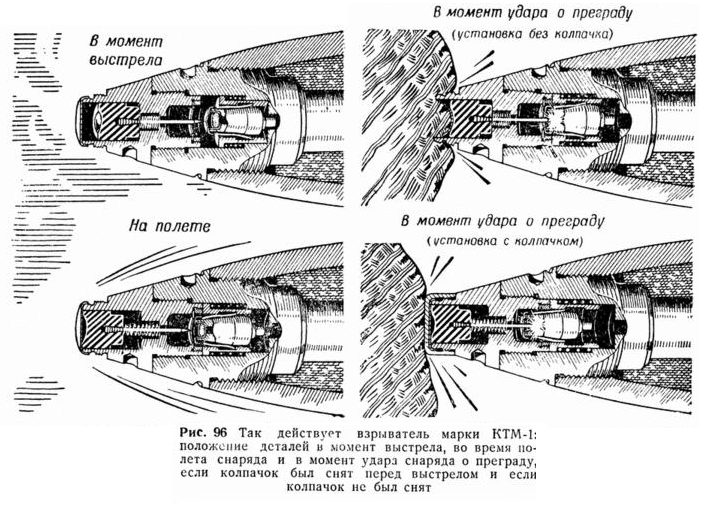 The huge difference in the aimed rate of fire and the maximum rate of fire shows how much - or rather, how little - time is actually spent loading the cannon when the time needed to aim is taken out of the equation, and it is even more obvious when we take into account the fact that the rate of fire of the T-54 is stated in technical manuals to be seven rounds per minute. Being listed as the "aimed" rate of fire denotes that the commander has to first find the target, estimate the distance and adjust his sights before opening fire, and the loader follows the formal procedure of observing the fall of the shot from his single periscope before reloading the cannon for the next shot. Since the PT-76 has the same fire control system as the T-54, it makes sense that the aimed rate of fire from the PT-76 would be the same as the T-54, since the time needed to load either of their cannons is less than the time needed to aim despite the large difference in caliber. The maximum rate of fire is simply the rate of fire that can be achieved without aiming or without making corrections while the loader loads as quickly as he can. The maximum rate of fire would be true for repeated shots on a single target or for a short and intense burst of artillery fire, whereas the aimed rate of fire would be true if the tank was engaging multiple targets one after another. In a realistic scenario where a platoon of PT-76 tanks is used to support a motorized Naval Infantry company against fixed defences, the actual rate of fire of the tank would most likely be seven rounds per minute or less, as the tank would be firing on the move at multiple targets. 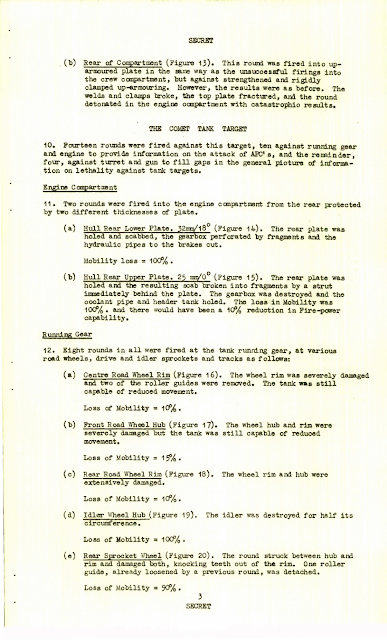 The implementation of a stabilization system in the PT-76B presumably led to an increase in the aimed rate of fire, as the commander would need less time to lay the gun on the target. The same would apply for firing on the move, as the tank would no longer need to halt before every shot as it could fire accurately while cruising at a slow crawl. The PT-76 is equipped with the D-56T rifled gun. The D-56T was a completely new design developed in 1949 by the design bureau No.9 factory, where it received the designation LB-62T (not to be confused with the LB-76T designed by the No.92 factory and installed in the Object 101). 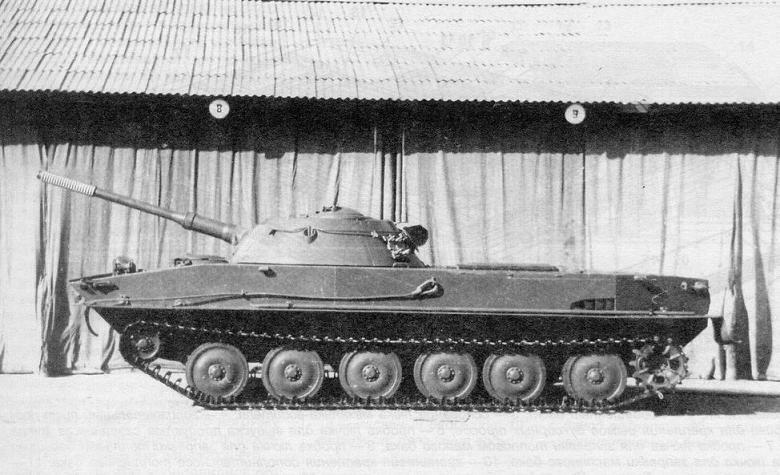 It was later renamed as the D-56T when the Object 740 prototype officially entered service as the PT-76. The cannon is chambered for the 76.2x385mm cartridge used in the ZiS-3 towed divisional gun and F-34 obr.1940 tank gun, and was designed with identical ballistic characteristics. 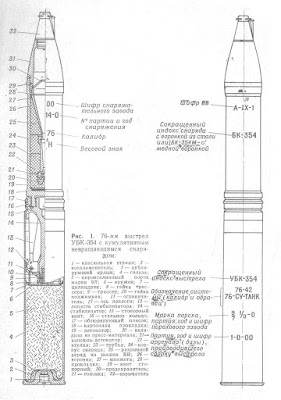 To that end, the barrel measures 42 calibers (3200mm) in length, identical to the ZiS-3 and F-34. However, the barrel is of a distinct design, featuring a characteristic tapered step at the one-third mark of the tube. Unlike many of the other tank guns designed in the late 40's, the D-56T has a recoiling mechanism that is reminiscent of more modern guns like the 115mm U-5TS or the 125mm D-81. 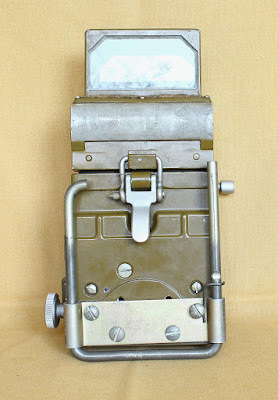 Instead of having the hydro-pneumatic recoil buffer and hydraulic recuperator mounted on top of the chamber and forward of the breechblock like on the D-10T and D-25T, the recoil buffer is mounted in a slot in the lower right corner of the breech block and the recuperator is mounted in a slot in the lower left corner. This frees up valuable space on the top part of the cannon and permits the installation of the gun in a low profile turret, and also helps to somewhat reduce the amount of interior penetration (the length of the gun extending into the turret). Besides its atypical configuration, the recoiling mechanism is also designed with a long recoil stroke to help reduce the recoil impulse to a manageable level. The maximum recoil stroke length is 550mm and the normal recoil stroke length is 470mm to 545mm, depending on the ammunition fired. 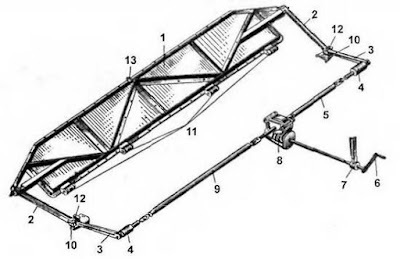 The drawing below depicts the D-56TM cannon without its mounting cradle and without the recoil buffers. 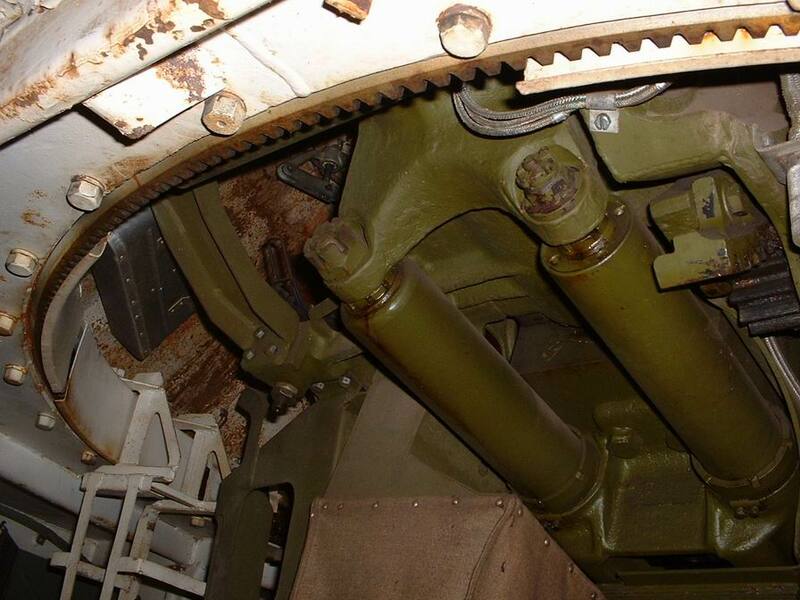 The photo below (credit to Stephen Tegner from the scalenews.de walkaround page) offers a better view of the two recoil buffers below the breech block of the D-56T. 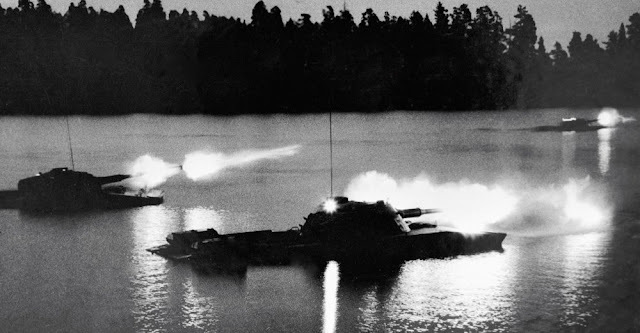 There were guns with better anti-armour performance, like the Ch-51 57mm gun, and the newly developed S-60 57mm autocannon may have offered great firepower against hard and soft targets alike, but the official requirements stipulated that a 76mm gun was to be installed in the Red Army's prospective new amphibious light tank. In hindsight, it may seem that not installing the S-60 on the PT-76 was a mistake, seeing as this class of weapon is now in vogue among for light combat vehicles, but it should be understood that the requirements set forth by the Ministry of Defence were not arbitrary. The PT-76 was to provide fire support for troops during amphibious landings, most often to suppress and eliminate fixed defences on the shore like machine gun and recoilless rifle nests while having enough firepower to deal with the majority of armoured targets, and in the immediate post-war period, the majority of armoured targets that the PT-76 was expected to encounter would be light tanks mixed with a small number of WWII era medium tanks. Light tanks could be dealt with from the front at any range, and the water-crossing abilities of the PT-76 opened up new tactical opportunities to engage heavier tanks from the sides. From the front, neither a high velocity 57mm cannon or a medium velocity 76mm cannon would be able to do much against a medium tank. Aside from fixed defences, the PT-76 would have to deal with mechanized transportation for infantry, which most often took the form of unarmoured trucks and thinly armoured half-trucks. Such threats could be effectively suppressed or eliminated solely with the complementary 7.62mm co-axial machine gun, so a rapid-firing autocannon may not have been necessary. In this context, a medium pressure large caliber cannon like the D-56T paired with a 7.62mm co-ax appears to be the more rational choice. However, the 76.2x385mm cartridge itself was not the first choice. Cannons chambered for this cartridge were generally considered obsolete in the Red Army, which was increasingly relying on larger and larger guns, whether it be towed, self-propelled or tank mounted. For example, the ZiS-3 divisional gun chambered for the same cartridge was declared obsolete and immediately replaced by the 85mm D-44 after the conclusion of WWII, and the 85mm ZiS-S-53 of the T-34-85 was replaced by the D-10T. 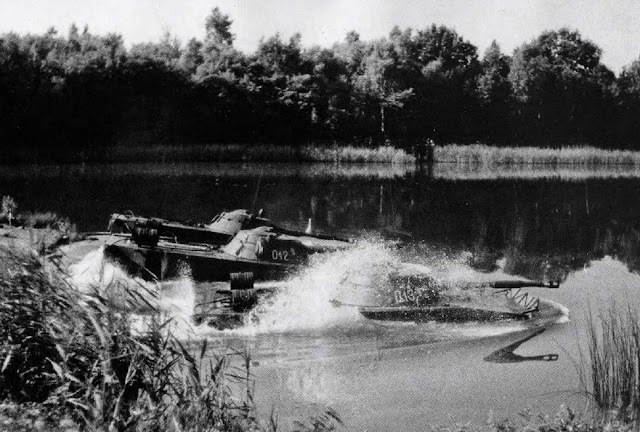 This trend was not ignored during the conceptualization of the Red Army's new amphibious light tank in 1947. Originally, the plan was to create a 20-ton tank armed with an 85mm cannon and with the same mobility characteristics as a medium tank. 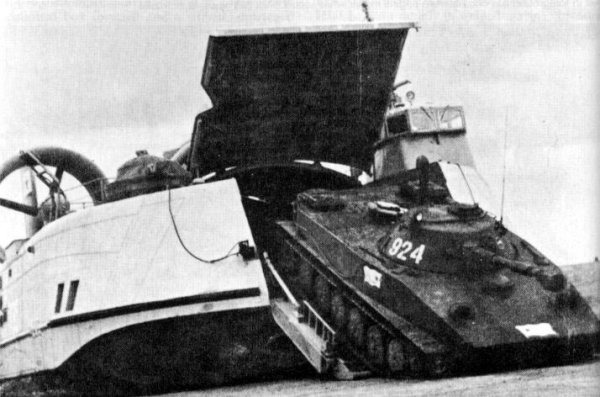 It was intended to have a 400 hp engine and swim with the use of foam-filled aluminium floats, but the engine could not be ready on time, and it was realized that the reliance on vulnerable unarmoured floats was not viable for an amphibious light tank, so there was no other choice but to create a tank that could float with the buoyancy of its own hull. 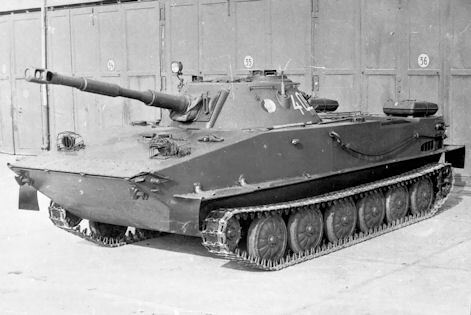 The weight of the new concept tank had to be reduced to 15 tons, and because of this, the plans for an 85mm gun had to be scrapped for a 76mm gun. 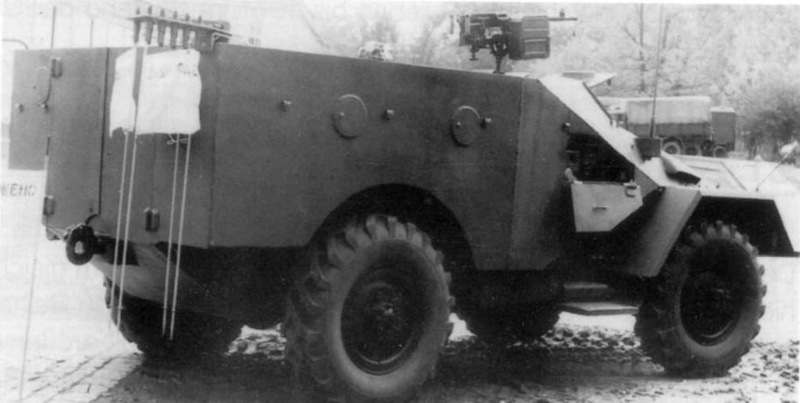 The D-56TS modification featured a new hydraulic elevation drive piston as an addition to the simple rack-and-pinion geared manual elevation mechanism, and also added brackets underneath the gun cradle to accommodate the hydraulic pump for the elevation drive. This increased the weight of the gun at the breech end, so the thickness of the fume extractor tube was increased from 3mm to 4mm in order to act as a counterweight. The D-56T has a vertically sliding wedge breech, which is highly unusual for a Soviet tank. 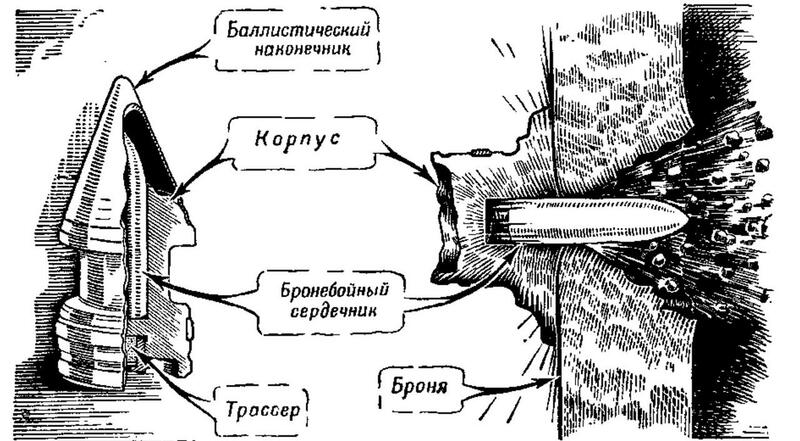 According to Soviet engineering manuals, if the bore axis of a tank cannon from the floor of the fighting compartment is lower than 950-1,000mm, a vertically sliding breech should be used, but if the bore axis is higher than that, a horizontally sliding breech should be used. This is because the convenience of ramming a shell into the chamber changes depending on the height of the bore in relation to the height of the average loader (170cm). If the height of the bore axis is 950-1,000mm or more, the chamber will be above the elbow of a standing man as evident in the drawing below, so a horizontally sliding breech is more convenient for the loader. 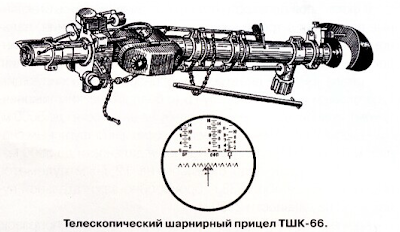 Under this criteria, having a vertically sliding breech gun in a turreted tank would require a rather tall turret paired with a very short hull (less than 1 meter tall) or some other unusual and impractical solution, and for this reason, most tank guns built in the Soviet Union have a horizontally sliding breech as do many tank guns built abroad, the L7 being a prime example. However, that is not to say that this criteria was strictly enforced or that it made much of a difference. Just as there are plenty of tank guns with horizontally sliding breeches, there are also plenty of tank guns with vertically sliding breeches used in tanks that have the same bore axis height as tanks armed with horizontally sliding breech guns, with examples like the M68, M256, Rh 120 L/44, L11, L30, CN 120-26, and others. In the case of the D-56T, it appears that the decision to use a vertically sliding breech was possibly influenced by the ease of loading from a seated position, since the bore axis height of the D-56T from the floor of the fighting compartment is 1,500mm - nowhere close to being below 1 meter. All of the D-56T variants are fitted with a muzzle brake. A modern muzzle brake is capable of reducing the recoil force of a recoiling rifle or cannon by up to 80%, but they are limited to around 30% for guns and howitzers as an insurance policy so that the hydraulic recoil system does not fail catastrophically if the cannon is fired with a damaged muzzle brake. The main downside to a muzzle brake is that the smoke and hot gasses diverted sideways has the side effect of obscuring the gunner's vision and also revealing the tank's position. For a light reconnaissance tank with only enough armour to stop machine gun fire, these drawbacks are much more serious than they are for a heavily armoured tank intended for open combat. That said, a muzzle brake was necessary on the D-56T in order to keep the recoil forces low enough for the turret to handle. The original D-56T is fitted with a multi-slotted muzzle brake of considerable length, but from 1957 onward, new production PT-76 tanks were armed with the newer D-56TM cannon with a new updated muzzle brake with a fume extractor. The new muzzle brake returned to a double-baffle type like the original ZiS-3, but was of a new style of brakes derived from the muzzle brake of the D-25T designed by the TsAKB design bureau (now referred to as the "TsAKB style" brake, as opposed to the "German style" brake used on earlier D-25T guns). 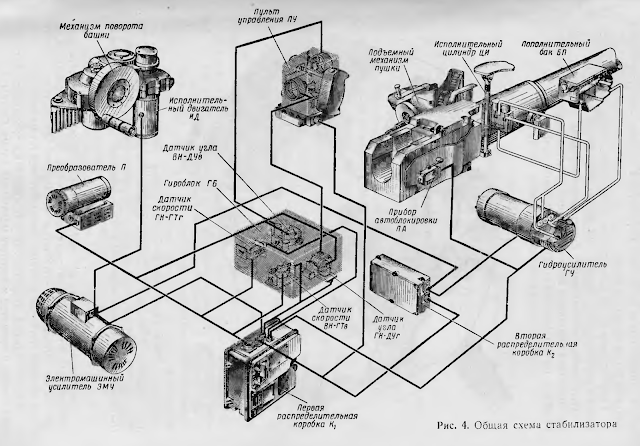 The advantages of slotted-type and baffle-type brakes over each other are debatable and the two types of brakes operate on different principles, but according to "The Basics of Artillery Guns and Ammunition" (Основи Будови Артилерійських Гармат Та Боєприпасiв, А. Й. Дерев’янчук), pages 308-311, double-baffle brakes are typically more efficient and more suitable for tank guns for a variety of reasons. A double-baffle muzzle brake works by placing obstacles of a large surface area (the baffles) in front of the muzzle to impede the forward flow of the escaping propellant gasses, thus absorbing the kinetic energy of the propellant gas particles in the form of pressure, effectively causing the gasses to impart a forward force on the barrel which cancels out some of the rearward recoil force. This is illustrated in diagram "A" in the drawing below. On the other hand, a slotted muzzle brake works entirely by redirecting the escaping propellant gasses at a rearward angle to produce forward thrust much like a rocket, thus creating a braking effect. The small size of the slots forces the escaping propellant gasses to exit at an extremely high velocity, but the angle of the slots is inherently restricted by the need to protect the tank and surrounding infantrymen from the same powerful gasses. Because of this restriction, the amount of thrust produced from each individual slot is low, so a large number of slots is needed to achieve a useful level of recoil reduction. All of this is shown in diagram "B" in the drawing below. For the PT-76 specifically, the advantage of a double-baffle muzzle brake over the earlier slotted one is obvious: the tank was required to ferry up to 20 troops on top of its hull during river crossings, and a slotted muzzle brake would have a much higher chance of harming the tank riders than a double-baffle type. This may also be one of the reasons why baffle-type brakes have been the most common design by far in every application, from custom-made competition rifles to large artillery systems. 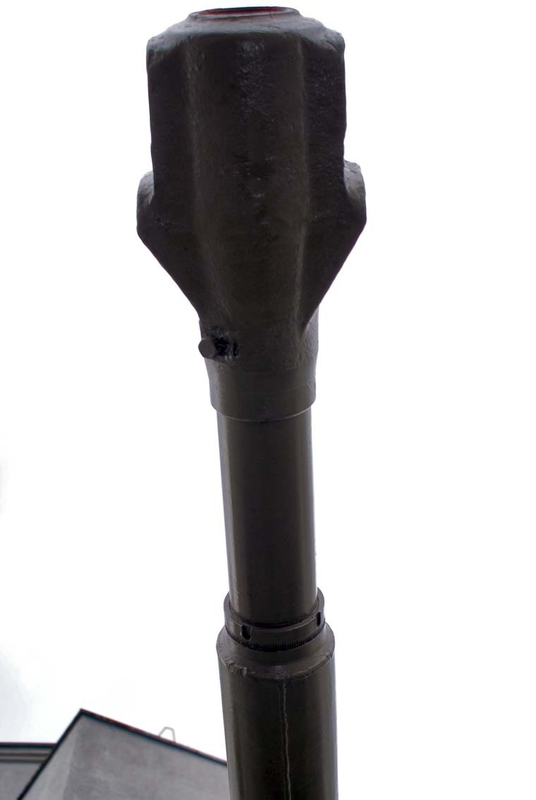 Slotted muzzle brakes have been used on guns and howitzers of calibers ranging from 152mm on the ML-20 to 57mm on the early production variants of the Ch-51 gun, so clearly there is no caliber limitation, but modern guns are invariably fitted with a baffle-style brake. For example, the early long slotted brake on the Ch-51 was quickly replaced by a much more compact double baffle muzzle brake on the Ch-51M, and all Russian 152mm gun-howitzers produced after the ML-20 - including both towed and self-propelled guns - were fitted with double baffle muzzle brakes as well. Another likely factor behind the popularity of baffle-type brakes over slotted-type brakes may be its compactness, which is important for turreted tanks like the PT-76 as they are sometimes expected to drive into forested areas where a long muzzle brake may hamper the movement of the tank or prevent it from traversing the turret to aim. It also helps to ensure that the muzzle does not dig into the ground and cause malfunctions when driving across rough terrain, although this is not an issue for the PT-76 due to its relatively tall hull and short gun barrel. The recoil guard and shell casing deflector can be folded down by a full 90 degrees, thus creating a spacious passageway between the two crew stations in the turret. 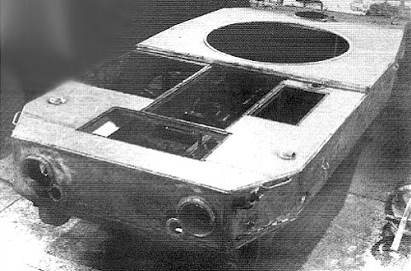 The first iterations of the PT-76 featured powered electric turret traverse, but no stabilizers. The original PT-76 obr. 1952 had the EPB-4 electric turret drive installed, granting a maximum turret rotation speed of 17 degrees per second. To operate the electric traverse system, the commander was furnished with a KB-4 control unit, which has the appearance of spade grip attached to a black box. 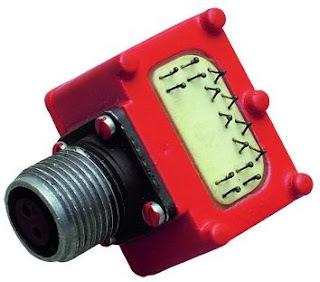 The control unit is essentially a complicated rheostat. The spade grip could be rotated with the commander's left hand to different degrees of deflection to control the speed of turret traverse, and returning the handle to the center position while the turret was still in motion reversed the polarity of the electric traverse motor, producing a braking effect until the turret comes to a complete stop. Gun elevation was controlled manually via the gun elevation handwheel, located directly underneath the TShK-66 sight. The lack of powered gun elevation meant that gun laying was relatively slow, but this was typical for all tanks of the era. Besides that, the layout of the KB-4 powered traverse unit and the manual elevation flywheel in the PT-76 is not particularly ergonomic. If we take the height of the commander's head to be at the same level as the eyepiece of the TShK-66 sight, then the powered traverse unit would be slightly above shoulder level and the manual elevation flywheel would be at chest level. 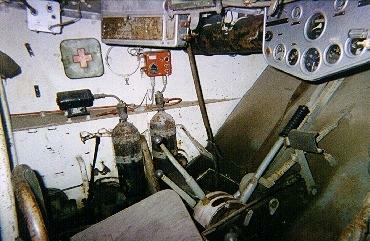 This is similar to the layout of the gunner's controls in the T-54, the M41 Walker Bulldog, and the Centurion Mk.III. 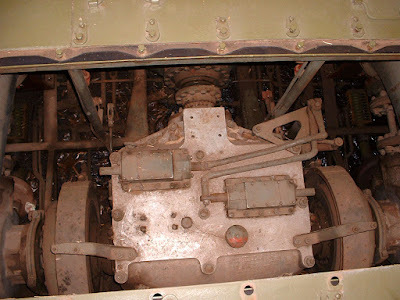 The photo below shows (from left to right) the turret traverse flywheel, the KB-4 control unit, and the gun elevation flywheel. To switch from powered electrical turret traverse to manual traverse, the worm gear mechanism must be engaged and the electric traverse motor interface must be disengaged. 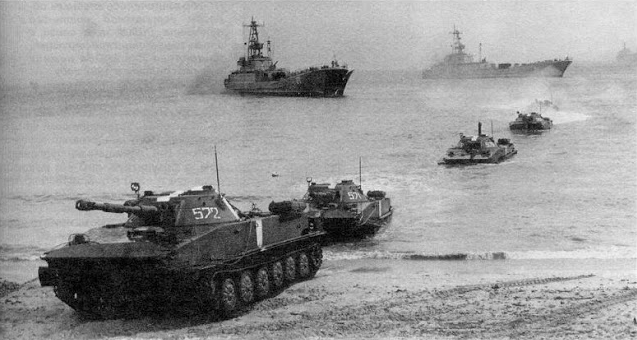 Being an amphibious vehicle meant that the Soviet Naval Infantry finally had dependable firepower to assault shore defences in amphibious landings, but the lack of gun stabilization severely limited the firepower of the PT-76. Upon entering the water, a PT-76 would be unable to return fire against defensive positions on the shore until it reached solid ground, but even then, the tank could only fire accurately during short halts. This was a major issue because the landing ships from which the tanks are launched had limited firepower against hardened point targets. 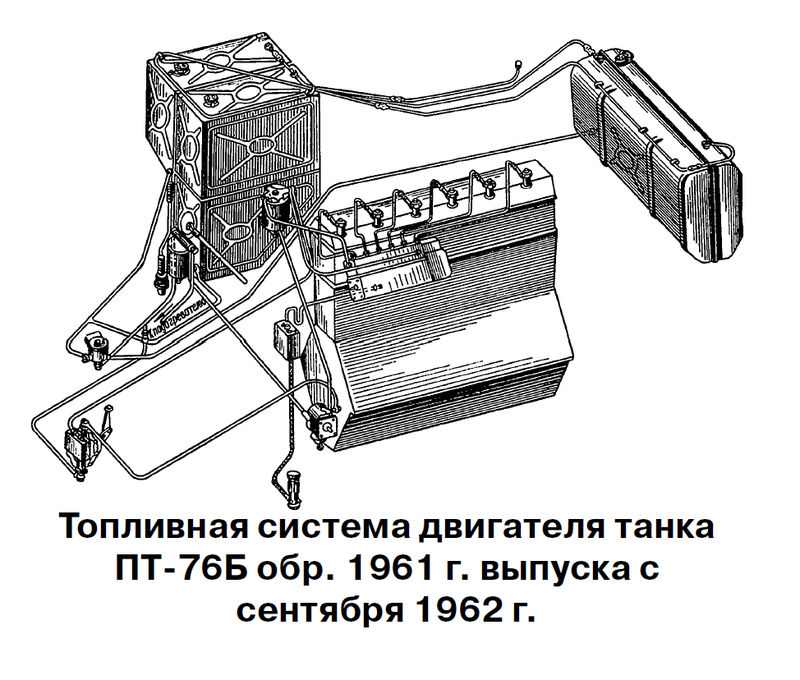 Attached to the D-56TS gun of the PT-76B was the STP-2P 'Zarya" two-plane stabilizer system derived from the STP-2 "Tsiklon" stabilizer originally developed and used in the T-55. 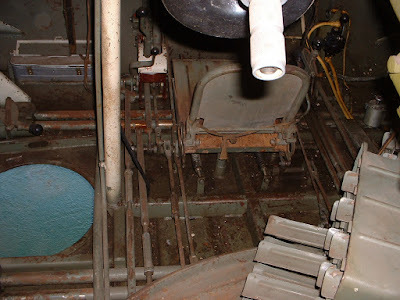 The addition of the stabilizer took up a some space inside the turret, most of it by the amplidyne generator, electrical junction boxes and hydraulic pump. 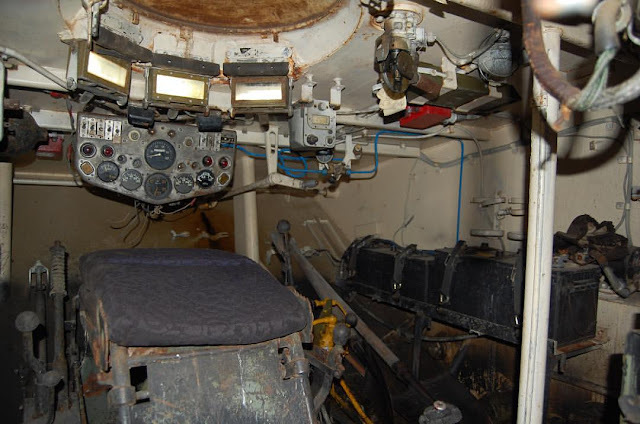 Most of the additional equipment was non-intrusive, being located underneath the gun or behind the commander's handgrips and gunsight, but some of it (such as the junction boxes) was mounted to the turret walls. 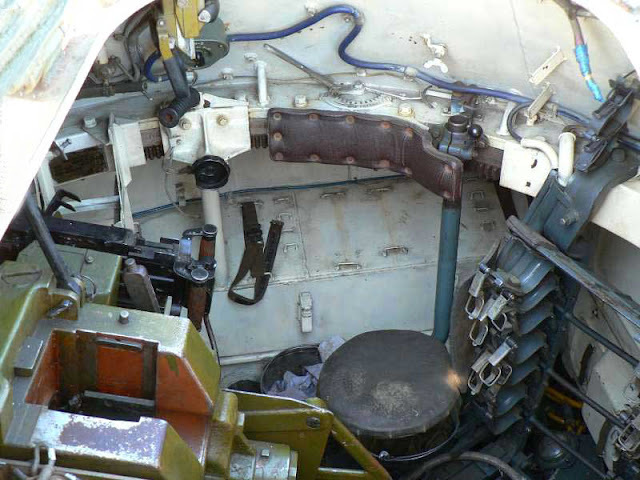 A collapsible shoulder guard was added to the gun mount on the commander's side of the turret to ensure that the automatic adjustments of the gun do not injure him. Like the "Tsiklon" stabilizer, "Zarya" places the hydraulic gun elevation drive into hydrolock when the gunner presses the firing button and maintains hydrolock until the gun has completed its recoil cycle, but "Zarya" differs in that it releases hydrolock immediately after the recoil cycle and returns the gun to a stabilized status. Unlike "Tsiklon", the stabilizer does not have a "loader's assist" function that raises and fixes the gun at a predetermined elevation angle until the gun is loaded and the loader presses a "ready" button. This feature was included in "Tsiklon" in order to improve the rate of fire of the T-55 while on the move, and it is omitted from the "Zarya" stabilizer because the average loading rate in the PT-76 is too fast for such a feature to make any difference, so the ability of the gunner to maintain visual contact with the target and to observe the fall of the shot is more valuable. The accuracy of stabilization in the vertical plane is reported to be 1.0 mil, and the accuracy of stabilization in the horizontal plane is 1.5 mils. This is very similar to the performance of the "Tsiklon" stabilizer, and "Zarya" offered a similar improvement in firing accuracy. When approaching a target at a distance of 800-1200 meters in a straight line, the chances of scoring a hit on the frontal silhouette was increased by 5.25 times, and the chances of scoring a hit on the side silhouette at 1000 meters was increased by 6.3 times. The chances of scoring a hit while moving at an angle of 15 degrees relative to the target was improved by 4 times. In short, the implementation of "Zarya" enabled the PT-76 to fire at tank-type targets at short to medium range with reasonable accuracy at speeds of between 12 to 25 km/h and effectively open fire at troop concentrations and fixed fortifications at long range at the same speed. More interestingly, it also gave the tank the ability to fire with high accuracy on shore targets while sailing on relatively calm waters, which may be partially attributed to the relatively low maximum sailing speed of the tank and the dampening of the vibrations from the engine by the surrounding water. The D-56T gun came with a plethora of preexisting ammunition types, all identical to the ammunition used in towed ZiS-3 field guns. The cartridge is 76.2x385mmR (Rimmed). The generic ammunition loadout of a PT-76 operating in the 50's consisted of 24 HE-Frag shells, 4 APHE shells, 4 APCR shells and 8 HEAT shells. By the late 70's, this was changed to a mix of 20 HE shells, 4 APHE shells, 4 APCR shells and 12 HEAT shells. The small quantity of armour piercing rounds of the same type can make it difficult to engage targets. Beyond the obvious drawback of a limited number of available ammunition, the small quantity of each variety of ammunition complicates the process of using the 'burst on target' gunnery method where the gunner senses the impact of his first shot to correct his aim for the second shot, since the different ammunition types are affected in different ways by the same weather conditions. 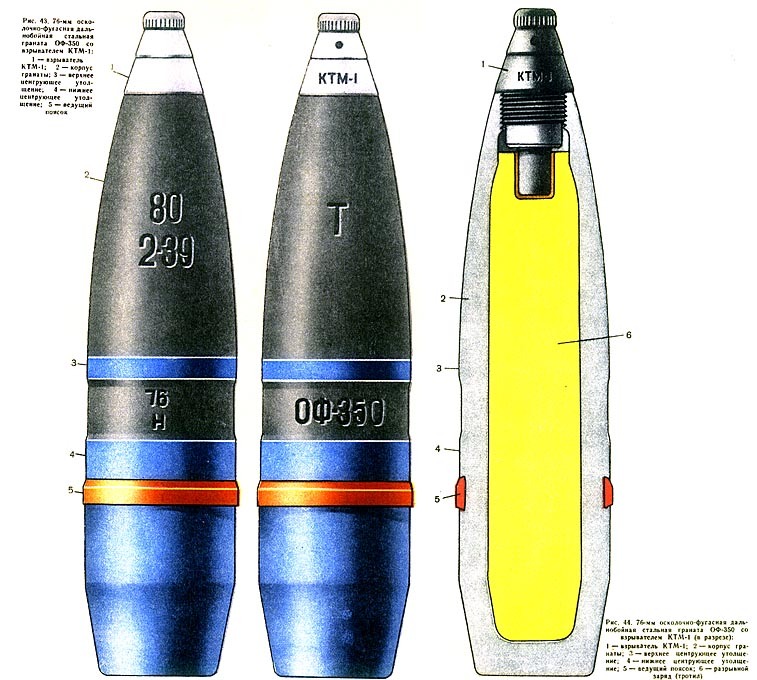 For example, BK-354M is a fin-stabilized HEAT shell, and the windage adjustments needed for it will be different for the other shell varieties, and the difference in velocities between the four different anti-armour shells makes it difficult to apply corrections from one type to another. The propellant type for the regular ammunition used in the D-56T is a full charge of 54-A-354 stick powder 9/7. 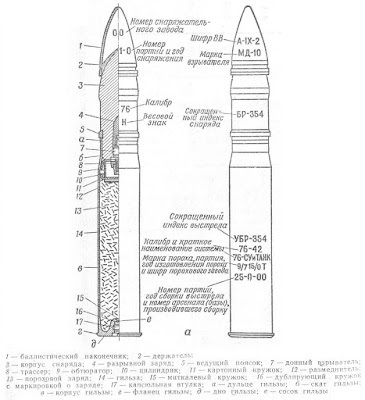 The mass of the normal propellant charge is 1.08 kg, the same as for all other L/40-42 guns chambered for the 76.2x385mm cartridge, but HEAT and APCR ammunition differed. The mass of the 54-A-354K propellant charge for the BK-354/M round is 0.86 kg, the mass of the 54-A-354P propellant charge for the BR-354P is 1.3 kg but this can be substituted with 1.21 kg of 4A41 special charge, and the mass of the 54-A-354N propellant charge for the BR-354N APCR round is 1.4 kg. Reduced charge shells were used for high explosive shells on field guns for high angle shooting, but never for the D-56T. All of the ammunition use the standard 54-G-354 brass case. OF-350 is a fairly typical high-explosive fragmentation shell of modern construction that was used extensively during WWII with the ZiS-3 divisional gun and F-34 tank gun. The steel walls of the cavity are cylindrical, as opposed to tapered like on the O-350A fragmentation shell. 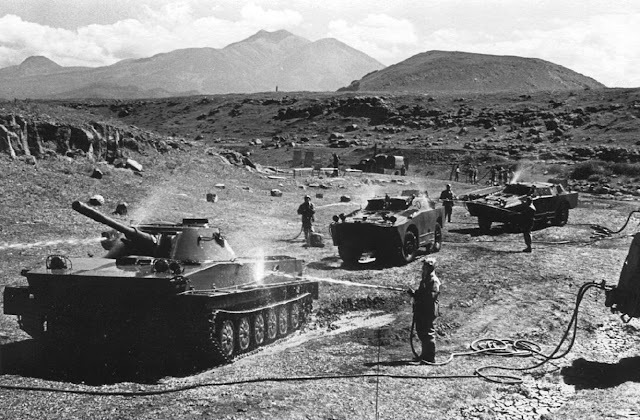 During the so-called "Great Patriotic War", the shell was sometimes filled with Amatol instead of TNT as a cost-saving measure due to the huge expenditure of TNT during the war, but this was no longer practiced by the time the PT-76 entered service because pure TNT was simply better. 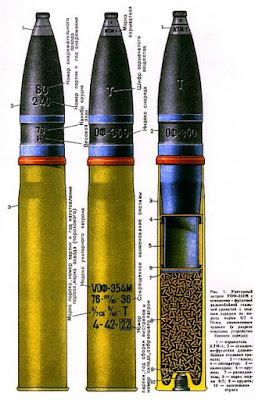 Despite the invention and proliferation of more powerful explosives (in terms of detonation velocity) in the late 30's, the OF-350 HE-Frag shell was only filled with TNT during its service with the PT-76 due to the good balance of blasting power, fragmentation effect and cost. Only the O-350A Frag shell used A-IX-2 (73% RDX, 23% Al, 4% phlegmatizing wax) or TGA (40% RDX, 50% TNT, 10% Al) for its explosive filler due to the much higher brisance of these explosives compared to pure TNT, making them much more effective at producing shell splinters and fragmentation. O-350A shells are compatible with the D-56T, and it was probably used in some indeterminate quantity at some indeterminate time, but as a rule of thumb, the PT-76 carried only HE-Frag due to its versatility. The maximum range of the OF-350 shell is 12,000 m when fired from the D-56T. This is slightly lower than the maximum range from 76mm field guns, which could send an OF-350 shell out to a distance of 13,000 m at an elevation of 37 degrees (obr. 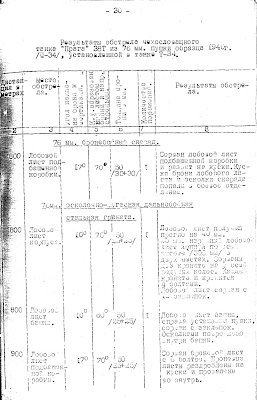 1942 ZiS-3) or 13,290 m at an elevation of 45 degrees (obr. 1902/30 and obr. 1939 USV). By comparison, the maximum elevation of the D-56T is 30 degrees. Since the ballistics of OF-350 are quite similar to the AP rounds fielded for the D-56T, the two ammunition types are more or less interchangeable at distances of less than a kilometer. This greatly simplifies the aiming process when engaging lightly armoured vehicles. 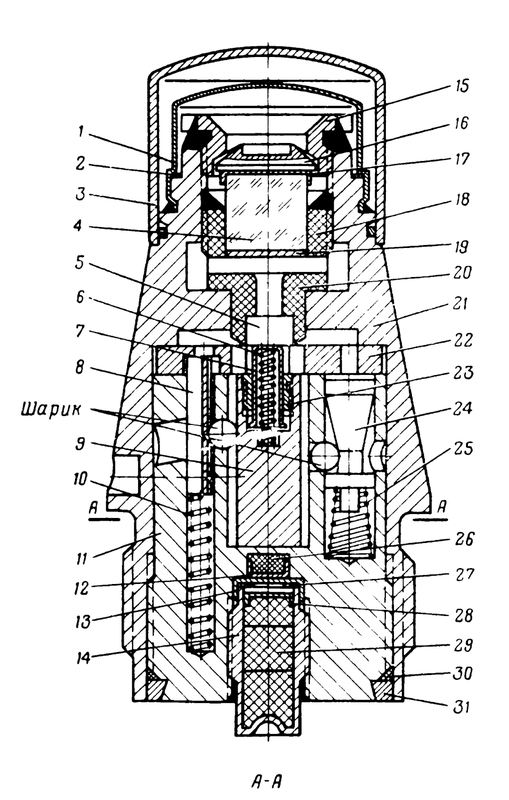 The OF-350 shell was initially capped with the KTM-1 or KTMZ-1-U point-detonating (PD) fuze during the earlier years of its service, but beginning in the early 50's, the newer MG-N point-detonating fuze was available as a replacement and became standard for Soviet 76mm and 85mm artillery and tank shells of the post-war era. The MG-N fuze offers the same choice of instantaneous (fragmentation) or delayed (high-explosive) action like the earlier KTM-1, but differs somewhat in the percussion detonation mechanism. For all practical purposes, both fuzes are interchangeable. To choose between fragmentation and high-explosive modes, the loader can take the safety cap off or leave it on. The inertial distance arming system for the KTM-1 is detailed in the two diagrams on the left, and the upper right diagram shows how the fuze behaves without the cap when the shell impacts a target, while the lower right diagram shows how the fuze behaves with the cap. Without going into too much detail, the delay mechanism of the fuze relies on inertia. 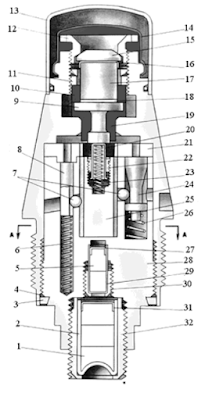 When the safety cap is taken off the fuze, the piston at the tip is exposed. When the shell impacts an obstacle, the fuze digs in and the piston is pushed back by the material of the obstacle (soil, concrete), driving a firing pin backwards while the percussion detonator at the base of the fuze is thrown forward by inertia (refer to upper right diagram). Under the combined speed of both components moving toward each other, the firing pin and detonator impact in a fraction of a millisecond and the booster is set off by the detonator. If the safety cap is left on, the piston and firing pin do not move when the shell impacts an obstacle, and only the detonator flies forward due to inertia from the deceleration of the shell when it penetrates an obstacle. When the detonator hits the fixed firing pin, the warhead detonates. The time needed for the detonator to reach the firing pin creates a delay of 0.03-0.05 seconds, allowing the shell to penetrate into the target before it explodes. When the cap on either the MG-N or KTM-1 fuze is left on (HE mode), a OF-350 shell fired from a distance of 7.5 km can penetrate a brick wall up to 0.75 meters thick or an earthen embankment up to 2.0 meters thick before detonating. Since the fuze works on a delay mechanism, the shell will detonate behind the wall or obstacle if it is less thick than the penetration path of the shell. When the cap is screwed off (Frag mode), the shell explodes instantaneously upon impact with the target or with the ground, producing a spray of up to 670 shell splinters of sufficient energy to injure or kill in an area measuring 30 m wide and 15 m deep. 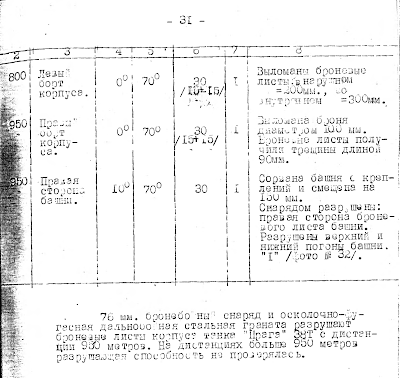 Based on a "Report on the shooting of German tanks with AP and HE shells from tank guns" from 1942, a part of which is detailed in this article by Peter Samsonov, 76mm high-explosive fragmentation shells fired from an F-34 tank gun proved to be capable of destroying light tanks like the Pz.38(t) and Pz.III from distances of up to a kilometer. A variety of ammunition types of different calibers was tested, including 76mm HE-Frag. 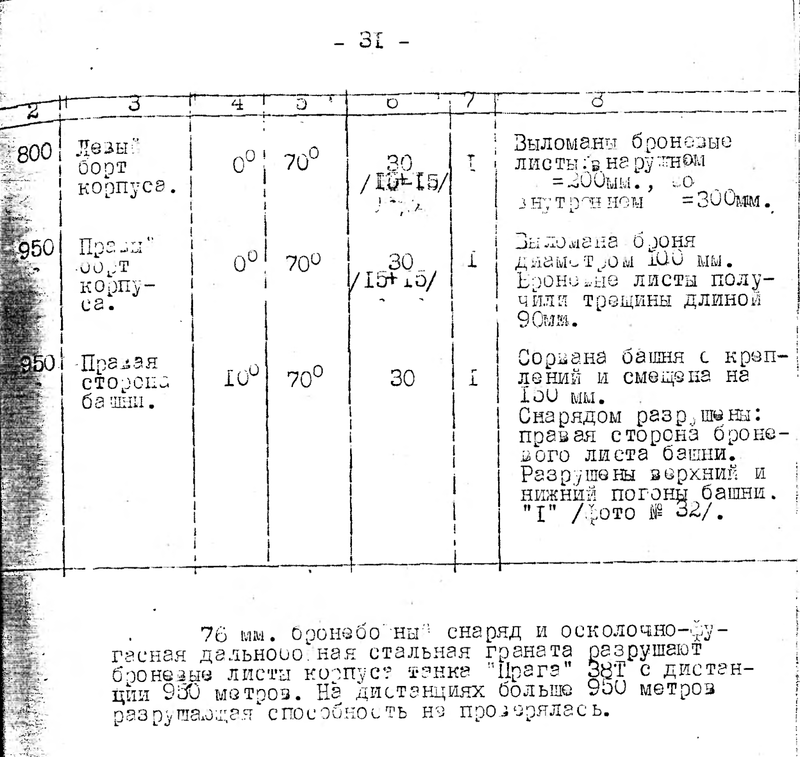 The designation of the 76mm HE-Frag shell used in the testing was not explicitly mentioned, but the generic description of "76мм осколочно-фугасная дальнобойная стальная граната" (76mm long-range steel high-explosive fragmentation grenade) leaves no doubt that 53-OF-350 with a standard KTM-1 fuze was used, as it is the only round for the F-34 that is designated as such. In order to understand the type of damage that can be inflicted on a light tank like an M41 Walker Bulldog, we can use the tests on the Pz.38(t) as an example. It is important to note that the Pz.38(t) used for the tests is either an Ausf. E or F model as evidenced by the presence of appliqué armour on the front (25+25mm) and sides (15+15). The outcome of the tests are shown on pages 30 and 31, as seen below. A total of six HE-Frag shots were fired at the tank at distances of between 800 to 950 meters. Keep in mind that the testing with HE-Frag shells was preceded by a single test of 76mm AP fired at the base of the turret (30+30mm), which severely damaged it. Before testing with 76mm rounds, the Pz.38(t) was bombarded with 37mm, 40mm and 45mm shells which left deep dents and extensive cracking on the plating of the tank. 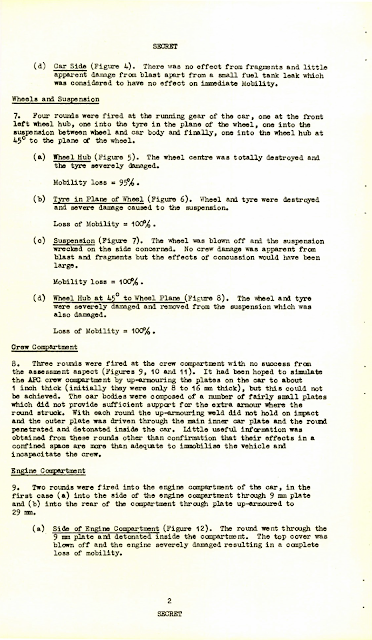 However, the photographs show that the cracks were isolated to the 25mm appliqué armour, so the base 25mm armour of the tank was still sound, and the testing is still valid. Aimed at the front hull plate (25+25mm, 10°) from 800 meters. The dual-layer 50mm plate was bent inward by 40mm and a weld seam burst 300mm in length. Aimed at the front of the turret (25+25mm, 10°) from 800 meters. The appliqué armour plate on the front of the turret to the right of the gun mount is torn off its rivets. Fragments of the plate enter the turret. Aimed at the base of the turret (25+25mm, 17°) from 900 meters. 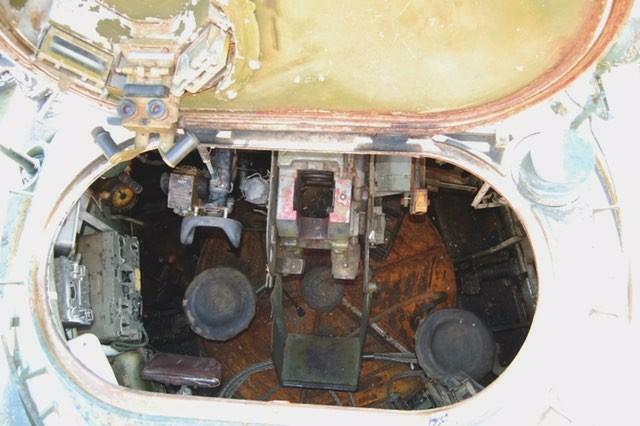 The remainder of the turret front plate is shattered by the shell, and the pieces fall inside the tank. Aimed at the side of the hull (15+15mm, 0°) from 800 meters. A 200 mm breach is formed in the outer armour plate, 300 mm breach in the inner one. A second shot at the side of the hull (15+15mm, 0°) from 950 meters. It makes a breach 100 mm in diameter, and results in 90 mm long cracks running through the side armour. Aimed at the side of the turret (30mm, 10°), from 950 meters. The turret is torn off, and displaced 150 mm. The turret ring is destroyed. The right side of the turret is destroyed. The testers concluded that the front hull of the Pz.38(t) could be destroyed with either 76mm AP or HE-Frag shells from a distance of 950 meters. Overall, it was concluded on page 77 that 76 mm HE-Frag shells fired from an F-34 model 1940 gun installed in a T-34 tank can destroy the Pz.38(t) tank and the side or rear hull and turret armour plating (30-20mm) of the Pz.III, StuG, and PzIV from 1000 meters, damaging the tank and crew with the shell fragments and spall. However, the report does not elaborate if the warhead exploded inside the tanks or during the penetration of the plates. The results of these tests are broadly similar to the results of a British evaluation of the lethality of 76mm HESH on armoured personnel carriers. 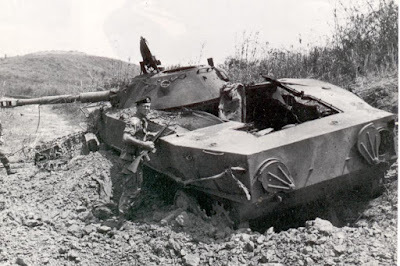 For the British evaluations, the testers used a Saladin armoured car and a Comet tank as surrogates for the BTR-60P and BTR-50 respectively to determine the effectiveness of 76mm HESH on contemporary Soviet APCs, but did not explicitly identify the 76mm HESH round used in the testing. Since the L29 was the only HESH round in service for the L5A1 low pressure gun at the time of the evaluation, it is all but certain that some variant of the L29 was used, probably L29A3. The projectile has a mass of 4.5 kg and packs 0.9 kg of RDX explosive filling. The most relevant parts of the evaluation are the two pages shown below. It is interesting to note that the testers decided to up-armour the Saladin in order to better represent a BTR-60P, when the BTR-60P actually did not have more armour than the Saladin. From the results of the tests, it is clear that 76mm HESH behaves much like 76mm HE-Frag on armour plates measuring from 25mm to 32mm thick. 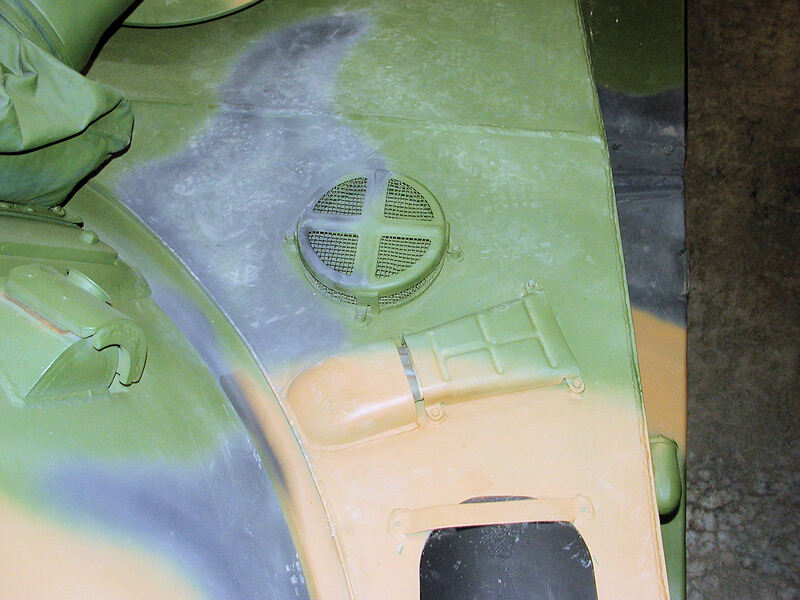 On the Saladin target, the thin armour had an appliqué plate welded on to increase the total thickness to 25mm (one inch) in much the same way as the side armour of the Pz.38(t) referenced earlier. 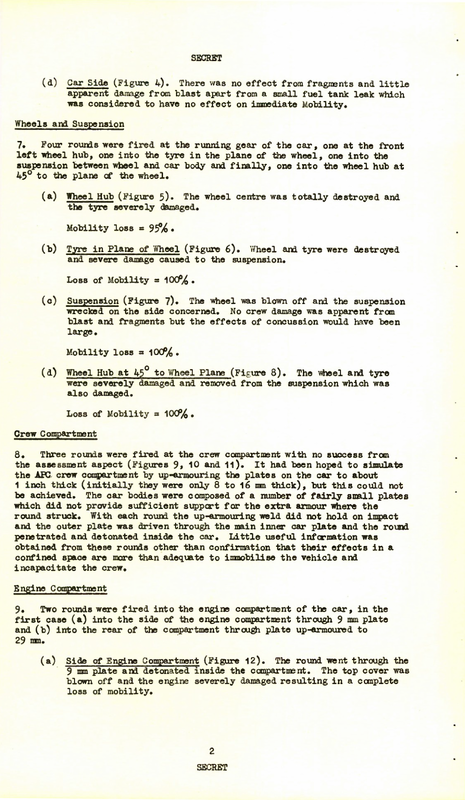 Both the Saladin and Comet were consistently breached by 76mm HESH rounds where the armour was between 25-32mm thick, after which the shell exploded on the other side of the plate, indicating that the HESH rounds did not breach the plates with the blasting power of its squash head filling, but with its own kinetic energy, which is surprising since the nose of HESH shells is invariably thin and soft to promote the "squashing" of the explosive filler. Suffice to say, the OF-350 with its thicker steel walls would have no trouble penetrating the side armour plates of an M41 Walker Bulldog, which did not exceed an inch in thickness on the turret and the side of the hull, dropping down to just 19mm on the lower side hull. By extension, this also means that OF-350 is capable of destroying or at least disabling any armoured personnel carrier, armoured car, and light tank fielded during the Cold War. This is very useful since this round comprises the majority of the ammunition carried in the PT-76 in most combat loads. Before the improved BR-354 became available in the mid-50's, the BR-350B shell of WWII vintage became the only APBC-HE shell available to the PT-76 during the earliest years of its service. The 65-gram explosive filling makes the shell exceptionally lethal once full armour penetration is achieved, and greatly increases the first-hit kill probability on light tanks. While 65 grams may not seem like much, the filling is composed of A-IX-2, which is a potent explosive-incendiary compound, because it contains aluminium as a fuel additive. A-IX-2 consists of 73% RDX, 23% aluminium powder, and 4% of phlegmatizing wax. This explosive compound has a high shattering power, or brisance, allowing it to shatter the base of the shell into multiple fragments as it emerges from an armour plate to devastating effect on personnel and equipment. Thanks to the high brisance, 65 grams of A-IX-2 is more effective in this capacity than the 150 grams of TNT used in the BR-350A shell. Besides the damage from fragmentation, the blast itself may have some impact as well, as the aluminium powder in A-IX-2 content produces an incendiary effect because aluminium powder is pyrophoric. The relatively low aluminium content in A-IX-2 means that there will be some unburnt aluminium powder dispersed into the surrounding air, where it will burn at reduced rate due to the reduced oxygen levels and the high concentration of byproducts from the explosion. Augmenting this effect is the fact that the burning of aluminium generates an alumina (aluminium oxide) coating over the surface of the aluminium particles. The alumina acts as an insulation layer, requiring the steady application of heat to penetrate. Since the hotness of the explosion is not maintained, but instead decreases over time, the efficiency of combustion is reduced (Türker 2016, p. 426). This has the effect of extending the duration of combustion, extending the release of heat energy, increasing the explosive impulse, extending the radius of the incendiary effect, and thus increasing the probability of igniting other flammables in the vicinity of the explosion. The unavoidable side effect of the reduced efficiency of combustion is that the detonation velocity is slightly lower (1.54 RE) compared to RDX (1.60 RE). The MD-10 base detonating (BD) fuze is used. The deep grooves around the circumference are described as fragmentation grooves to encourage projectile breakup after it passes through armour plate. As usual, the shell has a stamped sheet steel ballistic windshield crimped directly onto the steel penetrator for better aerodynamic performance. Underneath the ballistic cap is the blunt nose of the steel penetrator, meant to improve the performance of the shell on angled armour plates. The hardness rating of the steel penetrator from the tip to the explosive cavity is between 40 to 47 points on the Rockwell C scale, translating to approximately 370 BHN to 451 BHN. This is much softer, and inferior to American APCBC rounds of the same intrinsic design, which are are heat-treated to 600 BHN. For projectiles of this type, steel that is softer than 600 BHN result in a heightened tendency to shatter on impact with hardened armour. This might not make a big difference on the soft cast armour of post-war American tanks, but it may prove troublesome on other tanks and armoured targets. 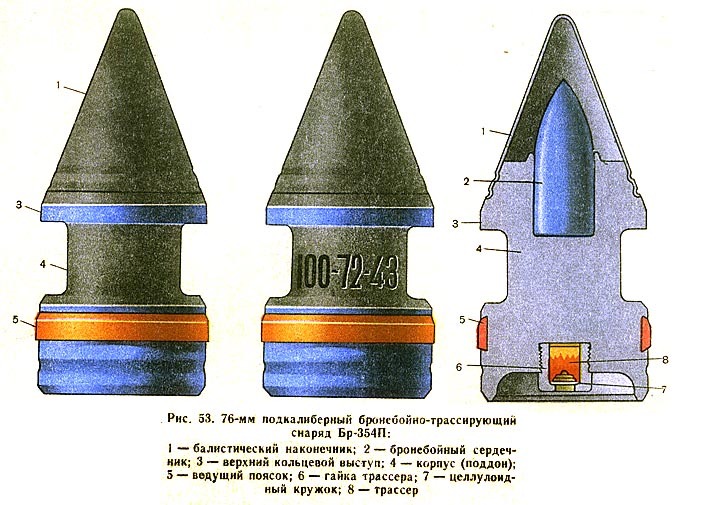 The photo on the left shows a complete BR-350B projectile, and the photo on the right is an illustration of the hardness pattern in Rockwell C. These photos, and the hardness information presented above were obtained from the report "Metallurgical Examination of Soviet 76mm APHE Projectile mod. BR-350B, FMAM 2267" from the Watertown Arsenal Laboratory, which you may download here (link). Having a relatively low muzzle velocity, the shell will reach the velocity at which shattering initiates more quickly as it decelerates during flight. This means that unless the target armour is particularly thin or particularly soft, BR-350B is inherently unsuitable for long range use. 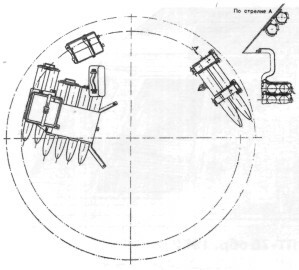 The table below is a firing table for a variety of Soviet 76mm rounds including the BR-350B. Taken from World War II Ballistics: Armor and Gunnery. Despite the relatively low power of the shell, it is still enough to soundly defeat the cast steel frontal armour of an M41 Walker Bulldog light tank from between 1000 to 1500 m, and threaten the flanks of any early WWII era medium tank from 1000 m or more. 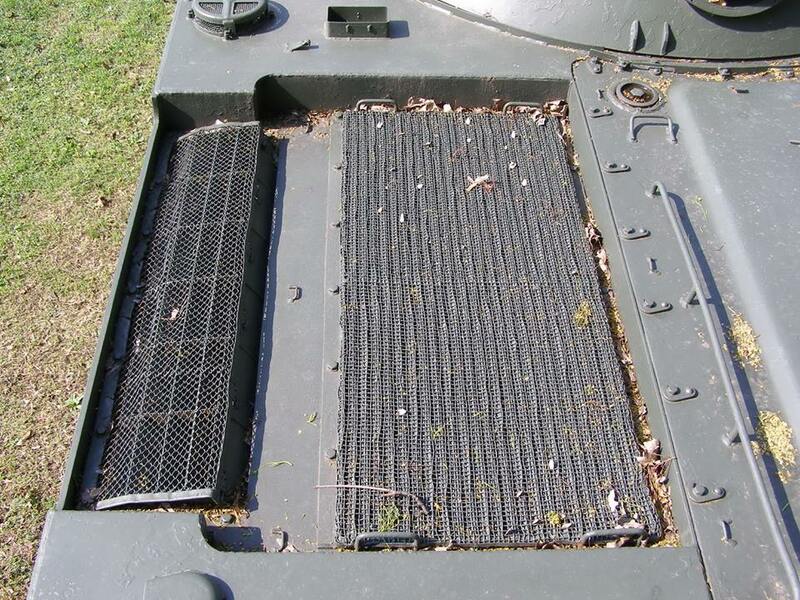 The thin side armour of the British Centurion Mk.3 (51mm) and Chieftain (38mm) compared to the Patton series - even accounting for the steel side skirts - made these tanks especially vulnerable to an ambush by the PT-76. 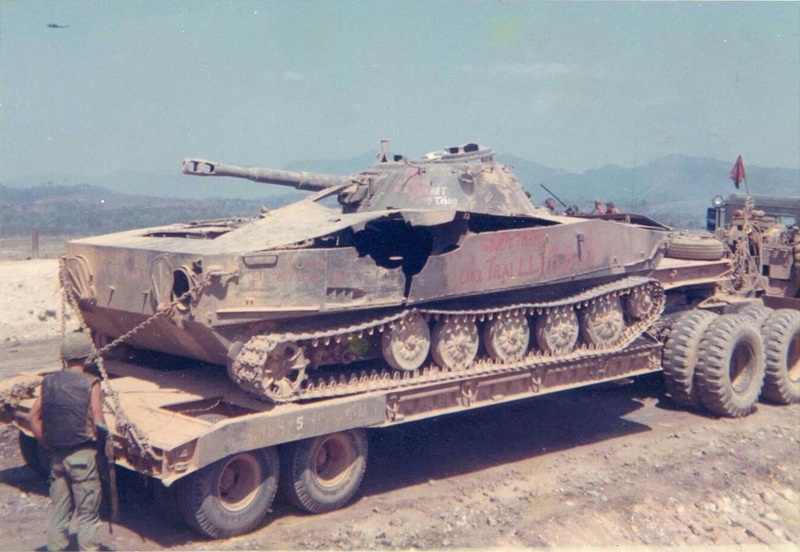 Additionally, BR-350B is theoretically capable of perforating the flat 76mm of side hull armour on the M47 Patton from a distance of 500 meters, but on the other hand, guaranteeing that the shell impacts at an angle that is perfectly perpendicular to the side hull plate is highly improbable even in an ambush scenario. The gunner will be forced to aim for the thinner side armour of the engine compartment (51mm) and hope to set the tank on fire. Entered service for the PT-76 in the first half of the 1950's. BR-354 is ballistically matched to BR-350B, so the generic "AP" range scale in the TShK-66 sight of all PT-76 tanks is compatible with the new round. Like BR-350B, the BR-354B shell has a solid full-bore steel penetrator with an explosive charge at the base, complete with a fuse, but features an armour piercing cap. The cavity for the explosive charge was downsized and the explosive charge was halved compared to the BR-350B in order to reduce the likelihood of the shell shattering prematurely from lateral stresses as it penetrates thick armour plate. 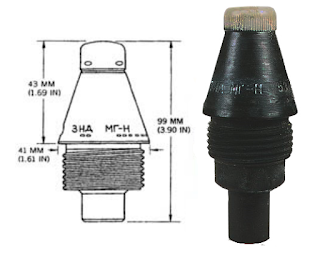 The stamped sheet steel ballistic windshield is crimped onto the steel adapter on the tip of the steel penetrator, and in turn the adapter is affixed to the steel penetrator with tin-lead solder. It is possible that the adapter may behave as a ballistic cap on impact with sloped armour, but it is all but certain that it will not help against spaced or composite armour due to its thinness. Its primary purpose is to provide a proper interface to install the ballistic windshield to obtain a streamlined aerodynamic shape, not to absorb the impulse of the shell impacting armour plating. The penetration of BR-354 is greatly improved compared to BR-350B, and even exceeds the BR-354P APCR round at medium and long ranges. It is more than enough to deal with any light tank fielded by NATO and it is useful against the side armour of most medium tanks that the PT-76 can be expected to encounter in the 1950's, but it is not powerful enough to defeat the frontal armour of a WWII era Allied medium tank, let alone a post-war tank. In this regard, BR-354 is vastly inferior to the M339 APBC-T round (6.6 kg solid steel projectile at 975 m/s) fired from the high pressure 76mm of the M41 Walker Bulldog, which was enough for the frontal armour of the T-34-85 and some parts of the IS-2 at combat ranges. In comparison, BR-354 only increases the range at which the PT-76 can perforate the side armour of contemporary medium tanks at a flat angle - it does not change the tactical value of the PT-76 in any significant way. The original Soviet "arrowhead" APCR round with a tungsten carbide core The tungsten carbide core is carried inside a steel body, onto which the copper driving band and tracer is fitted. A conical aluminium windshield is crimped on the circumference of the steel body to improve the aerodynamic performance of the projectile, but the shape of the projectile is still not streamlined. 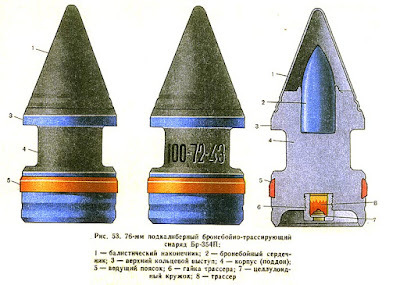 The development of Soviet APCR ammunition began in 1942 based on captured German PzGr.40 shells. The first examples were developed for the 45mm obr. 1932 and obr. 1937 anti-tank guns due to the ubiquity of these guns on the Eastern Front, and the engineers followed up with the design of the BR-350P shell in the fall of 1942 for 76mm field guns. 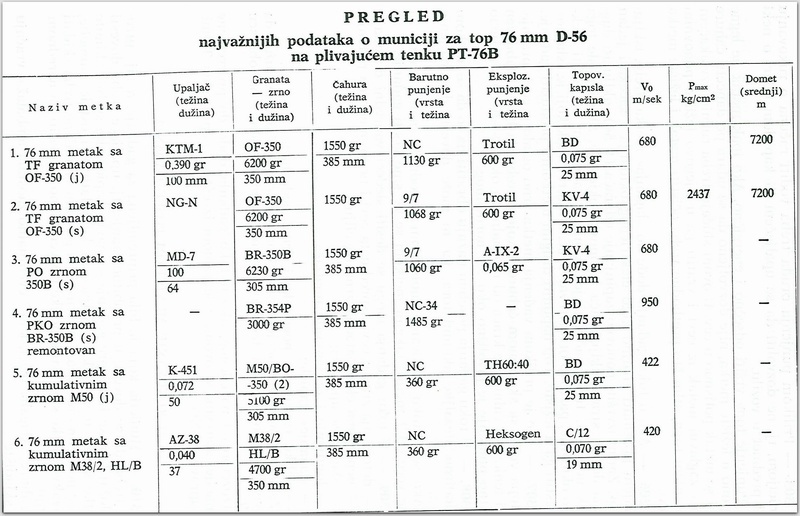 Mass production of APCR rounds for all calibers including for the 76.2x385mm cartridge began in 1943. The original variant of the BR-354P round featured a rather small core held in a large steel body. The bulk of the projectile is steel, with the tungsten carbide core occupying only a small volume of the complete projectile assembly. Strangely, the core in this early BR-354P shell has a much lower elongation than the core of the 45mm BR-240P, which was apparently due to the difficulty in sintering the thicker cores of the BR-354P. The tungsten carbide core measures 72mm in length and weighs 0.48 kg. Because of the greatly reduced mass of the projectile compared to other ammunition available for the D-56T, the muzzle velocity of BR-354P is much higher, although the less aerodynamic shape of the projectile generates an accelerated loss in velocity over long distances. Even so, the shell travels faster than the other anti-armour options for the PT-76, which limits the effect of crosswinds and produces a flatter ballistic trajectory, especially at short to medium distances where most tank combat is expected to occur. The reduced flight time also makes it easier to hit moving targets because the margin of error in leading the target is much more generous. Overall, scoring direct hits with BR-354P should be at least slightly easier when compared to other armour-piercing shells, so it may be useful in certain circumstances even when APHE and HEAT is available. BR-354P is good enough to reliably defeat the armour of the light tanks operated by NATO forces, but its usefulness is generally quite limited against any combat vehicle with more armour than an M41 Walker Bulldog. The likelihood of a PT-76 knocking out the AMX-30 and Leopard 1 with this shell is very low from the front, but BR-354P has enough penetration power to deal with the side armour of most medium tanks. 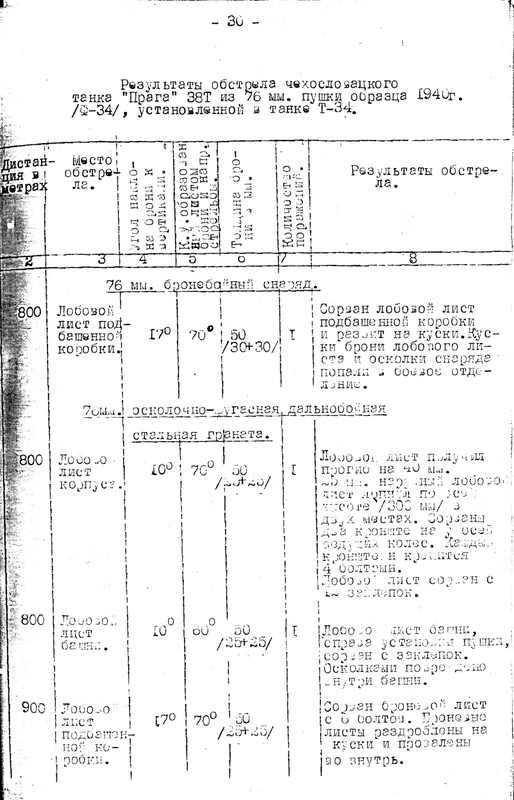 During the "Great Patriotic War", the official maximum effective range of BR-354P was only 500 meters, and the gunners of ZiS-3 field guns and SU-76 self-propelled guns were instructed to fire 500 meters or less. This did not change after the conclusion of the war, and the maximum effective range remained listed as 500 m.
Due to its obsolescent design, the armour penetration power is markedly lower than it should be for a shell fired from a medium pressure gun like the D-56T. 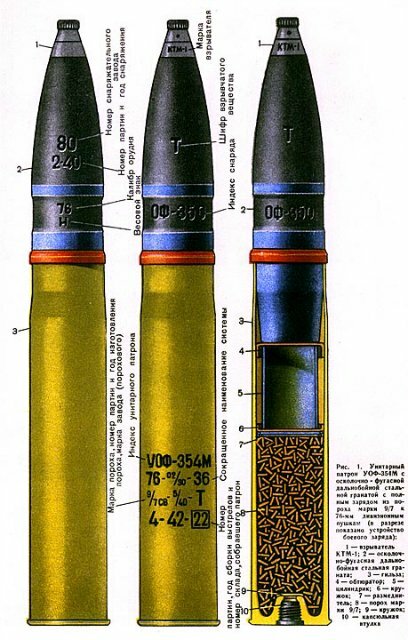 The biggest issue is the use of steel for the body of the projectile instead of aluminium, like contemporary American 76mm HVAP rounds. 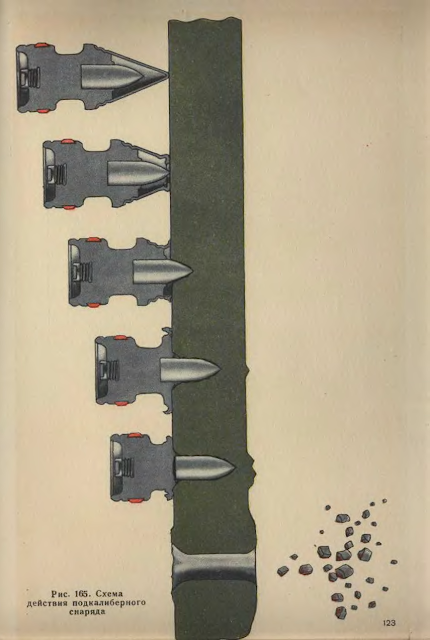 Upon impact, the soft steel body is stripped away from the core and mushrooms out on the surface of the armour plate while the core penetrates the plate on its own, as illustrated in the drawing below. 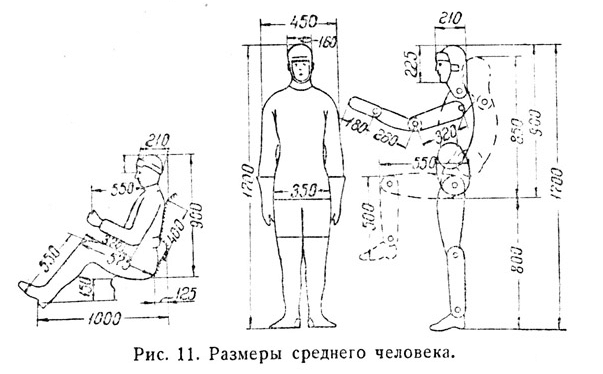 The drawing is taken from "Артиллерия" (Artillery) published by the USSR Ministry of Defence, page 153. Since the steel body does not contribute to the penetration power of the shell, an aluminium body is much more suitable as the lower density of aluminium would reduce the parasitic mass of the projectile and thus increase its velocity. 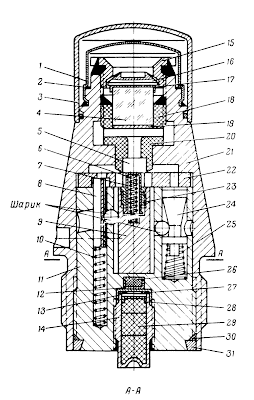 As you can see in the drawing above, a type of 76mm APCR shell with a large tungsten carbide core existed, and in fact, there are several known BR-354P variants. 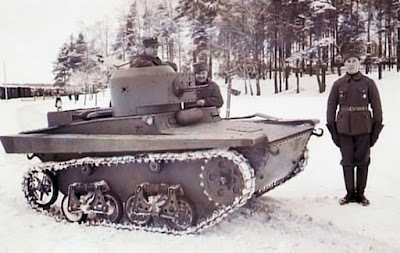 The original small core design persisted until the end of the war in 1945, but it was supplemented by two newer variants. One of them is the design with a large core shown above, which probably entered service after the war, and the other is an economical alternative using a bimetallic core composed of a tungsten carbide tip attached to a cylindrical steel slug, as shown in the drawings below. This variant was based on feasibility studies in 1942 aimed at reducing the quantity of tungsten needed for the newly developed 45mm APCR shells, due to the limited supply of tungsten. The tungsten carbide tip on this variant of the BR-354P was slightly smaller than the original core, but the addition of the steel slug increases the total kinetic energy of the core due to its mass, so in effect, the rate of deceleration of the bimetallic core inside an armour plate during penetration is lower than the solitary small tungsten carbide core of the earlier design, so better armour penetration can be achieved. After the tungsten tip is destroyed or fully eroded, the steel slug can continue penetrating the armour plate, or act as additional shrapnel after the armour plate is defeated. The objective of reducing the use of tungsten was achieved in the 45mm version albeit with a small reduction in penetration power, so it can be expected that it was achieved . The bimetallic core measures 90mm in length and weighs 0.68 kg. Besides the larger core, nothing else about this variant was changed. Another variation of the BR-354P design features a double crimp to secure the ballistic cap to the steel body, but it is unclear how this variant relates to the differences in the core. UBR-354N is a post-war APCR round used in the PT-76 as a replacement for the UBR-354P round. 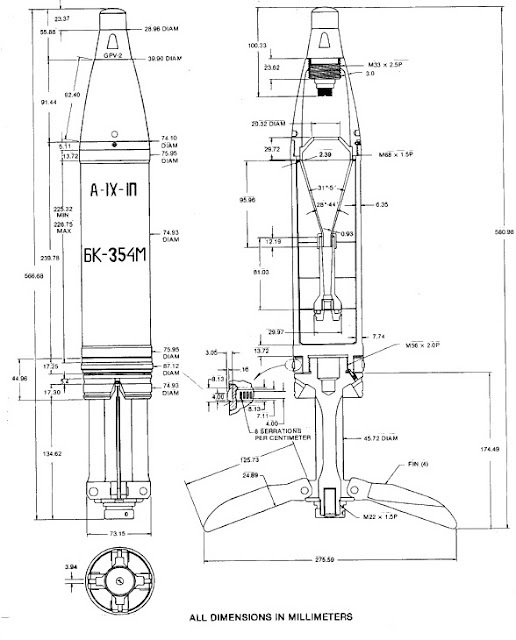 The main improvement over the "arrowhead" BR-354P was the greatly improved aerodynamic characteristics of the projectile. Instead of a simple conical ballistic cap over the tip, BR-354N has an ogived aluminium ballistic cap and a cylindrical aluminium sleeve to streamline the steel body of the projectile. Internally, there are not many differences between it and the latest BR-354P variant with the large tungsten carbide core, except that BR-354N has an additional soft steel cap over its core. The cap appears to be to prevent the core from shattering on impact, but it does not appear to have much benefit on slanted impacts from comparing known armour penetration values. The design of the projectile shares much in common with the 85mm BR-367N, which should not be surprising given that both were developed as part of the same research program. The maximum effective range is listed as 1500 meters - a huge improvement over the BR-354P. At 1500 meters, the penetration of BR-354N is the same as the penetration of BR-354P at 500 meters. Introduced in 1955. 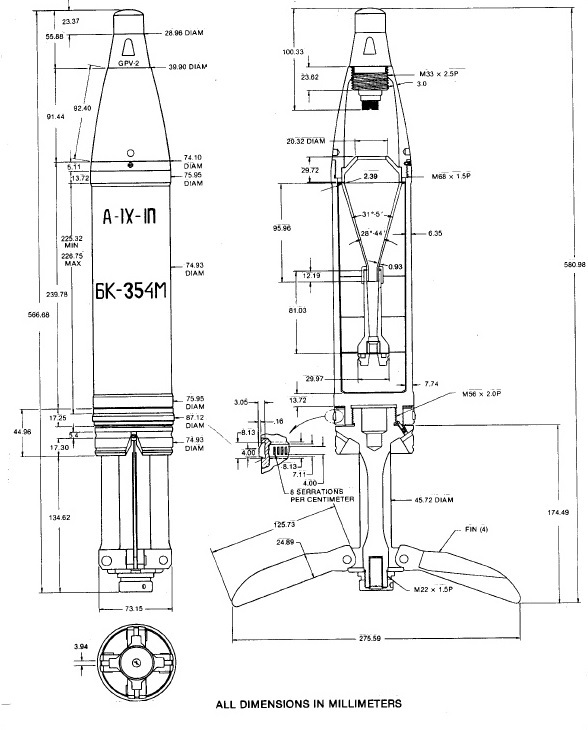 Unlike the spin-stabilized UBP-354A HEAT rounds that entered service in mid-1942, BK-354 is a more sophisticated fin-stabilized round, but its technology was not the most modern at the time. The shaped charge liner, for instance, has a flash tube extending from the apex of the cone to the base-detonating fuze like the BP-354A. The need for the flash tube came out of a lack of reliable piezoelectric PIBD fuzes like the 509A1 (used in the majority of Cold War-era American HEAT shells from the 76mm M496 to the 152mm M409), so the GPV-1 and GPV-2 "spitback" point-detonating (PD) fuze was used instead. The lack of a shaped charge liner apex changes the shape of the liner from an optimal conical shape to a sub-optimal truncated cone, and the presence of the flash tube creates a cylinder of empty air on the axis of the liner. This interferes with the propagation of the blast waves during detonation and has a negative influence on the formation of a precise high velocity shaped charge jet. 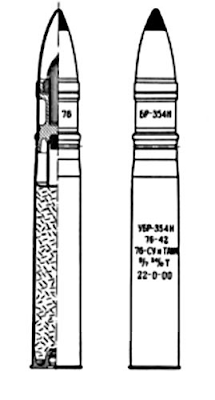 The flash tubes in HEAT warheads with early "spitback" type fuzes were designed to funnel and direct the hot gasses from the explosive booster charge of a simple PD fuze into a second booster charge at the base of the warhead, which detonates the explosive charge of the warhead. The flash tube in BK-354 is designed for the same purpose, except that the GPV-1/2 fuze has a shaped charge booster instead of a simple explosive type. This can be seen in the diagram below, labelled (29). 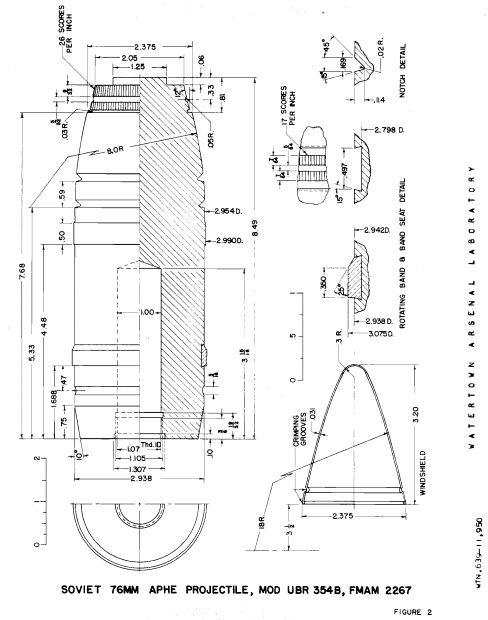 The shaped charge booster is fitted with a detonator cap, but the assembly is contained in its own cavity, physically separated from the rest of the fuze assembly. Upon impact, the piezeoelectric crystal labelled (4) experiences a powerful shockwave and converts the mechanical stresses into an electrical impulse. A potential difference of several kilovolts is produced, which is discharged at the electrodes in the spark gap of the spark detonator. This detonates an initial booster charge, which sets off the detonator cap through the walls of the steel cavity via the shockwave of the explosion. In turn, the detonator cap sets off the shaped charge booster, sending an explosively formed penetrator (EFP) down the flash tube and into the secondary booster charge. The impact of the EFP is enough to set off the secondary booster charge, and this finally detonates the explosive charge of the warhead. The shaped charge booster is more reliable than the old simple explosive booster, but still slower and less reliable than a purely electric piezoelectric PIBD fuze which skips the cascade of booster detonations in the fuze to directly detonate the secondary booster charge at the base of the warhead via a spark detonator. Since there is a lengthier period between fuze initiation and warhead detonation, the standoff distance between the shaped charge cone and the surface of the target at the moment of detonation will be reduced, potentially limiting the penetration power of the shell. 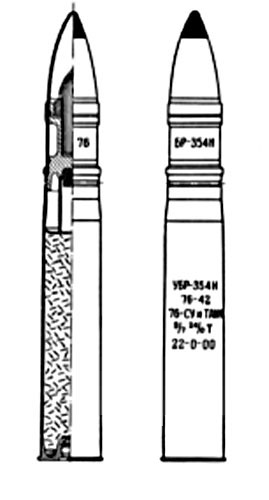 The GPV-2 fuze is also used in the 100mm BK-5 HEAT shell, and there is evidence that it is effective at very high angles of impact, but besides the different fuze, the warhead in BK-354 does not feature any real improvements over the earlier BP-354A shell, so it appears that the improvement in armour penetration comes mainly from the fin stabilization scheme. The standoff distance is around 2.9 calibers (166mm). The greater mass and dimensions of the BK-354 projectile necessitated a 20% reduction in the propellant charge mass from 1.08 kg to 0.9 kg, so the shell has a comparatively low muzzle velocity. Coupled with the added drag from the pop-out stabilizing fins, this generates a more pronounced ballistic arc and reduces the battlesighting distance and the maximum effective range accordingly. 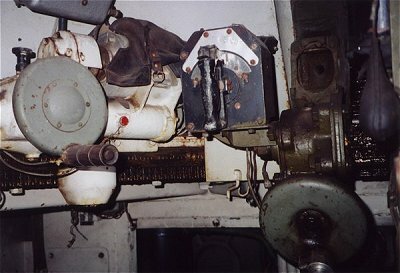 As mentioned before, the TShK-66 sight for the PT-76 lacks a range scale for HEAT rounds, so the gunner must refer to a range table. It is interesting to compare the penetration of M496 HEAT fired by the 76mm of the M41 Walker Bulldog to the BK-354, as both rounds entered service in 1955. M496 has a copper shaped charge liner with a Comp. B charge capable of penetrating 220mm of armour steel, while the BK-354M variant of the BK-354 with a copper liner is said to have 200mm of penetration. The 10% difference exists despite multiple factors in favour of the Soviet design: the detonation velocity of A-IX-1 is significantly higher than Comp. B - 8,450 m/s to 7,900 m/s - and the detonation pressure of A-IX-1 is also higher - 30 GPa to 27 GPa, and the 0.5 kg of Comp. B in the M496 is much lighter than the 0.74 kg charge in the BK-354M. 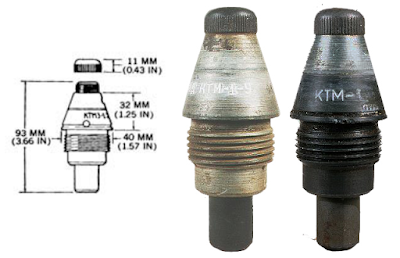 The only reasonable explanation for the lower performance of BK-354M is the lack of a liner apex and the reduced standoff distance due to the slower action of the spitback fuze. Although the nominal penetration power is sufficient for most tank-type threats that the PT-76 may encounter in a European land war, BK-354 is not enough for American medium tanks like the M47 which filled the ranks of many NATO countries like West Germany, France, Belgium, and others. Technically, the 100mm of upper glacis armour on the M47 can be defeated by BK-354, but only for a perfect straight-on hit. Any amount of sideways angling of the hull would render it immune to the shell from the front, and even if the warhead managed to pierce the armour, the beyond-armour performance (spalling, residual cumulative jet particles, etc) will not be enough to do any meaningful damage to the internal equipment or to the crew. The turret of the M47 is nominally thinner, but the complex shape of the casting ensures that even if BK-354 can perforate the armour, the beyond-armour performance will be as weak as on the upper glacis plate. Nevertheless, the penetration power of BK-354 is reliable enough to deal with common tanks like the Centurion Mk. 3 from the front, and capable of inflicting serious damage to any medium or heavy tank from the side on a direct hit. By virtue of its indifference toward impact velocity, shaped charges would not be affected by the low chamber pressure of the D-56T gun and the resultant low muzzle velocity, so it is easy to see why the amount of APCR ammunition carried in the PT-76 dropped sharply as soon as HEAT ammunition was available. Like most other armoured vehicles of its time, the PT-76 is armed with an SGMT co-axial machine gun. The machine gun is fed with separate 250-round boxes, of which four are carried in the tank for a total of 1000 rounds of ammunition. 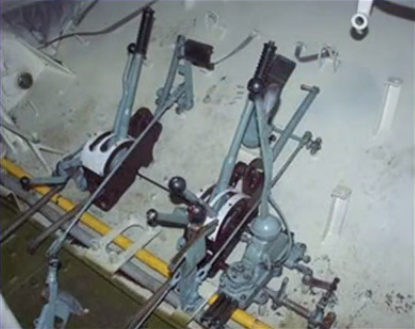 The machine gun is fed by one box, and the other three boxes are stowed on an adjacent metal rack to facilitate quick replacement and reloading. A thousand cartridges is not a large quantity, especially considering that the PT-76 is typically the only tank available to support Naval Infantry companies, and a large amount of ammunition will have to be expended to suppress and defeat enemy infantry, as mentioned earlier in the section on the D-56T. A thousand rounds is not significantly more than the ammunition load of a motorized infantry platoon, and it is also much less than the 3,500 rounds carried in a T-54. It is even less impressive considering that the only other mounted machine gun available to the common Naval Infantryman at the time was the SGMB or DShK machine gun on a BTR-60, which could carry 2,000 rounds for the for the former and 500 for the latter, supplemented with another 3,000 rounds for a pair of auxiliary SGMB machine guns for the passengers. 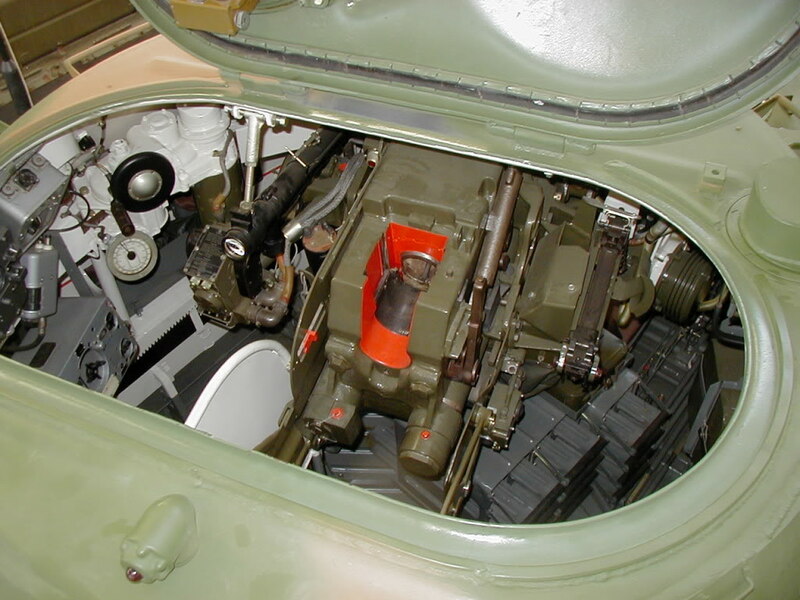 Fortunately, the PT-76 is spacious enough that several more boxes of ammunition could be placed on the floor of the tank without affecting the work space of the crew, so if, for example, additional boxes were stowed to the right of the driver or in the small space in front of the engine compartment bulkhead, the loader could conceivably replenish his ready racks for the co-ax during a lull in the fighting without any real trouble. Nevertheless, the lack of proper storage racks close to the loader (the empty hull sponsons would be the perfect location) is perplexing given the large surplus of space inside the tank, and the need for improvisation is not an ideal solution. The turret and hull are constructed from welded 2P grade high hardness, high strength armour steel plates with thicknesses ranging from 6mm to 15mm. 2P grade plates for this range of thicknesses have a tensile strength of 1450 MPa and a hardness of 388-495 BHN (average 450 BHN) for plate thicknesses of 8-14mm, representing the plates used in the PT-76. The direct foreign equivalent of this grade of steel is MIL-DTL-46100 high hardness armour steel for combat vehicles, but Bisalloy 450 is also a good representation of 2P, since the physical properties of Bisalloy 450 are identical to 2P and it has itself passed the MIL-DTL-46100 standard. 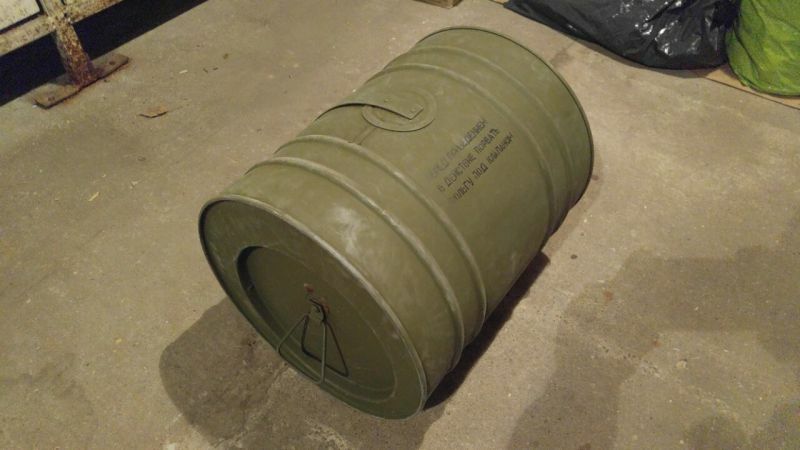 Since MIL-DTL-46100 is recognized by the U.S Army to be equivalent to the steel grade used on Soviet armoured personnel carriers and infantry fighting vehicles, we will be using the ballistic limit data on MIL-DTL-46100 for our assessment of the protection level offered by the PT-76. 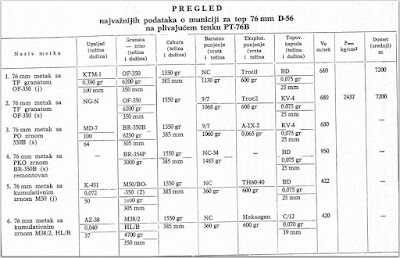 It is important to note that '2P' grade steel is considered HHA (High Hardness Armour) and not RHA, so a direct comparison between the penetration values of various bullets in RHA and the physical thickness of the armour of the PT-76 is superficial at best, and totally invalid at the worst. For the curious: the steel grade commonly termed "RHA" used as vehicle protection as well as for official proof and acceptance testing purposes is classified as MIL-DTL-12560. RHA is significantly weaker than HHA against steel cored armour piercing bullets due to lower strength and hardness. It also performs worse than HHA when set at a slope, as the lower hardness makes it less effective at deflecting bullets. We will be examining the resistance of the armour against .30 caliber M2 AP (30-06 M2) and .50 caliber M2 AP only, as these were the most common types of machine gun ammunition at the time in the arsenals of the probable enemies of the USSR at the introduction of the PT-76. Technically speaking, 7.62x51mm M61 AP would be more common as it was a standardized NATO cartridge, but M61 AP has less penetration than M2 AP, especially on sloped plate, due to the very low elongation of its steel core, its excessively sharp ogived tip, and its low muzzle velocity compared to M2 AP. Case in point: the official penetration of M61 AP at 300 m is 7mm RHA, but the penetration of M2 AP at the same range is 10.3mm RHA. In this respect, the PT-76 is slightly over-armoured because NATO and many non-NATO nations standardized on the less powerful 7.62x51mm caliber during the early 50's. The FN FAL, for example, was the standard battle rifle for most NATO countries in the 50's, and beginning in 1957, the 7.62x51mm caliber began to replace 30-06 as the U.S Army transitioned from the M1 Garand to the M14 battle rifle. 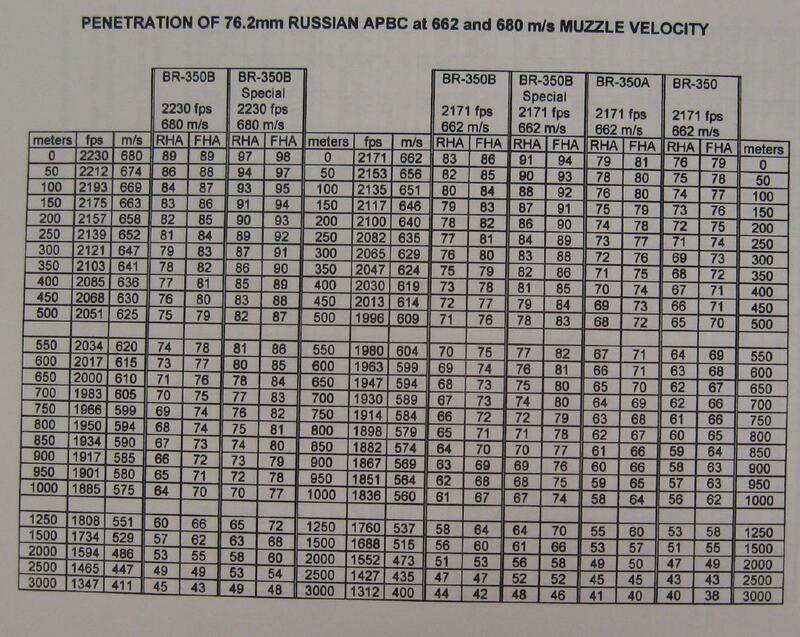 The military specification documents use V50 to express the penetration in terms of bullet velocity, so to find the range corresponding to the bullet velocities given in the tables, we will have to refer to a ballistic chart calculator for the 30-06 (set ballistic coefficient: 0.451, velocity: 850 m/s, weight: 150 gr) and this chart for the .50 cal M2 Ball, which is ballistically identical to M2 AP. The sharp vertical sloping of the frontal hull projections was an important aspect of the protection scheme of the tank due to the ricocheting of impacting projectiles combined with a phenomenon known as "shattergap", the latter being a reliable mechanism for projectile defeat. When the sharp-tipped steel core of an armour piercing bullet (M2 AP for .30 cal and .50 cal) impacts an oblique armour plate, the tip experiences an asymmetric force. The part contacting the armour plate encounters strong resistance by the tough and hard plate, but the opposite end of the tip is exposed to nothing but air, and because of this, the high stresses accumulating in the tip are released into the direction of least resistance, leading to the shattering of the tip of the bullet. The higher the obliquity of the armour plate, the more pronounced the effect. At very high angles, the entire bullet is liable to shatter and ricochet, leaving only surface damage on the plate. The upper glacis plate was 10mm thick and sloped at 80 degrees, making it essentially impenetrable to any machine gun bullet in service even today, because even a tungsten carbide (cermet) cored 14.5mm BS-41 bullet will ricochet and experience catastrophic destruction on impact with a high hardness steel plate at such an angle. There is no point in finding any references to see how much steel .50 cal M2 AP can penetrate at this angle - it is sure to glance off. In order to reduce the weight of the tank, the thickness of the upper glacis plate was reduced from 10mm to 8mm in May 1962. This did not have any appreciable effect on its resistance to machine gun bullets, since the angle of the slope is so high that a ricochet is practically guaranteed even with the slightly thinner plate. The lower glacis plate is thicker at 13mm, but less sloped at only 45 degrees. Finding references for ballistic testing on armour plates sloped at this specific angle is extremely difficult, but according to an article titled "Our Planes Can Take It" published in the July 1944 issue of Popular Science, a half-inch (12.7mm) plate of homogeneous or face-hardened steel set at 45 degrees can withstand a .50 caliber bullet at 50 yards. Keeping in mind that .50 cal M2 Ball can only penetrate 13mm of homogeneous armour at 0 degrees at a distance of 200 m, and that it would definitely penetrate much, much less than that at 45 degrees even at 50 yards, it seems the article is referring to .50 cal M2 AP in this instance. Whatever the case may be, a good rule of thumb is that steel cored bullets or cannon shells invariable penetrate less armour in LOS thickness at any angle more than 0 degrees. 13mm of armour sloped at 45 degrees produces a LOS thickness of 18.4mm, and the distance where .50 cal M2 AP penetrates an equivalent thickness of MIL-DTC-46100 rated steel is 200 yards, where a 15.8mm plate sloped at 30 degrees offers a LOS thickness of 18.4mm. It is safe to assume that a 13mm plate angled at 45 degrees is more resilient than a 15.8mm plate angled at 30 degrees, so the maximum distance where .50 cal M2 AP is able to penetrate the lower glacis of the PT-76 should be less than 180 meters (200 yards). If "Our Planes Can Take It" is to be believed, then the bullet will be deflected at a distance as little as 50 yards. A safer bet would be that the lower glacis is immune at 100 m and above, since the term "ballistic limit" implies that the bullet will penetrate at a certain velocity and the corresponding distance. Needless to say, the front of the hull is not a viable target for a .50 caliber machine gun at combat distances, and the chances of getting through are extremely slim even if the tank were one street block away from you (200-274 m), and that's for a head-on shot. If the tank were to be angled a few degrees to the side, defeating the lower glacis would become completely impossible. In 1957, the hull was modified with an increased height at the turret ring to ensure that the gun could depress by -4 degrees when aiming behind the tank, over the engine deck. This was done by raising the hull by 60mm at the turret ring, so that the side profile of the tank gained a distinct rearward slope like an M4 Sherman. This had minimal secondary effects on the other characteristics of the tank. In October 1962, the hull was raised again by 70mm to improve its buoyancy, and the angle of the lower glacis was increased from 45 degrees to 55 degrees. All PT-76 tanks built in the subsequent years followed the obr. 1962 design. The upper side hull plate is 13mm thick, and the lower side hull plate is 10mm thick. The ballistic limit of .30 cal M2 AP for a 10mm plate of Bisalloy steel with a hardness of 450 BHN at 0 degrees is known to be 702 m/s (2303 ft/s), corresponding to a distance of just under 228 meters (250 yards). Being the weaker half of the side hull plates, this is not too bad, considering that a shooter would have to able to fire at a perfectly perpendicular angle to the side profile, which is not very likely. Even if the shooter is able to line up a shot at the perfect angle, the chances of hitting the exposed parts of the lower side hull are not too high, since half of the plate is concealed under the running gear of the tank as you can see in the photo below, so the chances of successfully damaging the tank from the side is reduced even further. The upper side hull plate is completely immune since .30 cal M2 AP can be stopped by half an inch (12.7mm) of high hardness armour at a velocity of 869 m/s - a velocity that is considerably higher than the muzzle velocity of the same bullet from an M1 rifle or an M1919 machine gun. Overall, this means that the side of the PT-76 is generally quite resilient against rifle fire. If the shooter is using a battle rifle or a machine gun loaded with M61 AP, the chances of defeating the side hull plating of the PT-76 are essentially nil. 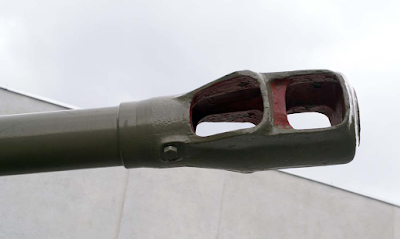 If a .50 caliber M2 AP bullet impacts at a perpendicular angle to the lower side hull armour of the PT-76, the 10mm plate can be perforated at a maximum distance of 1200 meters. The upper side hull armour is slightly more resilient, but it can still be perforated at a distance of around 1000 meters. In spite of that, this does not necessarily mean that the tank can be destroyed at such distances with a single M2 Browning heavy machine gun in real combat conditions. The main issue is having the opportunity to fire at the side of a PT-76 at a perfectly flat angle and obtaining repeat hits using only iron sights at such a long distance. 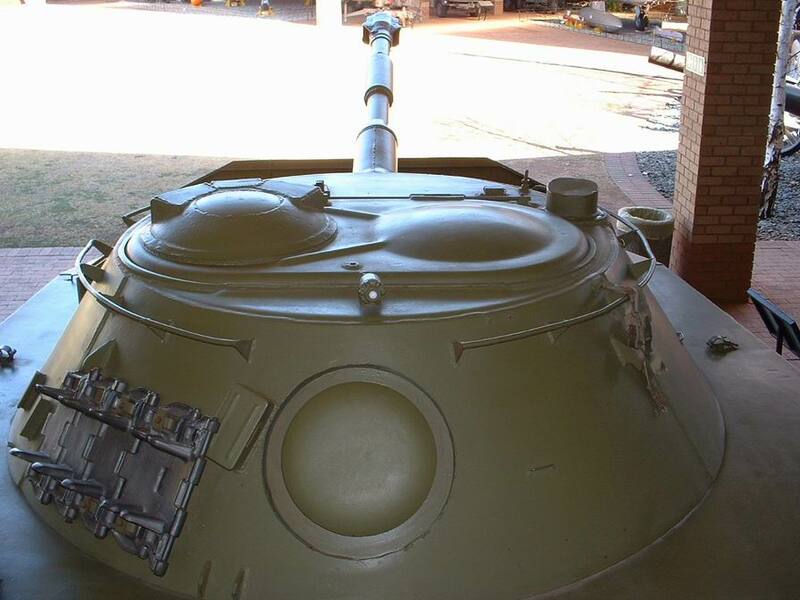 In reality, the side plating of the PT-76 can be immune to .50 cal M2 AP at distances as short as 600 meters if the bullet impacts at a 30 degree angle - short enough that a machine gun nest can be easily seen and destroyed by the tank. In 1967, the armour scheme was changed again, albeit very slightly. The armour on the hull and turret remained absolutely identical to the 1962 model, but the angled lower plate at the stern of the hull was thickened from 6mm to 8mm. This modification probably helped to improve the protection of the transmission from artillery shell splinters, but the objective was to increase the rigidity of the stern of the hull. This modification had little effect on the legacy of the tank, as the mass production of the PT-76 in the Soviet Union ended in 1967. The turret is made from two curved steel plates of different thicknesses - 15mm and 10mm - welded together to form the front and back walls respectively. 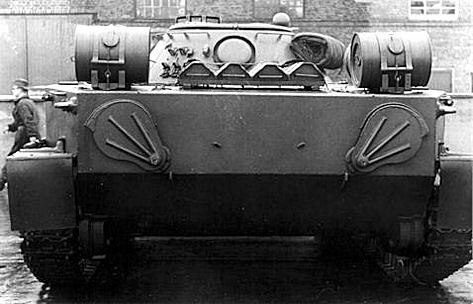 The thicker 15mm front plate covers around 3/5 of the circumference of the turret, and the other 2/5 is covered by the thinner back plate. The roof is a single flat plate with a thickness of 6mm. The greater thickness of the armour plate of the turret compared to the front hull armour plating is ostensibly counteracted by the reduced vertical slope compared to the front hull armour, but the curvature of the round turret creates horizontal sloping that must be taken into account as well. 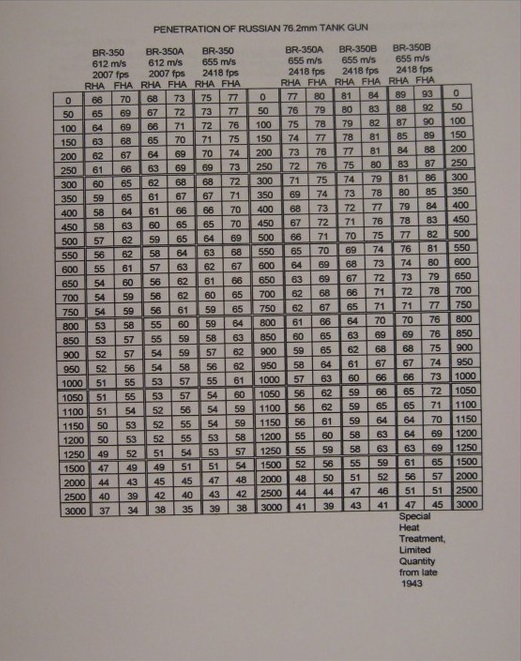 The V50 ballistic limit for .50 cal M2 AP and 14.5mm B-32 for a MIL-DTL-46100 plate identical to the grade of armour plate used on the PT-76 can be obtained from this specifications document. According to the document, the ballistic limit for .50 cal M2 AP for a 15mm plate (0.59 inches) at 30 degrees is 815.3 m/s (2675 ft/s), which corresponds to a distance of between 250 to 300 yards, or around 250 meters. Since the slope of the armour plating on the turret is slightly more than 30 degrees, we can lower the distance of the ballistic limit to approximately 200 m. Note that the term 'minimum ballistic limit' in the document is defined as the minimum thickness of the plate where a projectile will penetrate it with a probability of 50% at a given velocity, so the estimated ballistic limit of 200 m for the armour plate of the turret could be considered the maximum distance where .50 cal M2 AP will penetrate. However, that does not mean that the turret can be penetrated at 200 meters, because the armour plate on the turret is not only sloped in the vertical plane, but curved in the horizontal plane as well, since the turret is round. The distance at which the turret is completely immune should therefore be below 200 m in realistic conditions. The ballistic limit for 14.5m B-32 for the same plate at the same angle is much lower than for the .50 cal round - only 717 m/s (2353 ft/s). According to the firing table for 14.5mm M-44 ball, this corresponds to a distance of between 960-1000 meters (1050-1100 yards), or around 980 meters. Using the same logic as before, this implies that the turret can only guarantee complete immunity from 14.5mm B-32 at a distance of somewhere below 980 meters. This essentially means that the turret can be pierced with a KPV machine gun at the same distances where a man operating a tripod-mounted KPV machine gun can be expected to reliably hit a tank-sized target with iron sights. However, unless the enemy somehow captures and fields 14.5mm weapons en masse, this is hardly a concern for the crew of a PT-76. The back of the turret is only protected by 10mm of steel angled at 35 degrees, but this is more than enough to reliably withstand .30 caliber M2 AP rounds at any range. The specified thickness of 10mm (0.393 inches) does not even appear on the table of ballistic limits for .30 cal M2 AP, meaning that the bullet would have to travel at velocities greatly exceeding muzzle velocity to have a chance of penetrating a 10mm plate angled at 30 degrees. Defeating a curved plate angled at 35 degrees would be completely impossible. One of the testimonies comes from these excerpts of an interview with retired Colonel Paul Longgrear on the infamous Battle of Lang Vei, which took place between February 6-7, 1968. The battle involved a massed NVA attack with sixteen PT-76 tanks. Several PT-76 tanks were lost to HEAT shells from a single 106mm recoilless rifle during the assault. 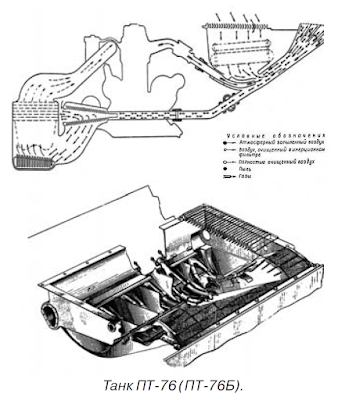 As a light tank, the PT-76 can hardly be expected to survive direct hits by large caliber HEAT shells, and neither could any tank from the era, for that matter, so the crux of the issue is whether they were used in such a way so as to minimize the chance of getting hit while maximizing their own potential. This was not the case. Even if the armour of the tank was sufficient against gunfire, it was not thick enough to be effective at resisting high explosive shells. 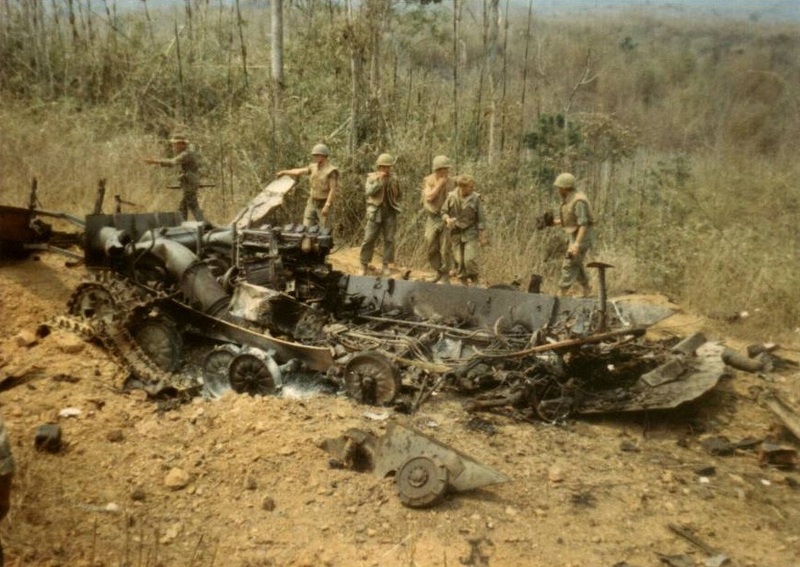 For example, take the two PT-76 tanks and single BTR-50 APC destroyed during the failed NVA night assault on a U.S special forces camp at Ben Het on the 3rd of March 1969. 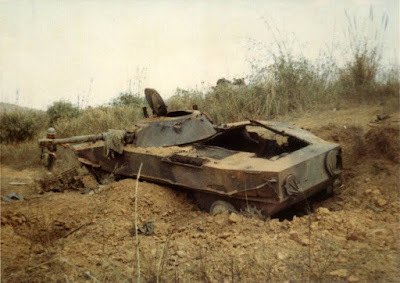 There can be no doubt that the attack was extremely daring, since the NVA attack force rushed across an open valley to a camp defended by three entrenched M48 Pattons, relying only on the cover of darkness to approach close enough so that they would not be taken out at long range by the Pattons which were sitting at elevated positions (West Hill) overlooking the valley. However, the location of the attacking vehicles was uncovered when one of the vehicles accidentally ran over an anti-personnel mine. The excerpt below comes from an article describing the attack, and it mentions that the Pattons fired high explosive rounds at the approaching enemy vehicles. A full account of the event is given here (link). "As darkness settled over the camp, the defenders were on high alert, awaiting what they assumed would be a full-force NVA attack by units of unknown size and capabilities. At 2100 hours, the camp began receiving recoilless-rifle fire, followed by heavy mortar and artillery fire. Over the roar of the artillery, the tank crews began to hear the familiar sound of engines, and this time it was coupled with the distinctive rumbling of tracked vehicles. Stovall was scanning the area with a night-vision scope and infrared searchlights when an enemy vehicle was suddenly illuminated. It had detonated an anti-personnel minefield located about 800 meters from the camp’s perimeter, and some portion of the vehicle had caught fire. In the light thrown out by the blaze, three NVA tanks and an armored personnel carrier were visible. The lumbering vehicles were approaching the coils of concertina wire surrounding the camps perimeter and the U.S. tank crews opened fire with high-explosive rounds.."
The two photos below show one of the two destroyed PT-76 tanks from the battle. This one was clearly hit from the side by one of the aforementioned 90mm HE shells fired by the defending Patton tanks. The shell likely entered from the right and exploded inside the engine compartment, demolishing the roof from the inside. Here's another photo of the same tank, either before or after it was loaded onto the flatbed truck that we see in the photo on the left. The second PT-76 destroyed in the battle is shown in the two photos below. Almost everything inside the tank is blackened by fire, but the lack of debris inside the hulk itself shows that most of the internal equipment didn't burn down from an inferno, but was blasted away from the tank by an ammunition explosion or something to that effect. "The exchange of fire continued briefly, but enemy fire gradually subsided. The NVA vehicles were withdrawing; the expected ground assault was not going to take place. U.S. tanks fired several more HE rounds into one of the enemy hulks, reducing it to a pile of rubble, just as B Company’s 2nd Platoon arrived in relief." Having mentioned anti-personnel mines, it should be noted that the extremely thin hull belly plating of the PT-76 is more than enough for any anti-personnel mine, but not nearly enough for any anti-tank mine. 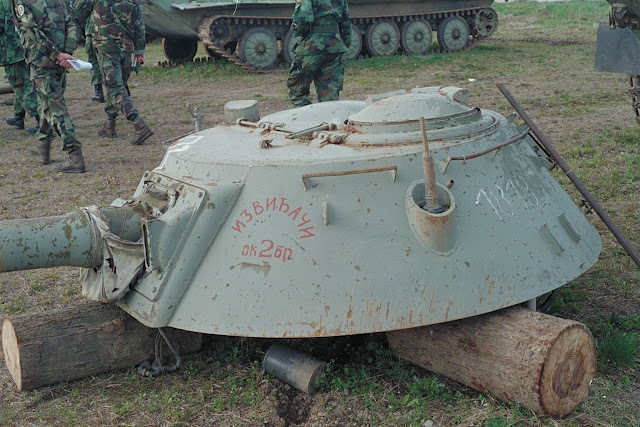 If a PT-76 were to detonate a typical 8-10 kg anti-tank land mine like an M15 under its tracks, a large part of the belly would be completely obliterated and the tank would probably be flipped over by the blast. Smaller anti-tank mines designed for breaking tracks would be more than capable of puncturing the belly even if they are detonated under the tracks and not directly underneath the tank. Besides the threat of mines, it would not be difficult to inflict serious damage on the suspension of the tank with the shell splinters of a 105mm artillery shell detonating close by. 155mm artillery would be particularly lethal as the penetration power of shell splinters produced by a typical 155mm high explosive shell should be enough to perforate the rear armour from 100 meters and the side armour from more than 60 meters (based on STANAG 4569 specifications). 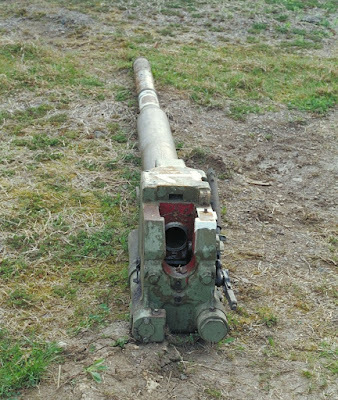 Close detonations of 152/155mm artillery shells are known to be powerful enough to completely demolish tank suspensions and knock out external devices, and the PT-76 would be highly vulnerable to such attacks. Airbursting 155mm shells are the most dangerous threat, as the thin roof armour would be easily penetrated by the shell splinters from typical detonation altitudes even at a high obliquity. The earliest variants of the PT-76 were equipped with two BDSh-5 smoke bombs. The BDSh-5 was developed in 1944 for the T-34-85 and armoured fighting vehicles derived from the T-34. It continued to be used in a number of Soviet tanks until it was withdrawn from service in the 1950's due to the advent of self-generated smoke using the TDA smokescreen system. The PT-76 used the BDSh-5 until 1957 when it received the TDA smokescreen system, whereupon the metal brackets originally intended for the smoke bombs were repurposed for fuel drums. 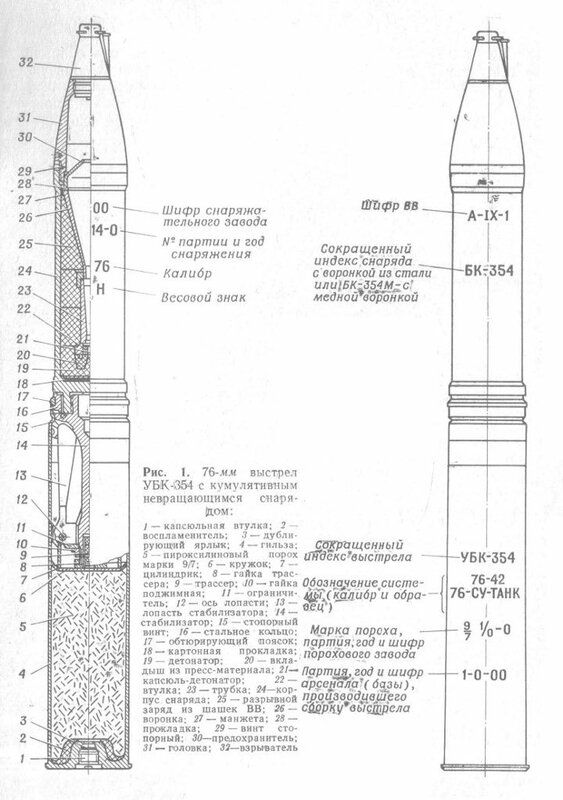 The BDSh-5 measures 0.45 meters in diameter and 0.65 meters in length. Under conditions of minimal wind, a single BDSh bomb produces enough white smoke to cover an area of 40,000 square meters, or a square of 200 meters in width and length. The bomb burns and produces smoke for five to seven minutes. The obturating smoke only blocks light in the 400-750 nm wavelength range - the entire spectrum of visible light, encroaching on near infrared. This narrow range of obscured wavelengths is effective at shielding the tank from the naked eye and from white light searchlights, but it is completely ineffective against infrared searchlights like the AN/VSS-1 and AN/VSS-3A, which operate in the 785-1000 nm range. Needless to say, the fog is also completely ineffective at counteracting thermal imaging devices like the AN/VSG-2 Tank Thermal Sight (TTS) installed in the M60A3 (TTS), which operates in the 7,600-11,750 nm range. Smoke pours out of the circular opening on the surface of the cylindrical housing. The bomb is weighted so that the opening is always facing upwards even when floating in water, ensuring that a dependable flow of smoke is emitted. 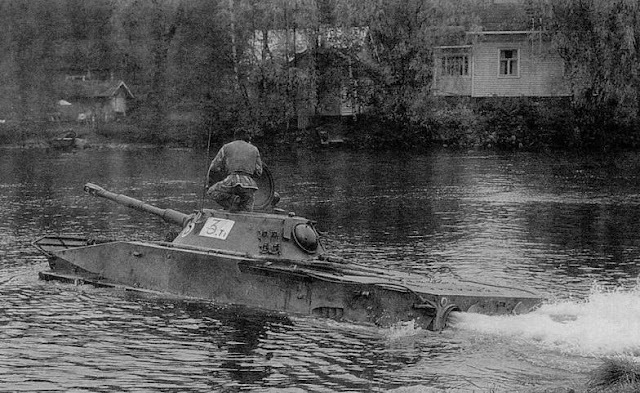 The ability to float makes BDSh-5 useful when advancing across rivers, as it enables the lead tank to create a smokescreen on a large section of the river to mask the crossing of the landing party as well as the massed forces waiting on the riverbank. After the BDSh-5 has been expended after five to seven minutes, the advance force of PT-76 tanks should be on the other side of the river, and the task of masking the construction of a pontoon bridge or some other type of bridge would be taken over by a specialized smoke generator. 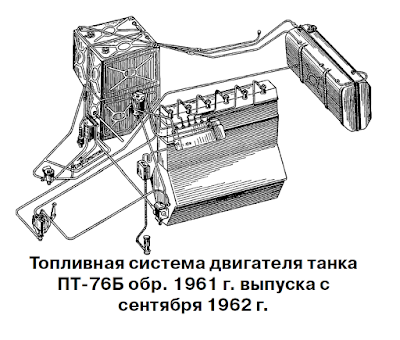 The PT-76 had a TDA smoke generating system installed since 1955. TDA stands for "Thermal Smoke Apparatus". A smokescreen is created by injecting diesel fuel into a special section of the exhaust manifold. The hot metal of the exhaust manifold evaporates the diesel instantly, turning it into a fine vapour. 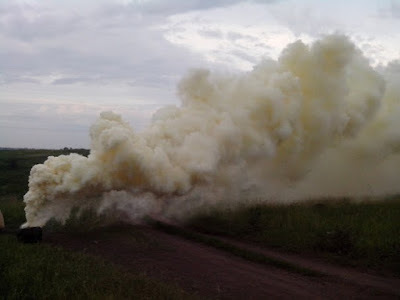 The smoke generated from the exhaust is actually a fog, as it is formed by the condensation of the hot diesel vapours as it comes into contact with the cool surrounding air. The fog only obturates light in the 400-760 nm wavelength range, so again, it is not effective at blocking infrared imaging devices. Nevertheless, it is useful for covering retreats as well as advances, and it is particularly useful for masking the advance of tank units across rivers. The TDA smokescreen generator is activated by the driver via a control box. When all of the hatches are closed, the only source of air in the fighting compartment comes from the ventilation fan embedded in the back of the turret. The dome-shaped ventilator is located at the very rear of the turret, giving the gunner and loader choice airflow. The fan is protected by a frying pan-shaped armoured cover of the same thickness as the armour plating of the rear of the turret. This ventilator provided no protection from NBC contamination whatsoever. The PT-76 lacked protection from nuclear, biological and chemical attacks, but this situation was alleviated in the PT-76B. The PT-76B featured a nuclear protection system, referred to as "PAZ", which literally translates to "Anti-Nuclear Protection" (Противоатомная Защита). 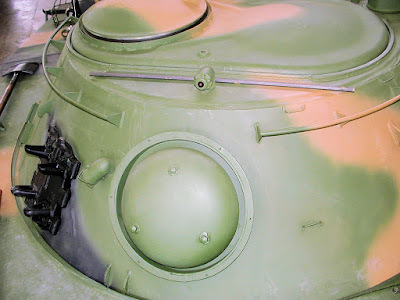 The ventilator fan at the back of the turret was replaced with a new type, but unlike most other tanks in the Red Army at the time, it was not directly replaced with a ventilation system that was capable of creating an overpressure inside the fighting compartment, like the T-54 which had its original ventilator removed entirely. 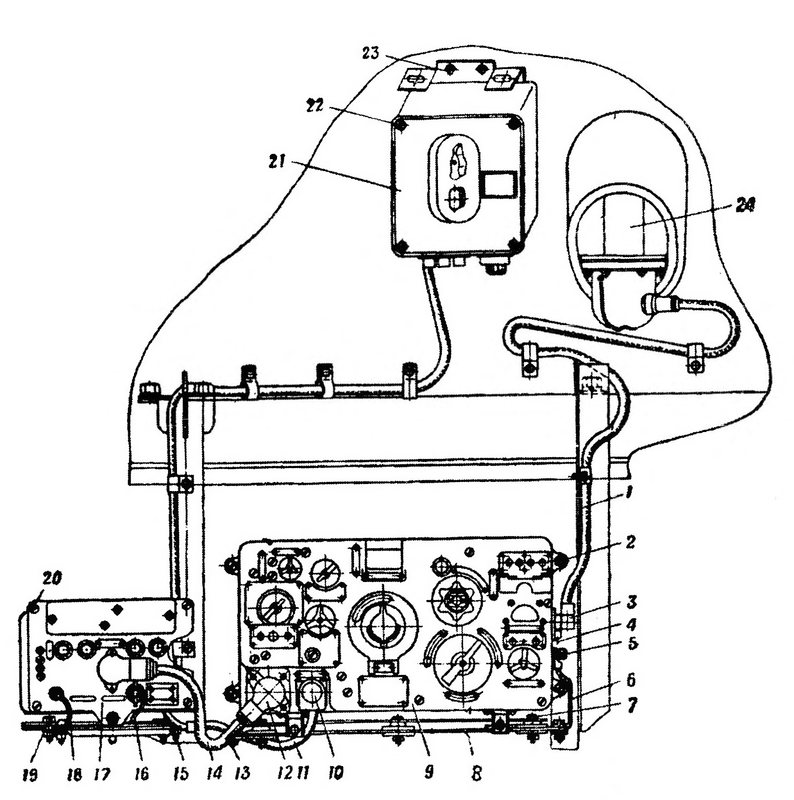 The new ventilator had an automatic self-sealing mechanism to prevent radioactive dust from entering via the air inlet. Other than that, it only had a simple electrical fan. As you can see in the photo below, the appearance of the new ventilator from inside the tank is clearly different from the older type. Credit for the photo goes to Claude Balmefrezol from Maquetland.com. Externally, the new ventilator can be distinguished from the older type by the rounded dome-shaped armoured cover, the widened collar around the armoured cover and the presence of three bolts jutting out of the surface of the cover. A cross section of the automatic sealing mechanism is shown in the diagram below. A supercharger was installed in the hull, next to the driver. It had its own air inlet and filtration system, separate from the engine air intake and the ventilator air inlet. When it is activated, an overpressure is produced inside the tank, preventing the ingress of irradiated particles as well as chemical and biological threats. Air enters through a circular inlet with a mesh screen, and the cyclone filter inside the supercharger ejects dust and other contaminants through an small slit next to the inlet. However, the system does not offer comprehensive NBC protection as it lacks the sensors needed to detect the presence of chemical and biological agents in the atmosphere, so the crew is not automatically alerted of a threat, even if the system is technically capable of repelling such attacks. The only case where self-protection from such threats is plausible is when a PT-76 company or platoon commander is alerted of a threat by spotting the contamination flags dropped by preceding NBC reconnaissance units, typically mounted on the BRDM-1RKh or the BTR-40RKh (shown below). Then, he would be able to command his company or platoon to manually engage their defences. The overpressure system protects the crew from nuclear fallout and biological and chemical contamination, but there is no real protection from radiation. On its own, the steel body of the tank is more than enough to stop ionizing radiation (alpha, beta rays) and reduce gamma radiation transmission from fallout by some amount, but gamma radiation and neutrons from the initial radiation burst of a nuclear explosion can easily pass through the thin steel walls. No anti-radiation lining was installed on the PT-76 during its time in service. 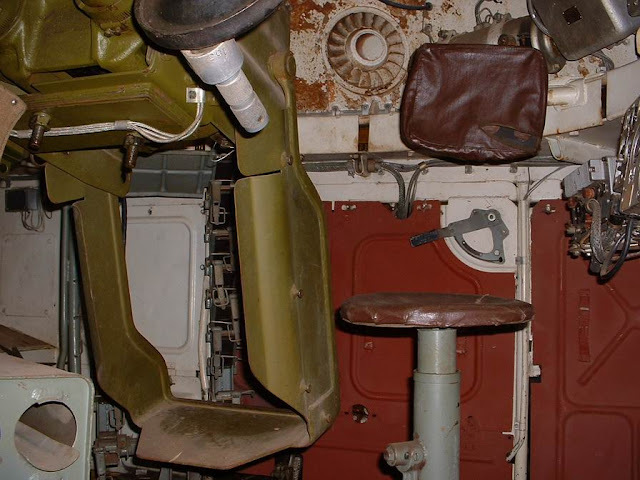 In order to sense a nuclear detonation and detect the presence of nuclear fallout, a DP-3B gamma radiation detector (roentgenometer) was installed on the left wall of the driver's station. 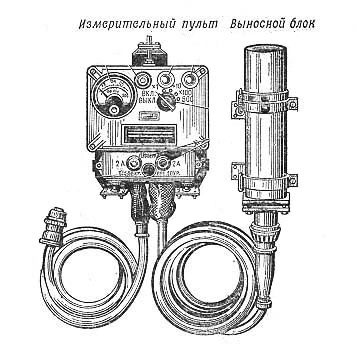 The DP-3 radiation detector was a very common device for Soviet vehicles of the era, from helicopters to tanks to NBC reconnaissance vehicles like the BRDM-1RKh. The DP-3B is the tank version. The unit comprises an analogue control box and readout display, complete with an ion chamber (mounted on the lower glacis of the tank next to the left idler wheel). The use of an ion chamber instead of a Geiger-Muller tube means that the device is rather less sensitive, hence the need to place the ion chamber in an unusually low position in the hull - to detect radiation from the soil. The range of measurement of DP-3B is from 0.1-500 roentgens/hour. The system depends on the penetration of gamma radiation into the tank to detect the detonation of a nuclear device before the blast wave reaches the tank, so that the system is able to activate the countermeasures before the irradiated wind arrives. The "Rosa" fire fighting system was installed in the PT-76B obr. 1959 model is a relatively sophisticated system borrowed directly from the T-55. It has a maximum response time of 50 milliseconds upon detection of a fire. The system can operate in the semi-automatic or the automatic mode, as determined by the driver. When operating in the semi-automatic mode, "Rosa" alerts the driver with an audio signal and a flashing light at the instant that a fire is detected in the engine compartment. The driver has the option to ignore the alert, of course, but he is obligated to immediately discharge the fire extinguishers. The driver can manually activate the fire extinguishers wired to the automatic firefighting system from a red control panel to his right. There is also an additional two OU-2 manually operated carbon dioxide fire extinguishers stowed next to the driver's left foot. These two fire extinguishers will be the only means of eliminating a fire in the fighting compartment. In the 'automatic' mode, "Rosa" alerts the driver of the source of the fire upon detection and immediately closes the radiator louvers, shuts off the engine and cuts off the engine air intake system. Then, the fire extinguishers are activated and the entire compartment is flooded with the extinguishing agent. Two cylinders of fire extinguishing agent are connected to the system, providing a maximum of two doses of fire extinguishing agent to flood the engine compartment and hopefully extinguish the flame. "Rosa" employs a halocarbon fire extinguishing agent known under the designation "3.5": a pressurized combination of ethyl bromide and carbon dioxide. The mixture is very effective, but also highly poisonous and carcinogenic, limiting its use to the engine compartment. The system relies on four TD-1 heat sensors to detect a local rise in temperature to at least 180°C, after which the system will react. The four TD-1 heat sensors are arranged so that a fire from any part of the engine compartment will be detected by at least one of the sensors. The covered areas include the fuel tank and oil container in the right sponson, the gearbox and final drives at very back, the oil cooler on the deck, and the engine itself. The TD-1 heat sensor uses an array of fifteen thermocouples wired in series to detect changes in ambient temperature. The reaction time of the sensor does not exceed 10 seconds, meaning that it takes a maximum of 10 seconds between detecting the fire to the activation of the fire extinguishing system. The sensors do not guarantee reliable detection of fires in the 60°C to 150°C range of temperature differences due to insufficient contrast, so the fire needs to be close to the sensor. Still, this is much better than the earlier bimetallic sensors employed in early firefighting systems developed during and immediately after WWII. A TD-1 thermal sensor is shown below. The control box for the system is mounted to the "roof" of the driver's station, which is the upper glacis plate. 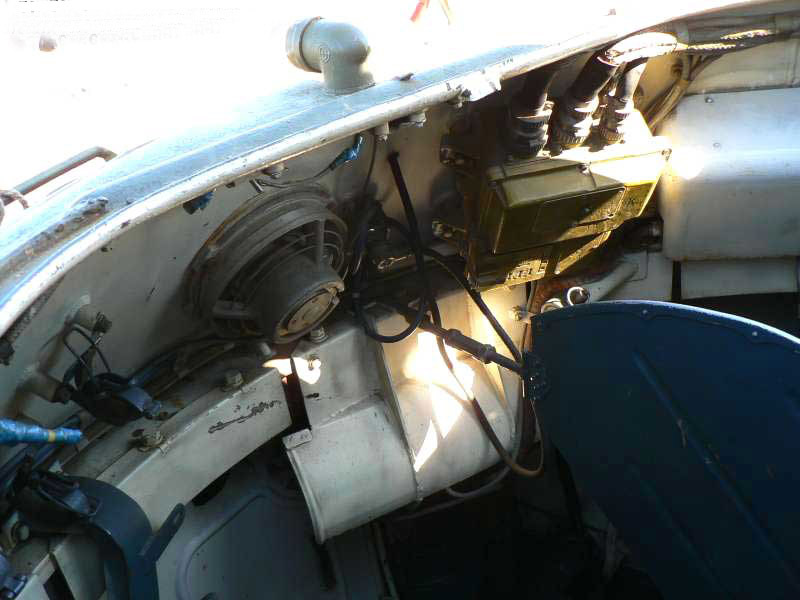 An emergency switch to shut off the engine is placed on the roof next to the driver's GPK-48/59 gyrocompass. Unlike most light tanks, the PT-76 is not particularly quick or nimble. Its primary attraction is its ability to swim. Its mobility characteristics are comparable to the T-54 medium tank for the most part, but its low speed was found to be problematic for a tank that is usually tasked for reconnaissance duties. By the late 1950's, it had become clear that the PT-76 was no longer sufficient for the various roles that it was assigned, partly due to its insufficient weaponry, but mostly due to its low speed compared to the T-55, which had been recently upgraded with a more powerful engine. The need for an upgrade was recognized in just a few short years after the adoption of the PT-76 was formalized in 1952, catalyzing the development of various replacements in the late 50's and early 60's, none of which succeeded in replacing the PT-76 for a variety of reasons. 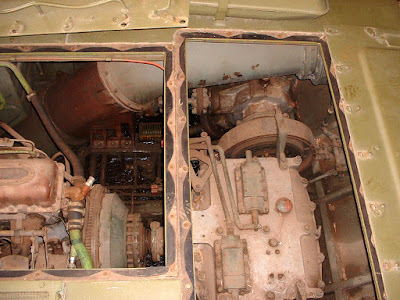 As such, the PT-76 fulfilled its service in the Russian army with the original engine. The PT-76 is powered by the V-6 diesel engine, putting out 240 hp at 1800 RPM. The name of the engine can be confusing as it is not a V-shaped six-cylinder engine, but actually an inline-six 19.1 liter engine with six vertical cylinders arranged in a row. 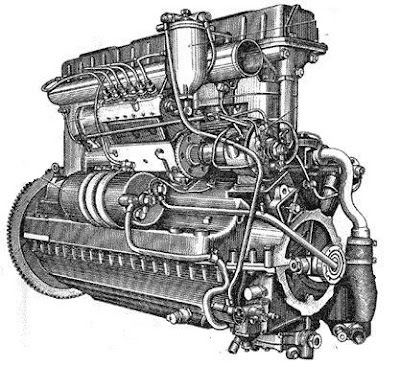 The V-6 was created by halving the legendary V-2 engine, so there is a great deal of parts interchangeability between the two engines, and the manufacturing of the V-6 was greatly simplified. Like the V-2, the piston diameter in the V-6 is 150mm, with a stroke of 180mm. The creation of the V-6 came from the need for a relatively simple engine for light vehicles with good dynamic characteristics. The decision to create an inline six-cylinder engine was justified by the inherently good balance of this type of engine, making it exceptionally smooth at the operating rev speeds of 1600-1800 rpm, although some vibration can still occur at the idle speed of 500 rpm. The power density of the engine is not particularly high, given that its dry weight is 825 kg and its maximum output is only 179 kW, but it is good enough for an engine of its technological level. Compared to something like the 14.7-liter six-cylinder Continental AOS-895-3 supercharged gasoline boxer engine, the V-6 is rather large and underpowered. The V-6 has a service life of 250 hours. The engine can be started electrically or with compressed air supplied by two compressed air tanks placed on the left side of the driver's station. In October 1964, the updated V-6B engine for the PT-76B began to be manufactured in mass quantities and was implemented in new production PT-76B tanks in November. The main differences were in the lubrication system, main friction clutch and in the new 6.5 kW G-6.5S generator, replacing the 1.5 kW G-73 generator. The substantially more powerful generator was needed for supplying power to the new two-plane stabilizer system and other electrical equipment. The external appearance of the V-6 is depicted in the drawings below. 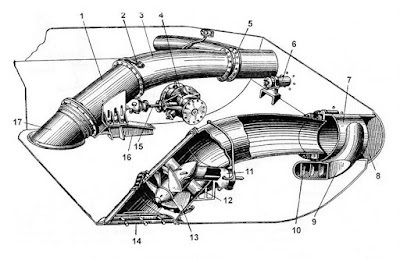 The drawing on the left shows the fuel pump, oil pump, electrical tachometer, the air distribution system for the six cylinders (for pneumatic starting in cold weather), and other assorted essentials. The drawing on the right gives us a good view of the ST-721 electric starter interfacing with the teeth of the flywheel. Behind it is the G-73 direct current generator that supplies electrical power to the tank and charges the lead-acid accumulators. The gross output of the V-6(B) is 240 hp, but the net output is only around 190 hp. Taking into account the light weight of the new light tank, it was decided that a simple clutch-and-brake steering system would suffice. 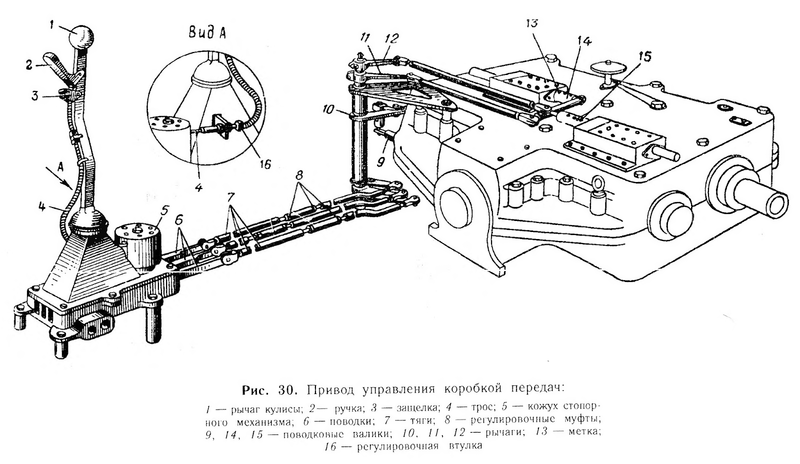 During the development of the PT-76, it was suggested that the tank should use the transmission and steering system of the T-34, as that was readily available and very simple to manufacture as the tooling still existed. 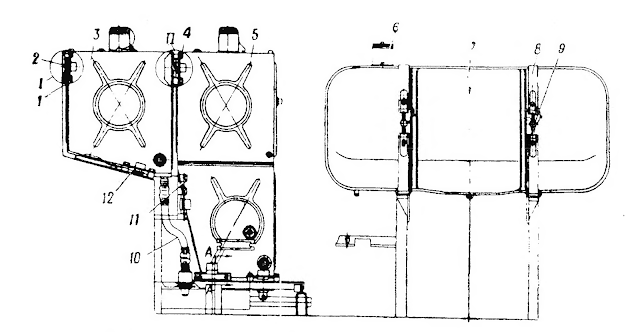 Early prototypes of the Object 740 had this transmission installed, but it was found to be unsuitable in the long term, partially because the design of the transmission was fundamentally obsolete and partially because the tank needed a more complex transmission to transfer power to its waterjets, its mechanical bilge pump and the tracks at the same time. For this purpose, a completely new transmission with a clutch-and-brake steering system was developed for the PT-76. The gearbox sits at the back of the engine compartment on the same axis as the engine. It receives power from the engine driveshaft and distributes it through the two friction clutches attached on either side of the gearbox. The side friction clutches connect to a pair of reduction gearboxes on either side, meant for transferring power to the tank's dual waterjets and bilge pumps, but the reduction gearboxes do not interact with the driveshafts until the driver engages it in preparation for swimming, so the driveshafts effectively transfer power directly to the final drives. Shifting the gears is done with a system of mechanical rods. A kinematic diagram of the powertrain is available below. Note the power takeoff mechanism from the final drives to the waterjet impeller. When operating the PT-76 in water, the driver steers with the steering levers as usual, and he controls the speed of the tank with the accelerator pedal and by shifting gears. 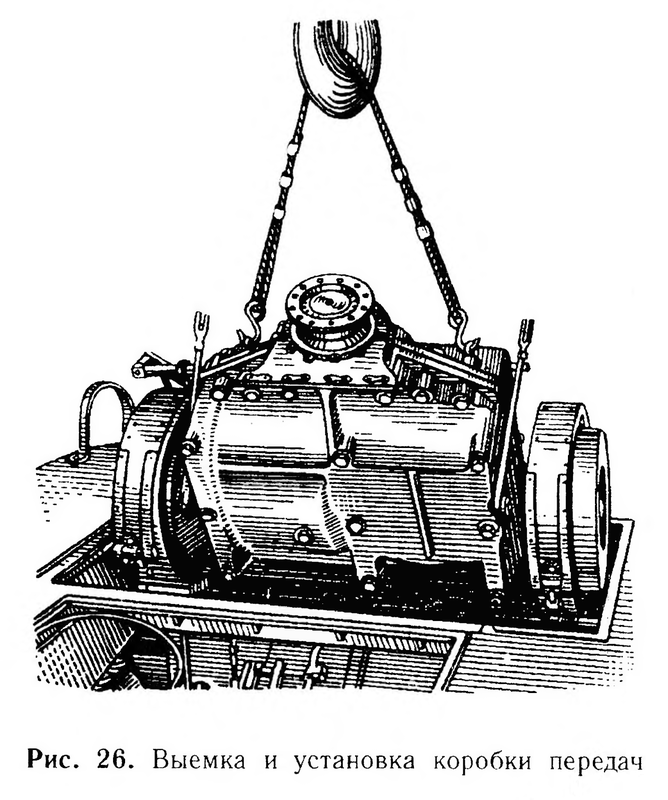 Removing the transmission first requires that the gearbox is disconnected from the driveshaft and the reducer gearboxes. This is quite time consuming, but not more inconvenient than in any other Soviet tank. The water jet ducts do not interfere with the removal of the gearbox, which can be done with a common engine hoist. 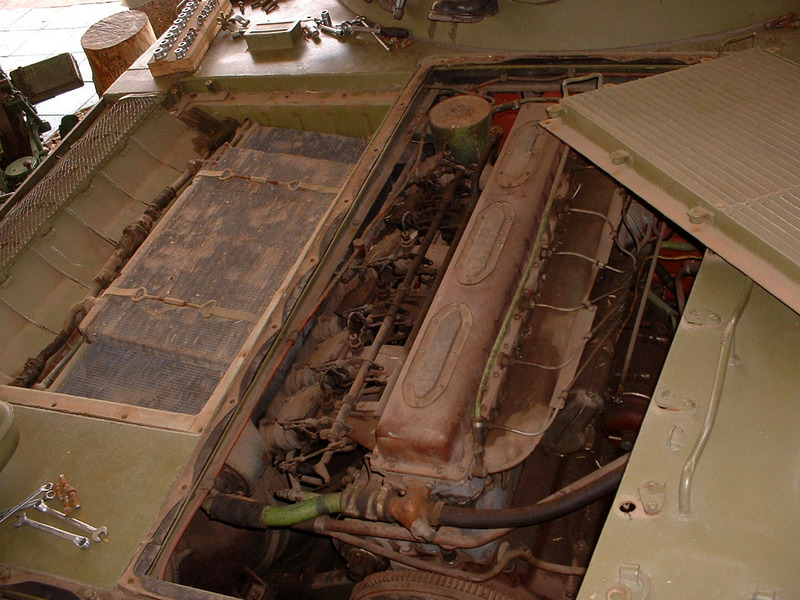 Although removing the engine and transmission is relatively straightforward, the lack of a direct coupling between the transmission and the engine to create a single powerpack and the lack of a quick-disconnect between the components can be considered somewhat anachronistic, even if this was the standard configuration for the majority of Soviet armoured vehicles throughout the Cold War. The large engine deck and large access panels makes it easy to service and remove the engine and transmission compared to the M24 Chaffee and the AMX-13 series of light tanks, but it is inferior to the M41 Walker Bulldog by a large margin. The radiator is on the engine deck, to the left of the engine and next to the exhaust port. The oil cooler radiator pack is placed on top of the water radiator pack. The maximum permissible temperature of the water is 105°C and 110°C for the oil, beyond which the engine overheats. The lack of a supercharger or turbocharger on the V-6 and the large volume of the engine compartment means that the workload of the cooling system is not very high. The cooling system does not use a fan to draw air through the radiator to remove heat, but instead uses a novel pressure differential system. According to Bernoulli's principle, fluids such as air have a lower pressure when flowing at higher velocity compared to fluids flowing at lower velocity. 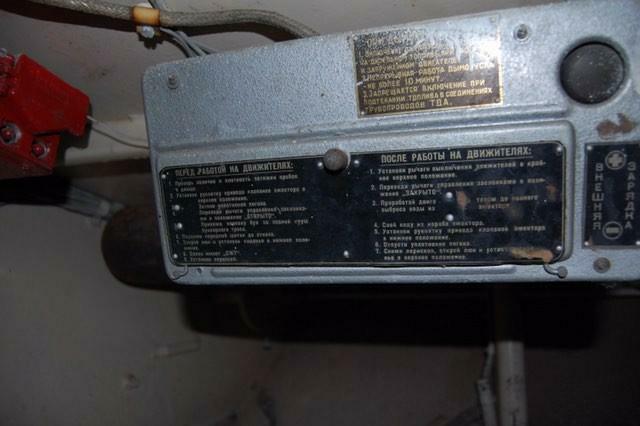 The difference in pressure creates a suction force, which is used in the cooling system of the PT-76 to draw cool air from above the radiator through the cooling tubes of the radiator pack and into the exhaust duct, where it is ejected out of the exhaust port. This cools the water and oil in the radiator and the exhaust gasses at the same time, making it a highly reliable compact system with literally no moving parts. 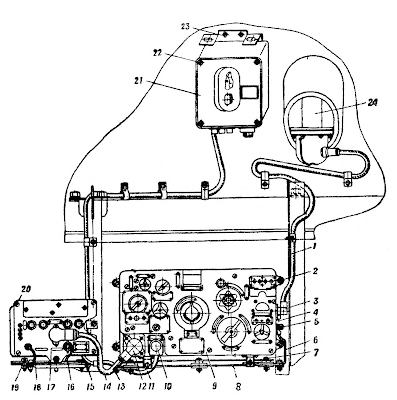 The system was also a part of the engine air respiration system. 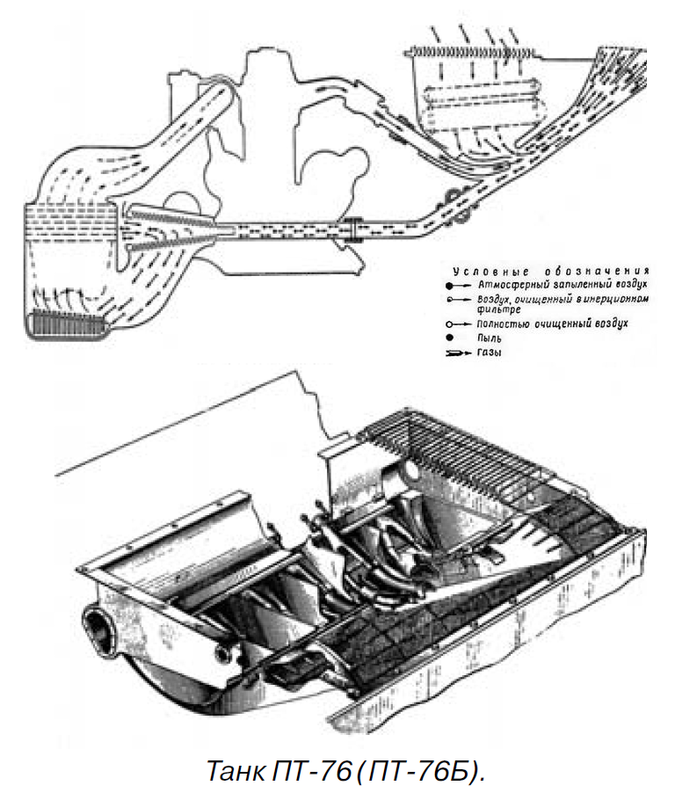 Similar cooling systems were used in the T-10 heavy tank and T-64 main battle tank and contributed to the compactness of their engine compartments, which allowed significant reductions in the mass of the tanks. The drawback of this type of cooling system is the limited cooling capacity - a problem that has plagued the T-64 since it entered service in 1968 until the present day. In fact, one of the most frequent complaints of T-64 during the Ukrainian civil war (on both sides) is that it overheats too quickly and too often. This is probably not a problem for the PT-76 as it uses a naturally aspirated engine, but it is difficult to be certain since there are practically no PT-76 tanks in service at the moment and it is an enormous challenge trying to find enough people who previously served in one to form a complete picture of the real state of affairs. The tank runs on six large diameter (670mm) hollow stamped metal roadwheels with rubber rims. There is a hydraulic shock absorber paired with a volute spring on the first and sixth roadwheels to improve the ride quality over rough terrain. 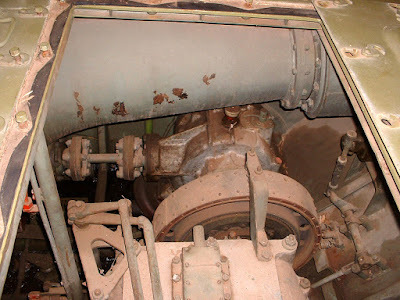 As was typical for post-war Soviet tanks, the wheels were sprung with torsion bars. The first models of the Object 740 prototype used high hardness steel for its torsion bars, but these were found to be unsuitable for the low weight of the tank as they vibrated very strongly when the tank traveled across rough terrain, so softer steel was used as a replacement. 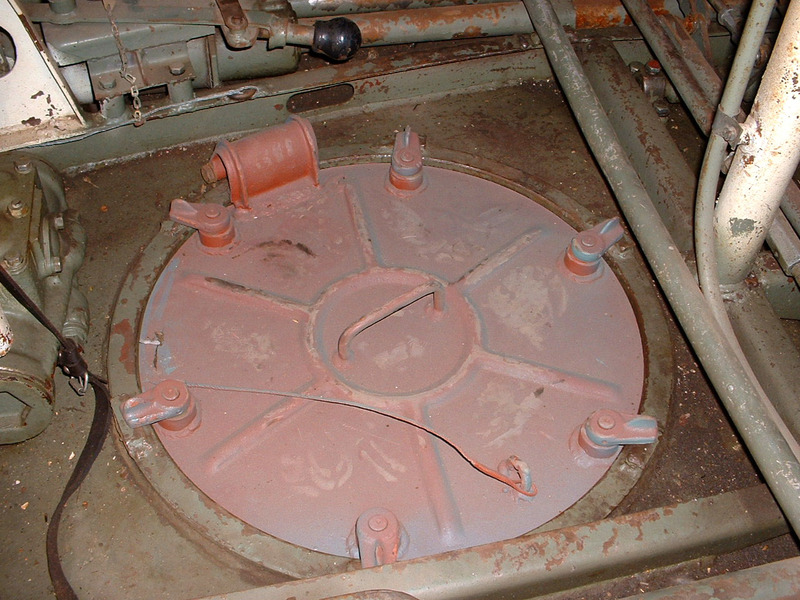 The roadwheels of earlier variants of the PT-76 were stamped from plain sheet steel and had a smooth surface (see photo above), but later on, a new roadwheel design with stamped radial reinforcement ribs was introduced as the new standard type for newly produced tanks and slowly replaced the older roadwheels over the next few decades as they wore out on older tanks. The roadwheels deserve special attention as they were the first of its type and led to the development of similar hollow wheels for a variety of vehicles used for a variety of purposes. 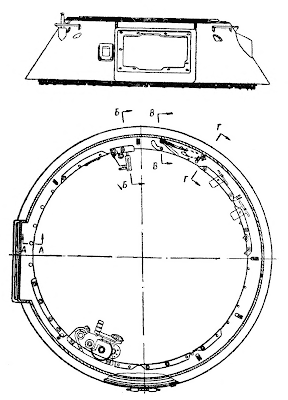 Being hollow and very lightweight, the wheels had positive buoyancy and contributed to the flotation of the tank. The all-metal tracks are of a single pin type, with a width of 360mm and pitch of 128mm. There are 96 links on each side. 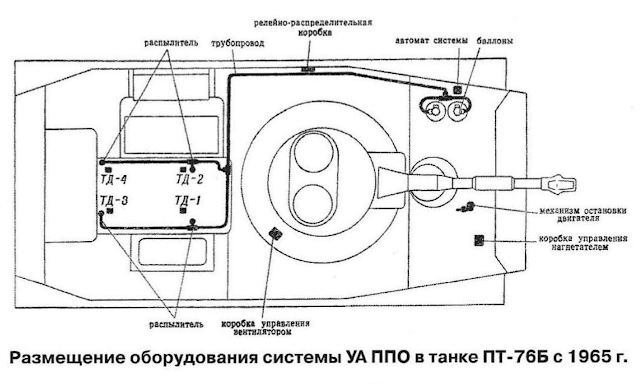 Like most other tracked vehicles produced in the USSR at the time, the tracks on the PT-76 are of an unsupported type. The PT-76 has superb flotation on soft ground, allowing it to be driven where most other tanks could not. Compared to its American rival the M41 Walker Bulldog, the PT-76 exerted around 36% less static ground pressure - 0.46 kg/sq.cm against 0.72 kg/sq.cm. This is helpful when travelling on soft snow and muddy terrain, but does not entirely solve the problem of low engine power and it does not take into account the differences in traction from the different track designs. Also, it may be more difficult to maneuver in waterlogged soil and swamps due to the clutch-and-brake steering system. Without regenerative steering, power is lost whenever the driver adjusts the direction of the tank or makes a turn. This may be negligible on paved roads, but can result in the loss of traction when driving on pliant terrain. Due to the simple technology and straightforward layout of the powertrain (thanks in no small part to the large volume of the engine compartment), regular maintenance is relatively painless. The only inconvenience is the bolted access panels on the engine deck, which are very large, but have to be completely unbolted to be opened and the panels lack hinges, so they must be lifted off the engine deck and placed somewhere else while maintenance is ongoing. There are four handles on the corners of the engine access panel and two handles the transmission access panel for this purpose. To the driver's immediate front is the instrument panel and his three periscopes. On his right, there is little of interest except for the two accumulators that are used in the tank's electrical system. The driver is provided with a single dome light, which is located beside the hatch opening mechanism and the firefighting system control box. The driver's controls can be seen in the photos below. 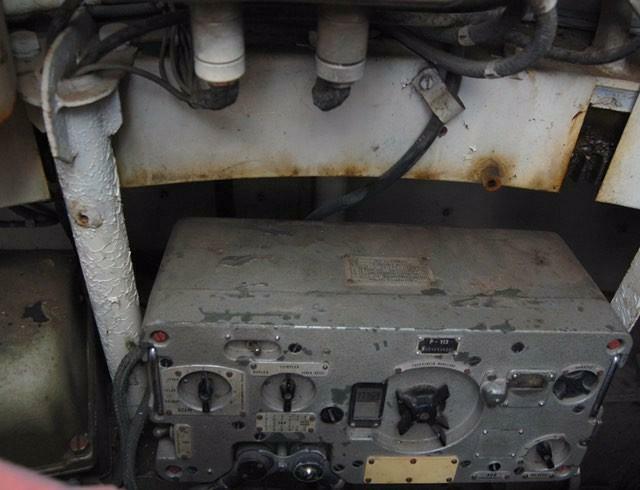 As you can see, the pedals and steering levers are not installed on the floor of the hull, but on the lower glacis plate. The driver's seat is placed on the floor of the hull, and positioned such that the driver's legs are raised above hip level when he rests his feet on the pedals. This is very apparent from the photo on the right. Reading the gauges on the instrument panel is not easy, but the driver can see out of the periscopes with relative ease without needing to lean forward too much. 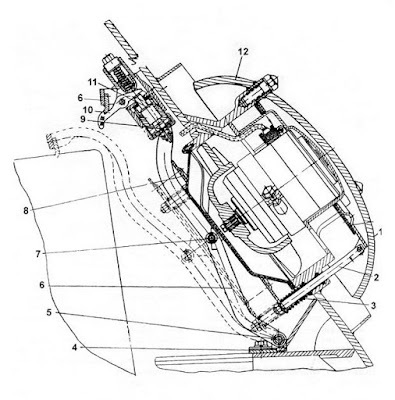 When the angle of the lower glacis plate was changed from 45 degrees to 55 degrees in 1962, the position of the driver's foot controls relative to the height of the seat was lowered accordingly, so that the driver's feet would be at around hip level when resting on the pedals. This would definitely have been more comfortable than before. In 1958, a GPK-48 gyrocompass was installed for basic inertial navigation. This was quickly replaced with a GPK-59 gyrocompass on the PT-76B in 1959. Combined with a map, the gyrocompass gave the tank a reliable method of navigation between waypoints. There is a circular escape hatch installed in the floor of the hull, to the left of the driver's seat. It is around the same size as the driver's hatch, meaning that it is unusually large compared to the escape hatches on typical Soviet medium and heavy tanks as well as foreign tanks. This was probably influenced by the much more lenient requirements for the belly protection of the PT-76. Exceptional waterborne mobility was the PT-76's defining feature. 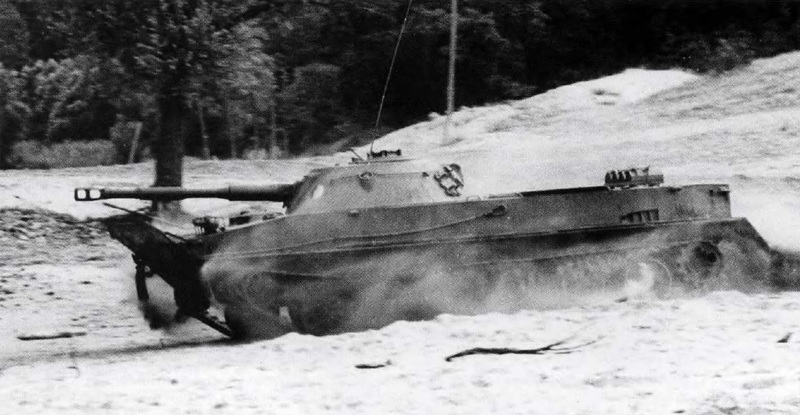 While other light tanks were similarly equipped with high-powered guns, many of them much more powerful than the D-56T, the PT-76 was the only tank of its type that was completely amphibious. It was also the first vehicle of its kind to use water jets for waterborne propulsion, rather than screw propellers. The PT-76's amphibious nature made it irreplaceable when conducting ship-to-shore landings, and gave unique opportunities to conduct tactical maneuvers across large rivers. Executed properly with air support, artillery barrages and quick hands, the presence of PT-76 tanks in a tank division can help reduce the loss of strategic momentum from water obstacles, and even offers an extra layer of tactical opportunities. 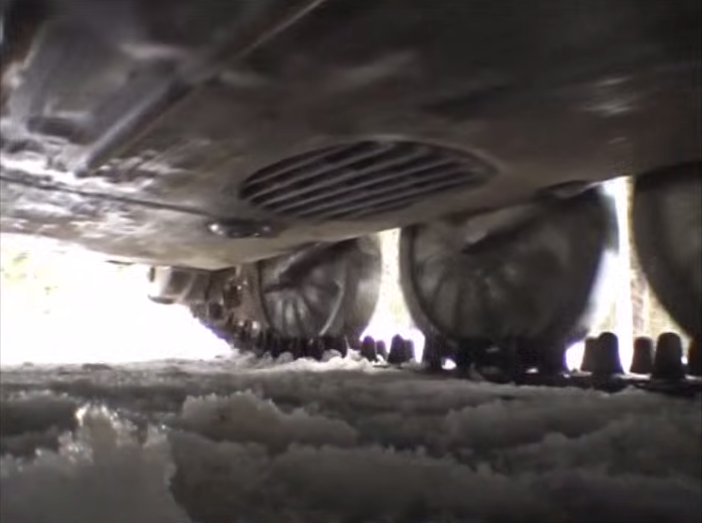 Two water inlets are located on the underside of the engine compartment behind the second-last roadwheel on either side of the hull. Water passes through an intake screen designed to prevent large debris from entering the waterjet and damaging the pump. The pump inside the waterjet duct has an impeller driven by the engine, which pulls water in and throws it out of the rear ports. The impeller blades have a diameter of 340mm. Stator hydrofoils are placed behind the impeller to eliminate the rotational momentum, and the waterjet duct narrows into a choke near the outlets. This creates a steady jet of high velocity water with an efficient linear flow, as opposed to a disturbed flow that dissipates quickly after leaving the outlet. 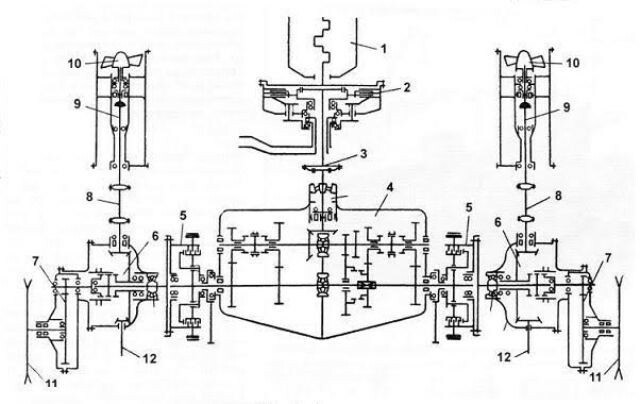 As mentioned before, steering is accomplished by pulling either the left or right steering levers which shuts the cover on the outlet on the same side as the lever and cuts power to the pump, causing the vehicle to pivot from the thrust of the single remaining waterjet. It is possible to reverse the tank in the water by shifting to the reverse gear, which closes off both covers without cutting power to the two water pumps and simultaneously opening the two forward-facing outlets, thereby directing the flow of water through the forwards-facing outlets only. The waterjets are each powered by the engine via a driveshaft from a special reducer gear attached to the gearbox. During tests with the Object 728 special emulation vehicle, the waterjets of the PT-76 were found to produce a traction force of 82 kgf in the first gear, 900 kgf in the second gear and 1650 kgf in the third gear. 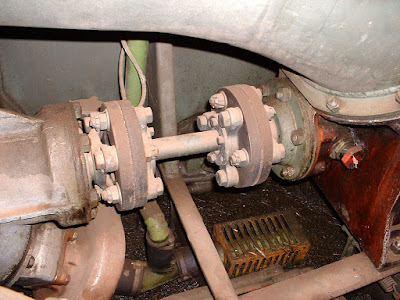 The driveshaft and reducer gearbox are shown in the two photos below (credit to Stephen Tegner from the scalenews.de walkaround page). The opening and closing of the trim vane is carried out by an electric motor but a manual hand crank is also available. One of the primary considerations in the design of the shape of the hull was that it needed to be stable during every stage in the process of crossing water obstacles. 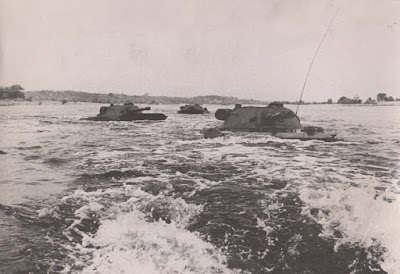 The tank had to remain stable as it entered the water, whether it be from a riverbank or from the bow ramp of an assault landing ship, and then it needed to resist pitching and rolling by strong currents and waves while swimming. The hull also had to be sturdy and stable enough that the recoil of the cannon could be completely absorbed by the water through the walls of the hull, as the recoil force could not be transferred to the suspension since it was not touching solid ground. 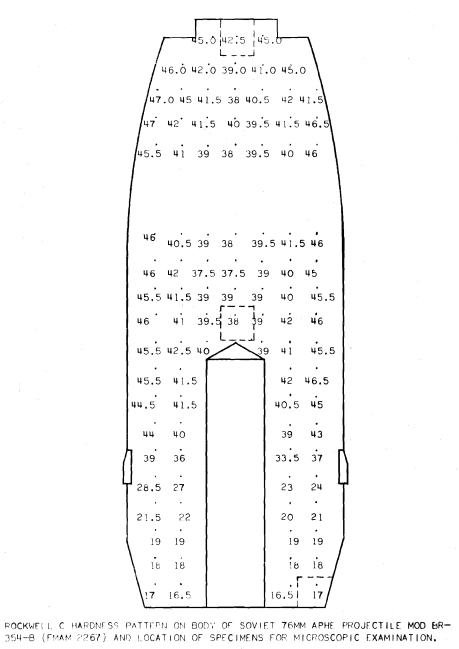 This was largely determined by the amount of surplus buoyancy provided by the design of the hull. 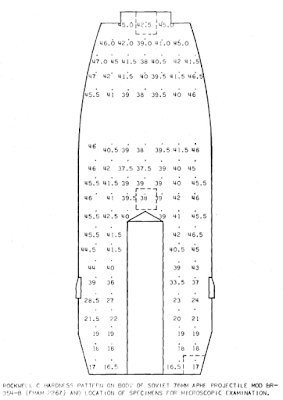 One of the design considerations was that the buoyancy distribution of the hull had to be shifted slightly rearward so that the thrust from the waterjets would not tip the tank nose-down into the water. This is why the PT-76 appears tail-heavy when afloat. The large internal volume of the vehicle meant that it had a lot of surplus buoyancy, but it came with the cost of thin armour and a large silhouette. The tank could probably have been made much smaller and it would still be able to float and swim safely, as proven by the more heavily armoured BMP-1 and BMP-2, but the requirement for such a large amount of surplus buoyancy was not arbitrary. It gave the PT-76 a serious seafaring capability as well as the ability to carry some cargo. Even when fully loaded for combat, the tank has a 26% surplus buoyancy, equal to 3.6 cubic meters of displaced water, or 3.6 tons. As a result, the PT-76 is extremely difficult to sink even when travelling through choppy waters, or when it is laden with a large amount of extra cargo, up to 1.8 tons or more. Because of this, the PT-76 is often used to ferry troops across rivers when an amphibious armoured personnel carrier is not available, or if pontoon bridges have not yet been established. 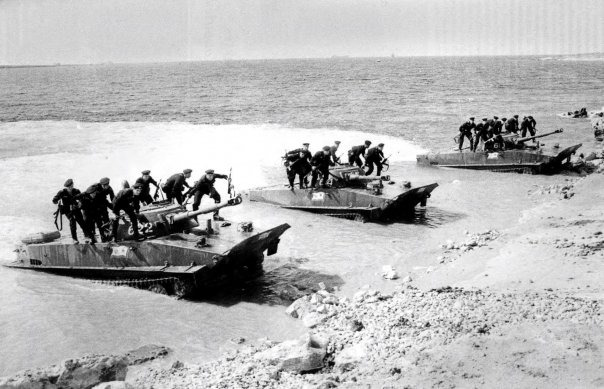 One of the requirements drawn up by the Ministry of Transport Engineering was that the new amphibious light tank needed to be able to temporarily transport a landing force of 20 men across water obstacles, while the armoured personnel carrier variant based on the amphibious light tank had to be able to transport 25 men across water obstacles as well as on marches. The objective was to ensure that an infantry regiment could be landed on the opposite bank of a river with tank support and a full complement of heavy weapons, thereby improving the chances of successfully defending and holding the riverbank until the main force can cross. Infantry could also be ferried in this manner during ship-to-shore landings, but this was rarely practiced. The photo below shows three PT-76 tanks belonging to the Naval Infantry, each transporting six "black berets" - Soviet Marines. The PT-76 has two internal fuel tanks clustered on the right side of the engine compartment. The fuel is split between a large tank holding 150 liters and a smaller tank in the hull sponson holding 100 liters, for a sum total of 250 liters. 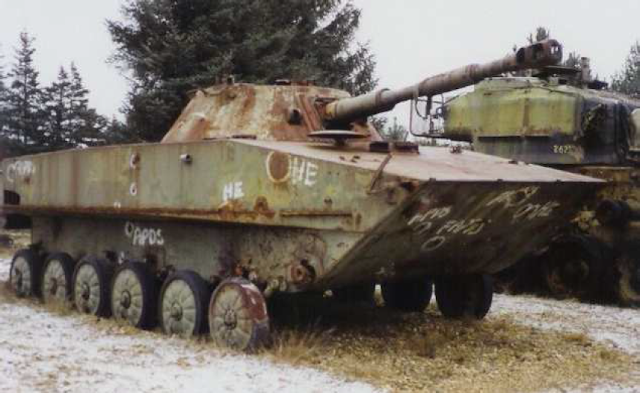 This afforded the PT-76 a cruising range of 370-400 km on paved roads, or about half that off-road. 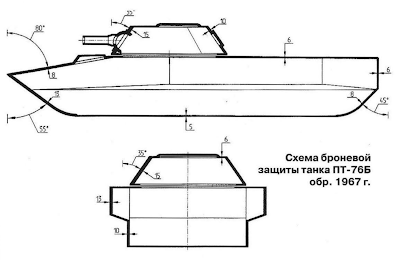 The PT-76B featured a third internal fuel tank (shown in the drawing below) that could hold 140 liters of fuel, increasing the total fuel capacity to 390 liters, granting the PT-76B a cruising range of 480 km on paved roads. This was superior to what most foreign designs of the same role could achieve. For instance, the M41 Walker Bulldog with its high performance 500 hp gasoline engine had a cruising range of only 120 km on roads (corroborated by a Belgian ex-tanker who served on one between 1967 and 1969), but on off-road expeditions, that range could be cut down to only 40 kilometers or so, equivalent to just a few hours of idling and little actual driving. 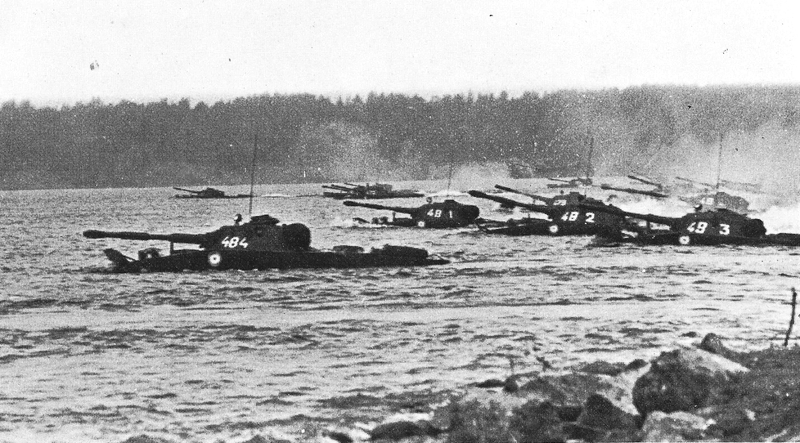 This was important for the PT-76 tanks in Naval Infantry tank battalions, as they was obligated to establish hold a beachhead during amphibious landings with limited logistical support, but it was even more important for the PT-76 tanks in reconnaissance companies, as they had to be inserted ahead of the main landing force and move some distance inland to conduct surveillance. The long travelling range was also crucial for the tanks used in the reconnaissance battalion of tank and motorized rifle divisions as they not only had to march ahead of the tank or motorized rifle regiment, but also patrol far forward of the vanguard in order to carry out their reconnaissance duties. To grant the PT-76 an even greater range of travel, additional fuel drums were added during various modernization efforts throughout the latter half of the 50's. 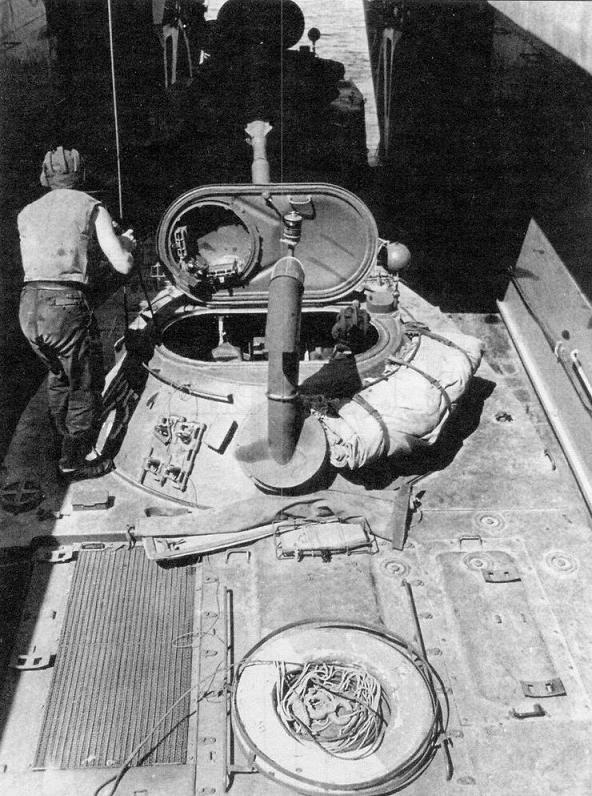 Early on, external fuel drums borrowed from the T-34 were mounted on brackets on the engine deck of the PT-76. These fuel drums each have a capacity of 90 liters, and thus increased the total fuel capacity of the PT-76 to 430 liters, boosting the cruising range of the tank to 480-510 km. Later, the flat rectangular external fuel tanks mounted on the fenders of the T-54 were transplanted over to the PT-76 and the PT-76B. These fuel tanks each have a capacity of 95 liters, and increased the total fuel capacity of the PT-76B to 580 liters, increasing the cruising range to 590 km. The advantage of these flat tanks was not the additional 5 liters of fuel, but the flatness that allowed the gun to traverse more easily to face the rear. 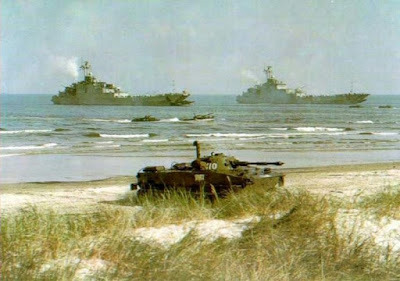 On the water, the PT-76 and PT-76B have a fuel endurance of 100 km and 120 km respectively, although the tank would never have the chance to actually travel such distances in real situations. I must say that I was eager to see the next post after seeing that Google Plus post about the APCR shot. Another quality post about a vehicle that seldom gets any sort of detailed analysis. I must also say that I am happy to see the other articles constantly getting updated too. Always great to see new information. So great work from you and pictures from Sean. Thanks for the kind praise. As you said, the PT-76 doesn't get much detailed analysis in English media, but it definitely seems like not many people want to read about obscure stuff like this. The traffic data doesn't lie! 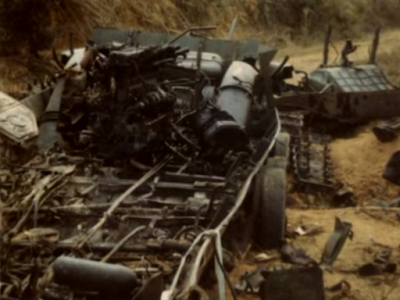 Ah, so it looks like the NVA failed combined arms 101 at Lang Vei and Ben Het. They still overran Lang Vei and inflicted 2.07 to one causalities in their favor. Ben Het though, looks like they failed to reconnoiter the approach route with sappers, failed to lay a thick smoke barrage, and failed to zero in on the Pattons with their heavy weapons, despite knowing their positions. So good to see this blog active again! Another high quality article, as usual! Just a little comment: I've driven a GSP-55, which uses the PT-76's drive components. While it is indeed underpowered, it has insane offroad capabilities! Water obstacles, deep mud, steep slopes are nothing for these. I gueess the same applies to the PT-76 too. The negative side is that steering is quite tiring thanks to the nature of the clutch-brake system. Hello man , need ta ask , did he armor combination in the T-90 A turret change or is it the same as the T-90 ? Also , ive been seeing people bashing the T90 and T72B armor saying they had primitive armor composition and mediocre protection , how true is that? Thank you and keep up the very good work. I have no idea what's in the T-90A's turret armour except that it follows the same layout as the T-72B. There's evidence that it's just a T-72B turret except that it is made from welded rolled plates instead of castings, but I don't know enough to make any conclusions. In short, I can't say that the armour of the T-72B is primitive or mediocre, but I also can't claim the opposite. I can only say that it fulfilled its purpose perfectly well. BTW next time you want to ask a direct question, please post it on the Home page or email me directly. I would prefer that all articles have comments that are only directly related to the topic, for the convenience of other readers. Excellent article on an oft-neglected vehicle. Thanks! I take it that the stringent weight requirements also influenced the decision to have the commander double as the gunner? It certainly sounds plausible but I can't really comment on whether that was the justification used by the design team. thank you for new posts! What is the diameter of the PT-76 turret ring?